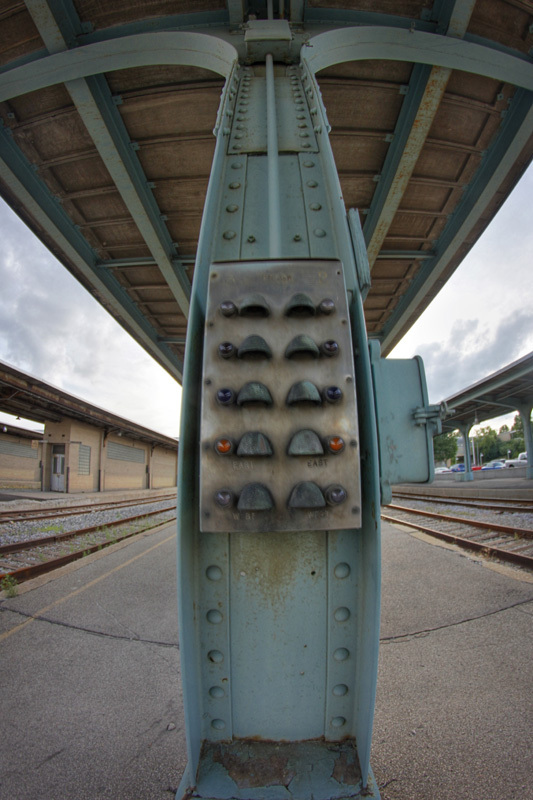 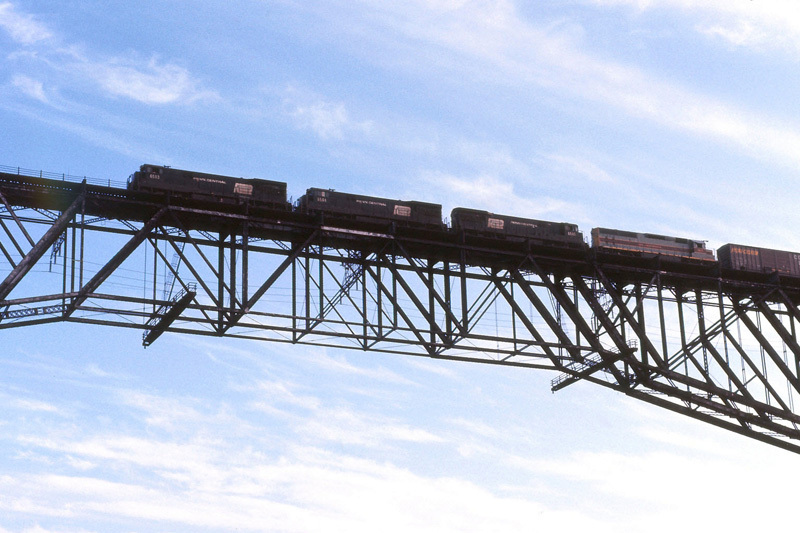 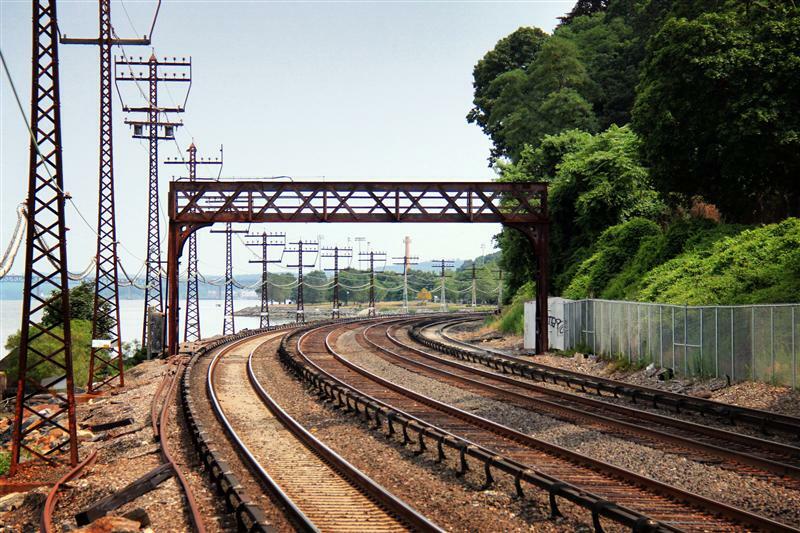 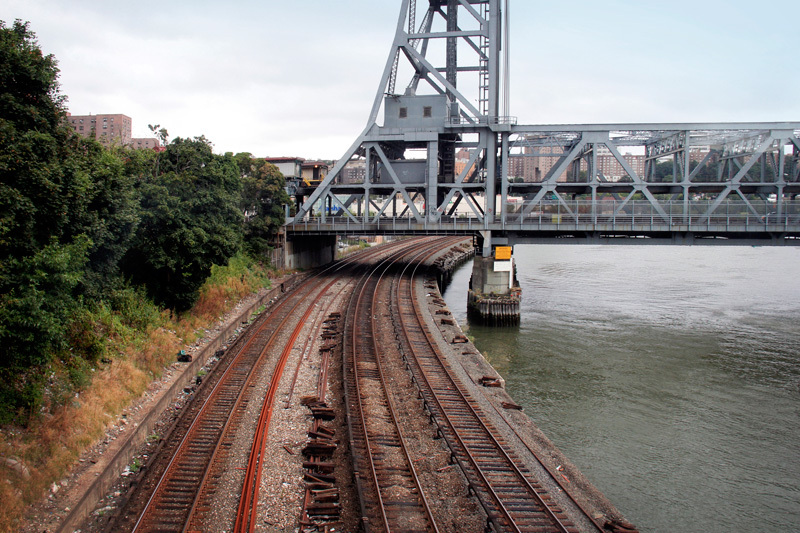 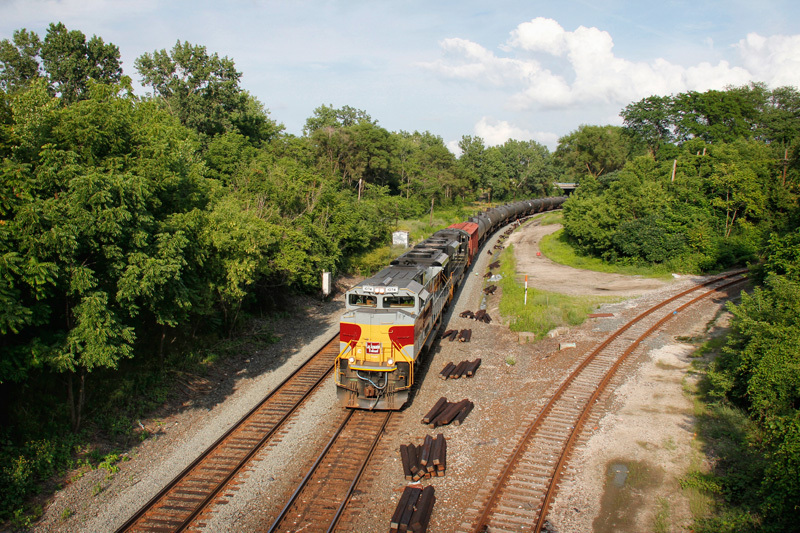 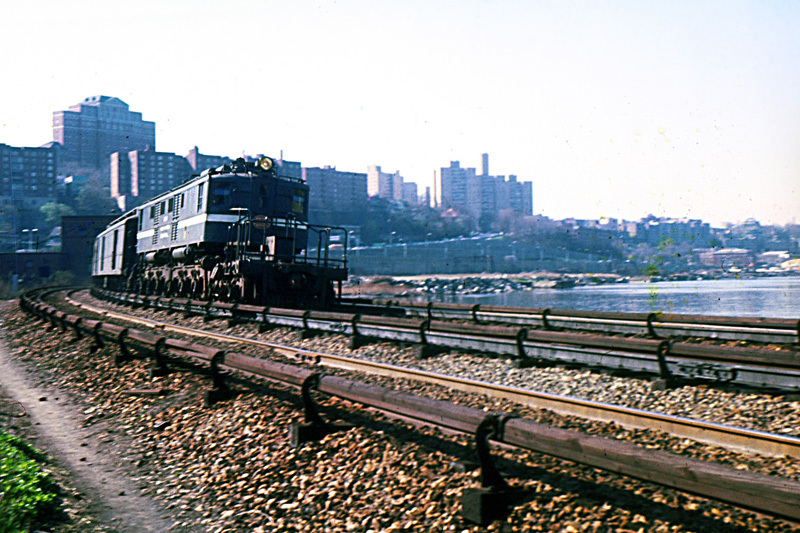 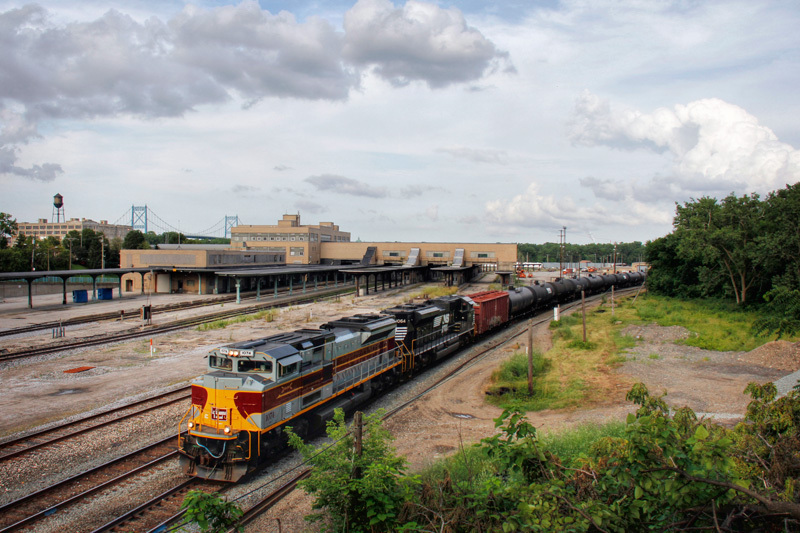 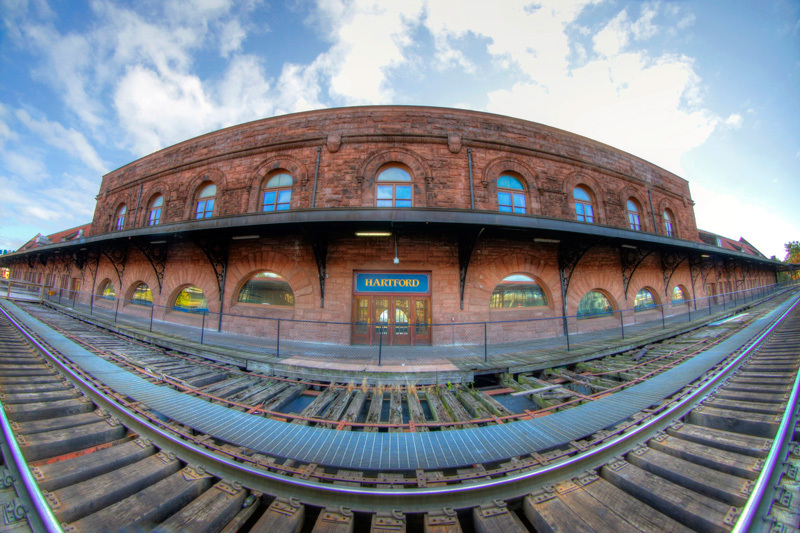 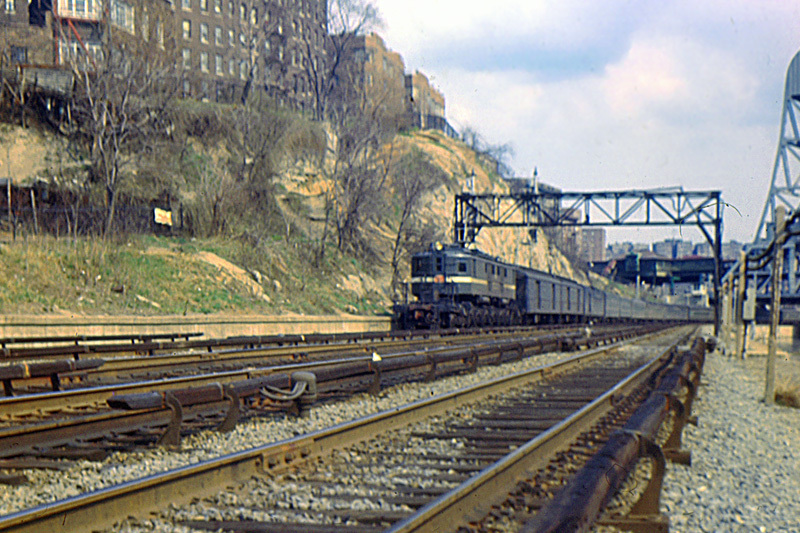 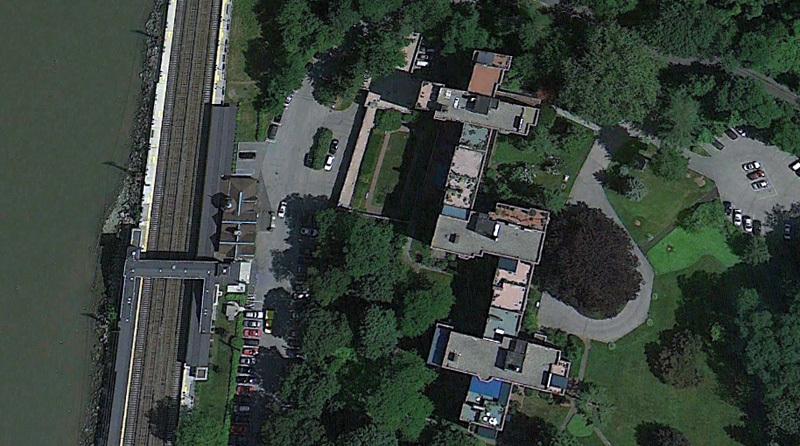 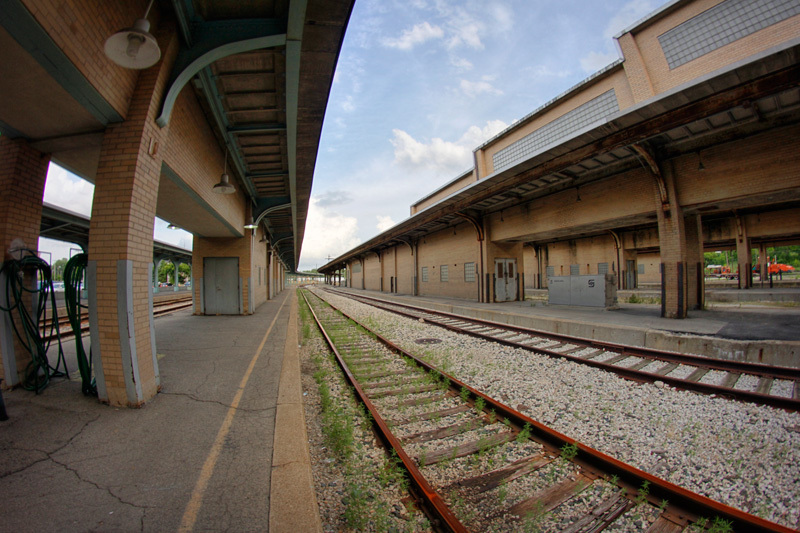 If you’re a frequent viewer of this site, then the subject of today’s Trains & Modern Photography post is something you’re probably familiar with – panoramas. 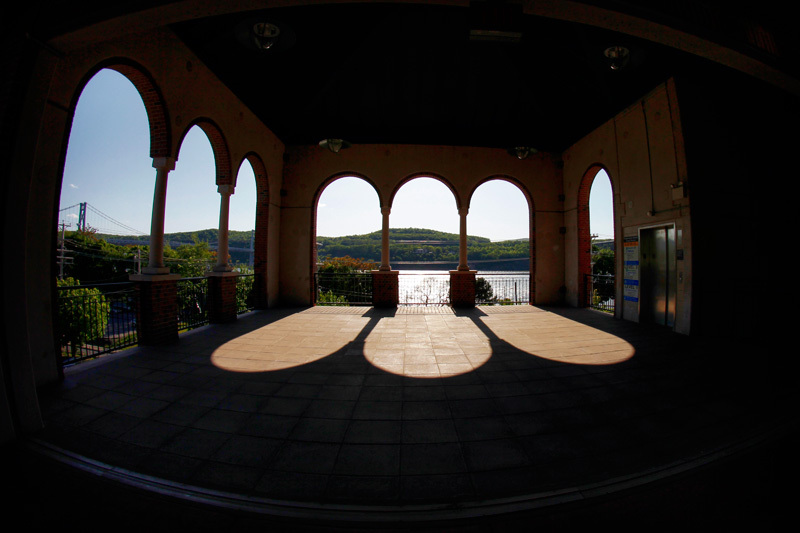 The most generic definition of a panorama is an wide view of an area, in which you can see in all directions. 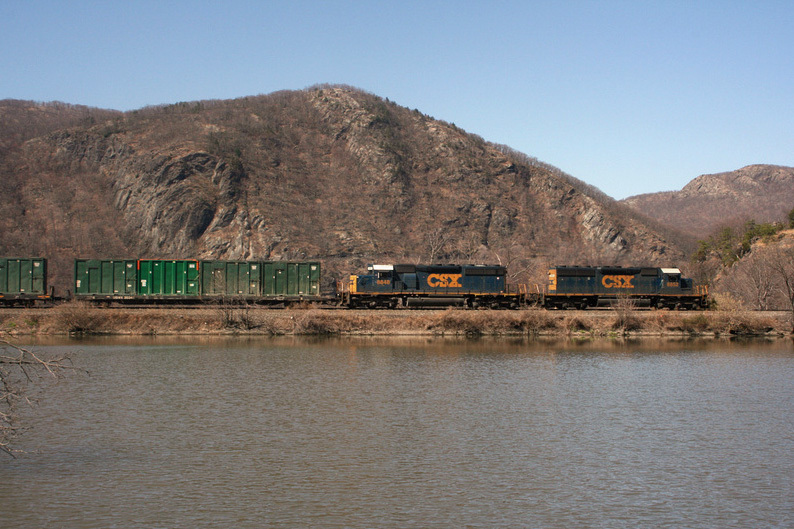 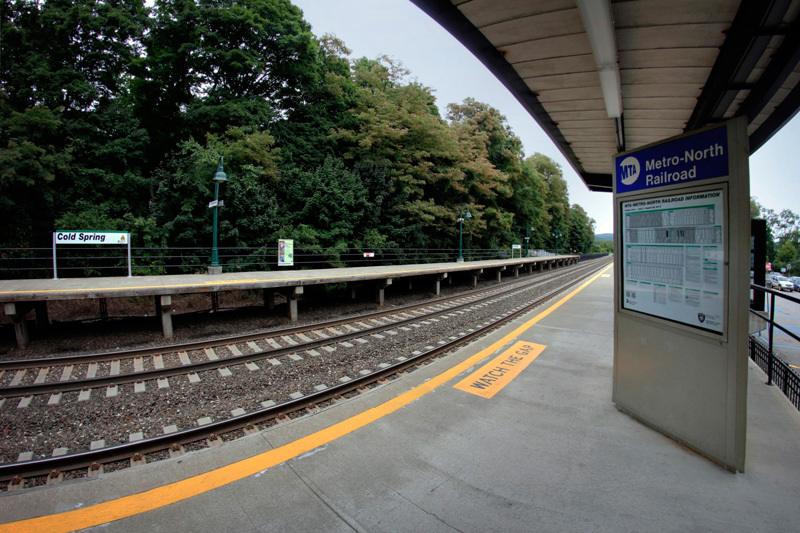 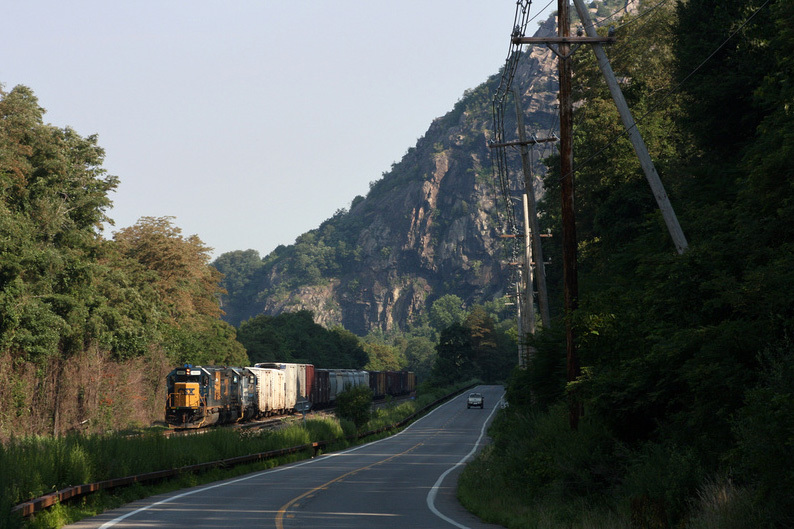 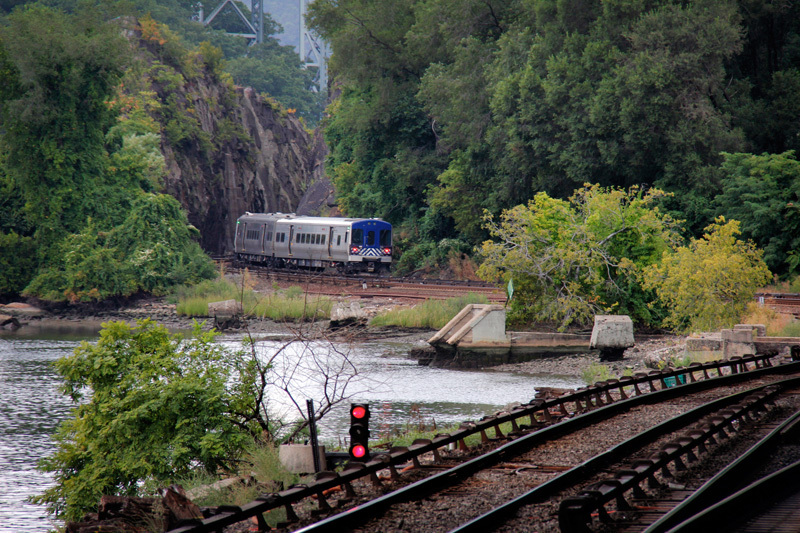 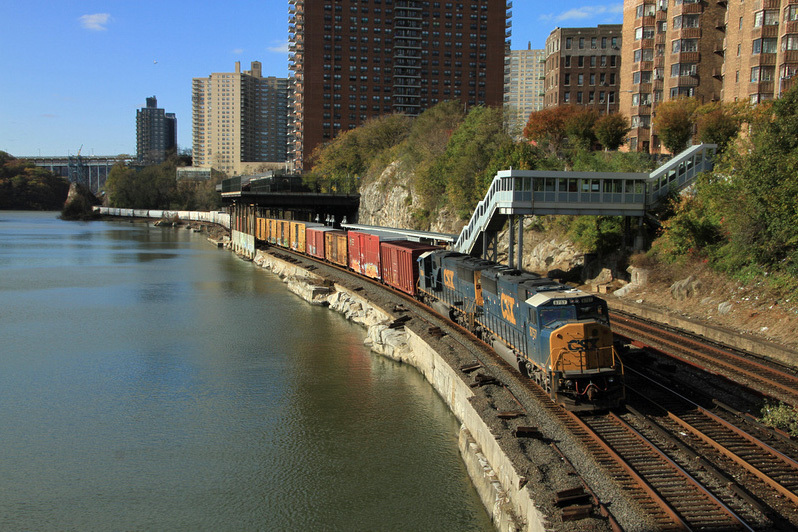 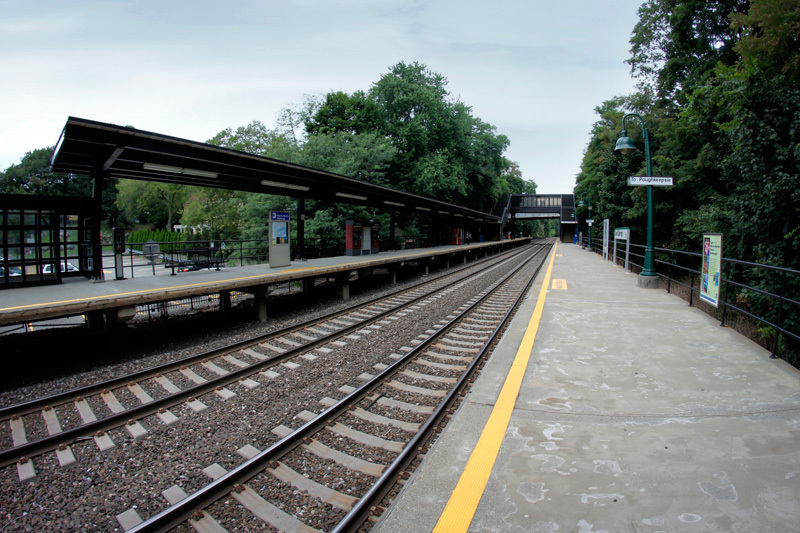 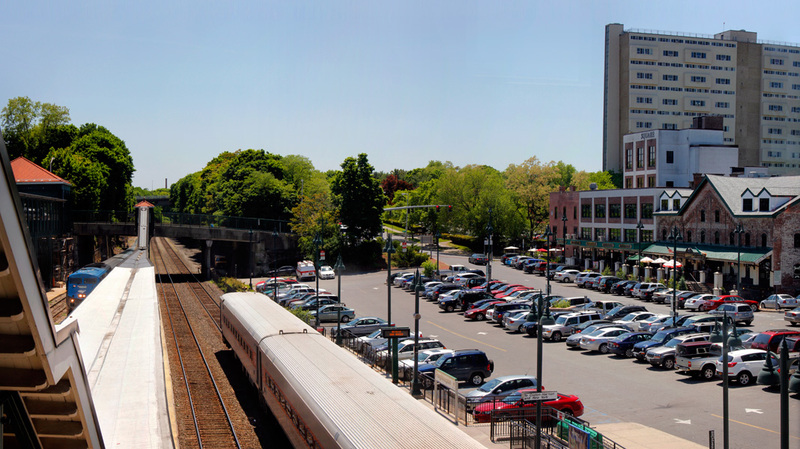 For my Metro-North Panorama Project, I used the definition loosely, featuring at least one photo per station that used the technique of stitching, thus giving the viewer a photo that provided a far wider view than one could capture in a single photo’s frame. 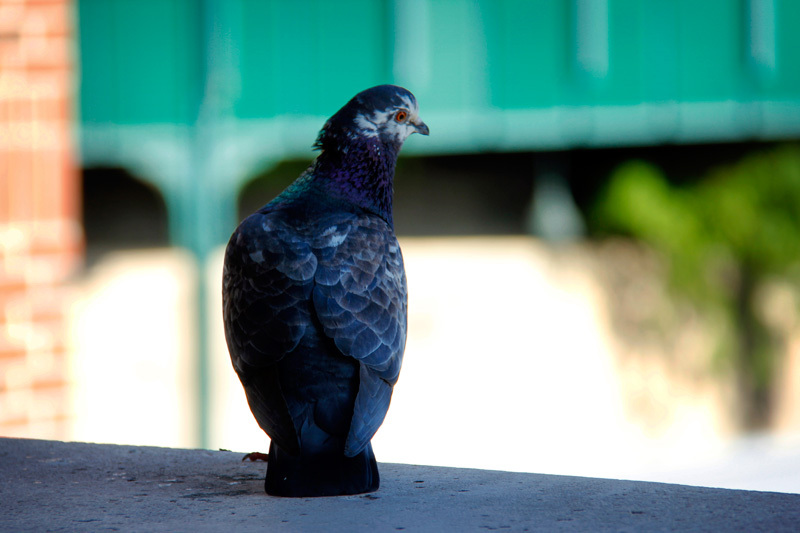 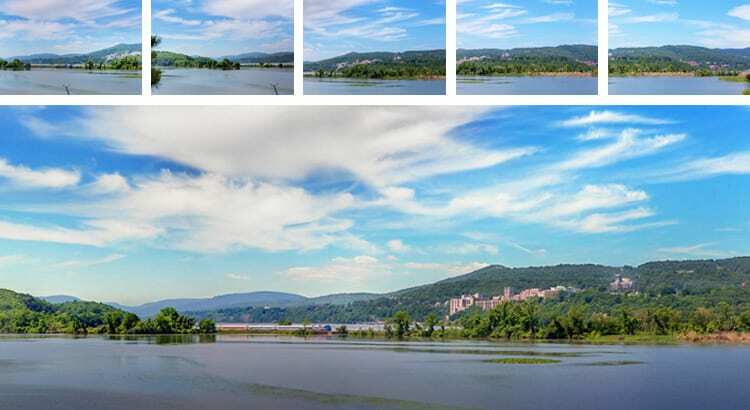 Using modern technology like Photoshop, one can take multiple photos around a central axis point – either on a tripod, or by standing in the same spot and rotating your body, while holding the camera at the same angle for each shot – and combine them. 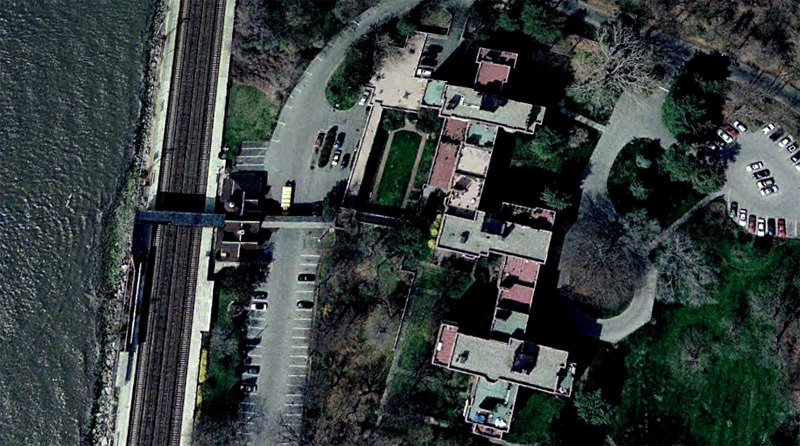 This technique is called stitching, and is one of the most common methods of getting high quality and high resolution panoramas. 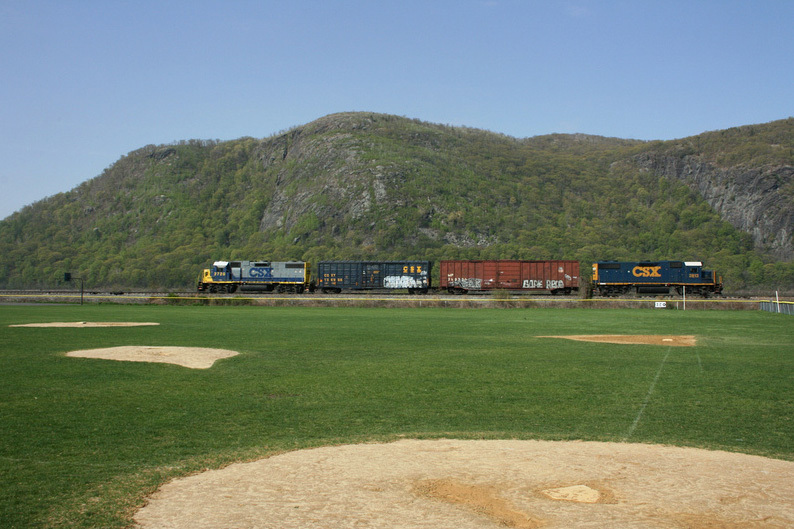 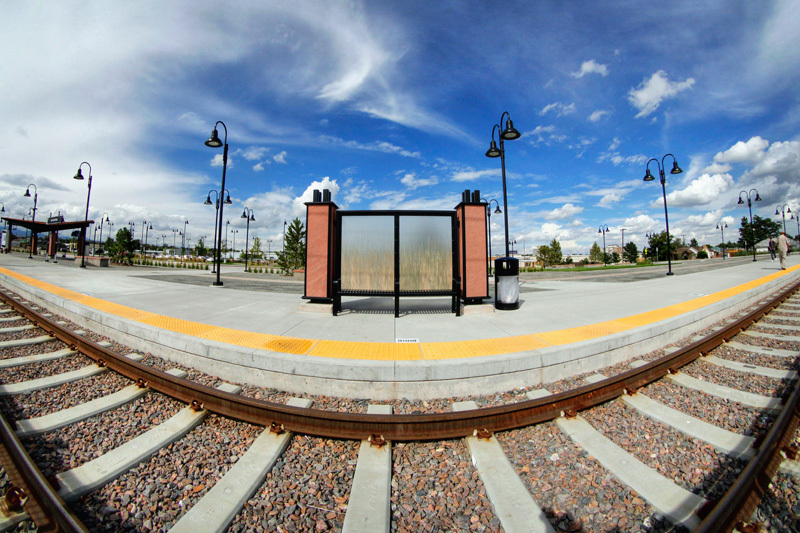 If this is a technique you’ve always been interested in trying out, or you’re just curious to see how exactly one makes a panorama (especially one featuring a train) – from camera to computer – read on. 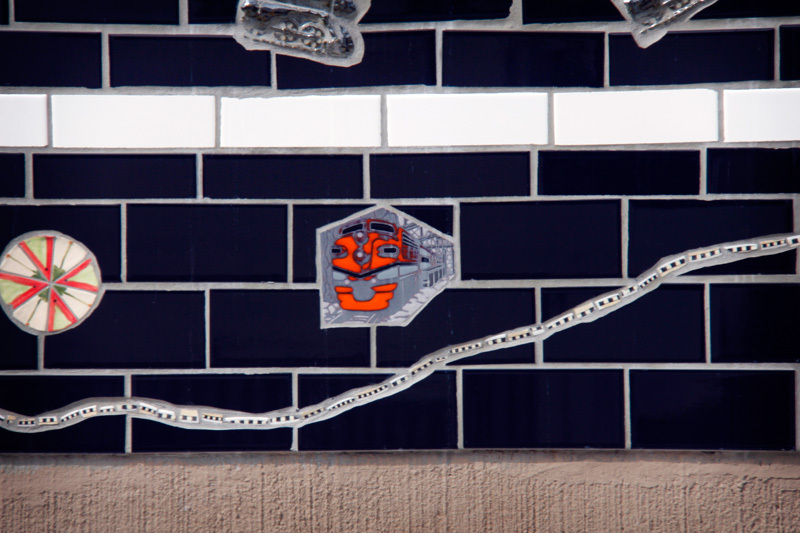 Continuing along on our tour of the 4 line’s Arts for Transit glasswork are five more stations – each with a unique piece of art that adds color to the urban landscape. 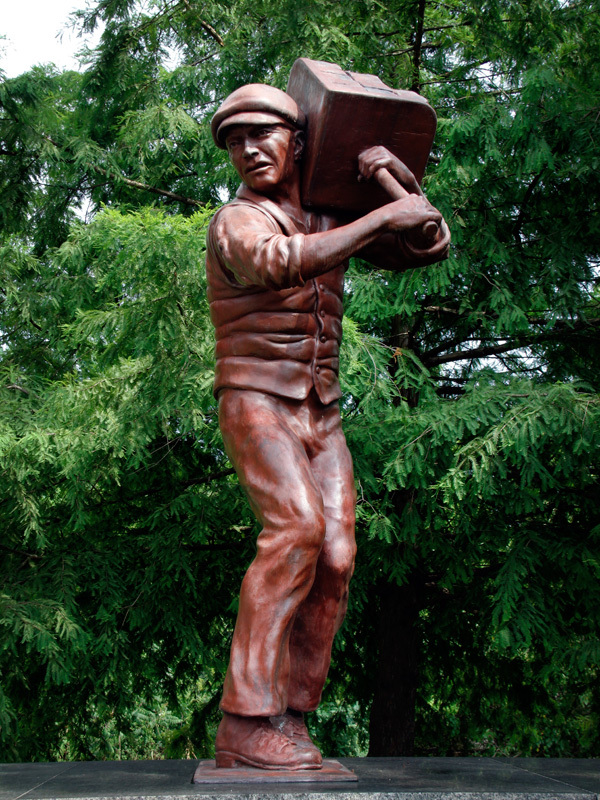 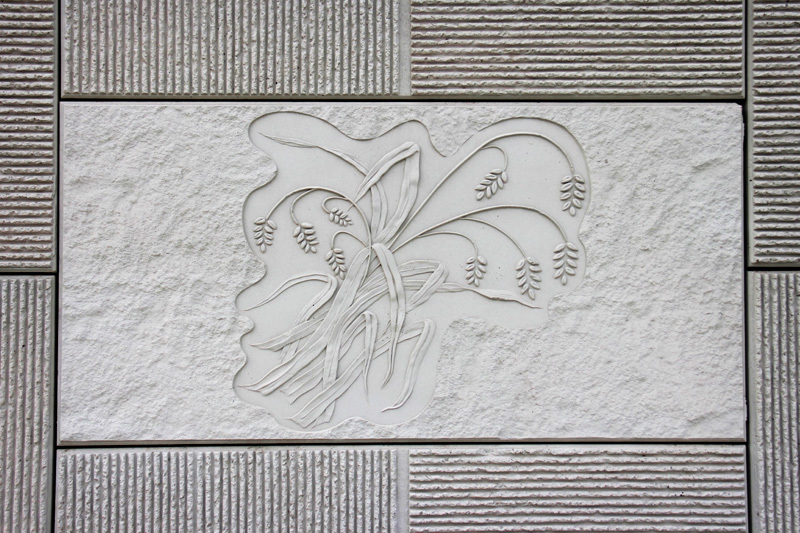 The design symbolizes the endurance, strength, and hope of a long-suffering, proud, and determined people. 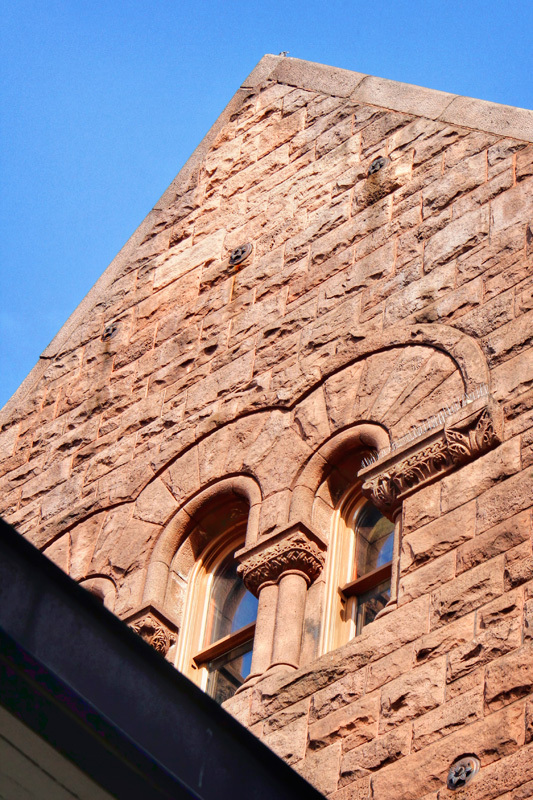 The curved shape represents the arms of a man raised in prayer. 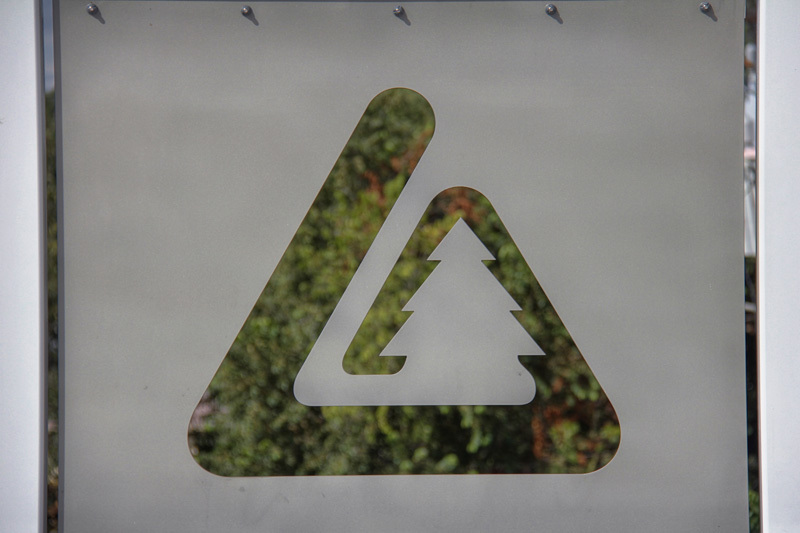 the circles represent many campfires. 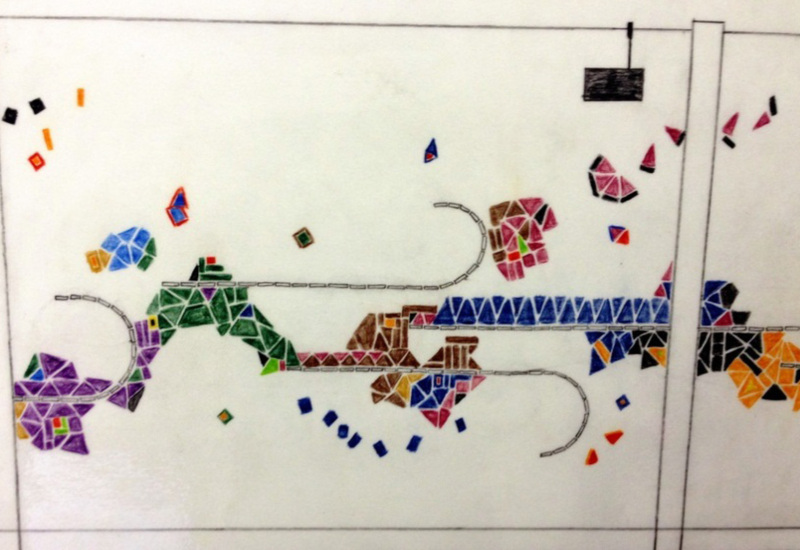 The lines represent the many trails taken from the time the Indians left their ancestral homes. 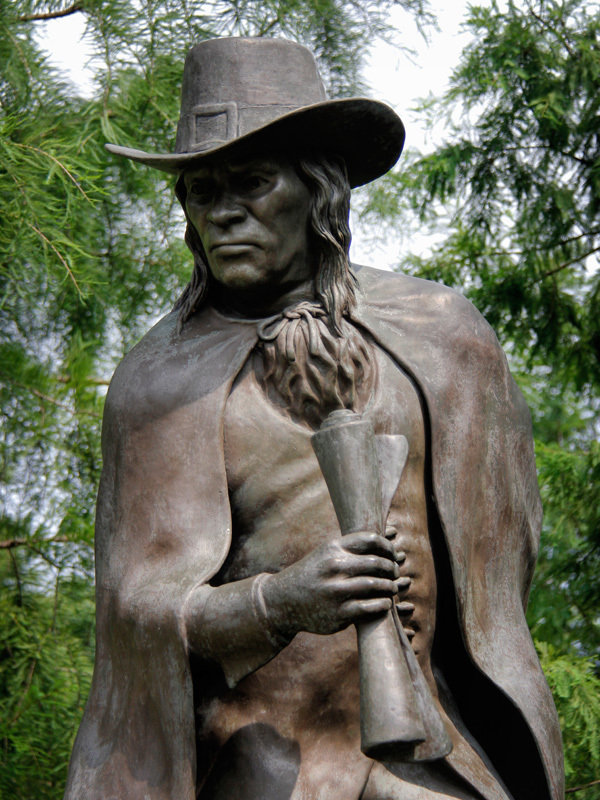 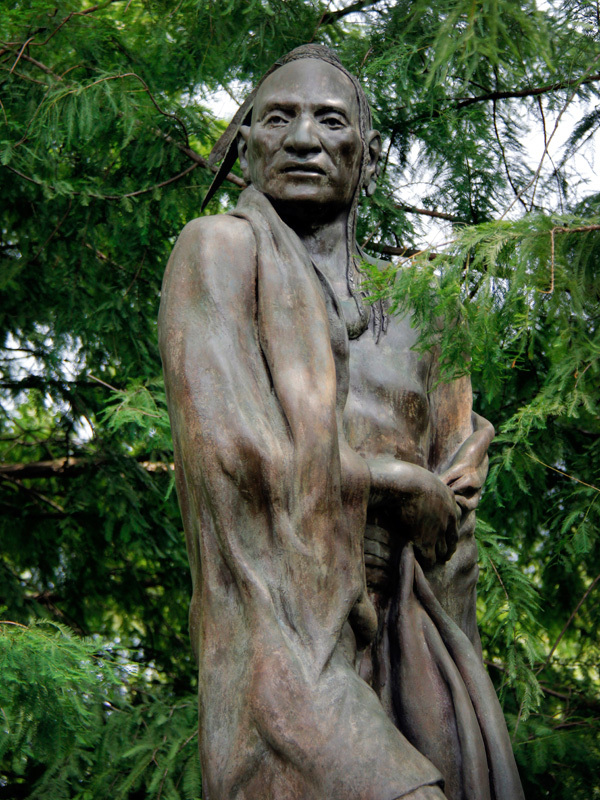 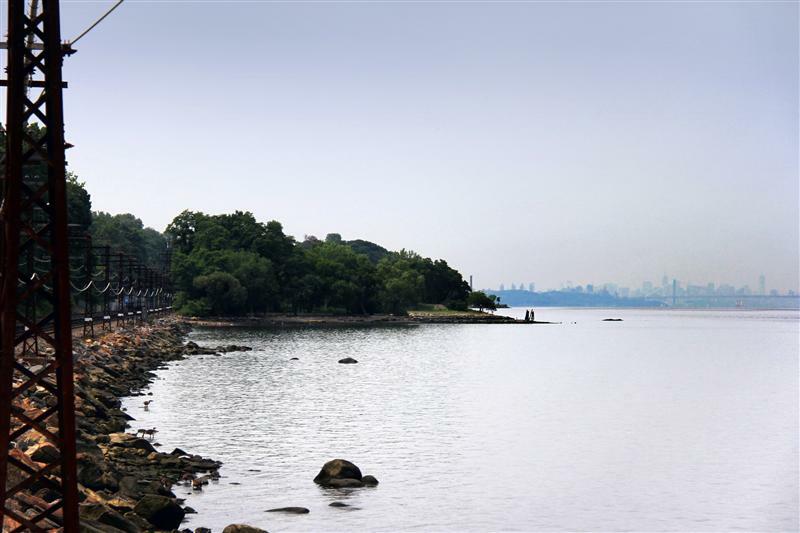 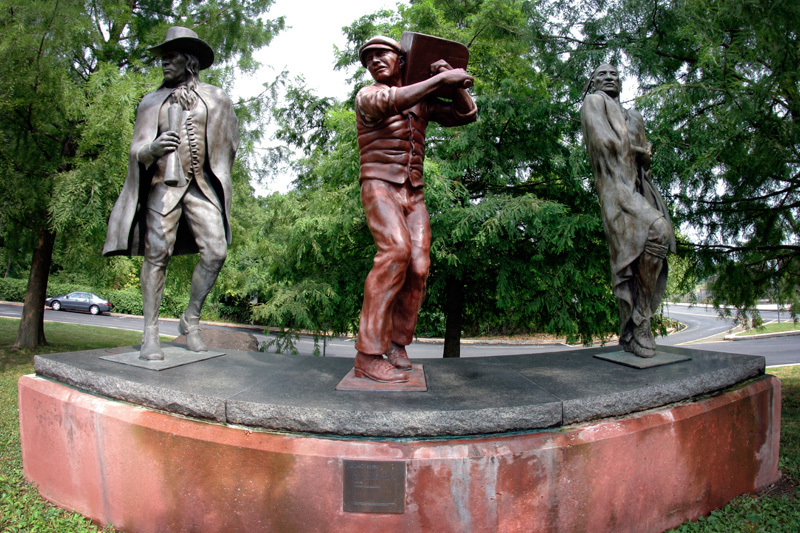 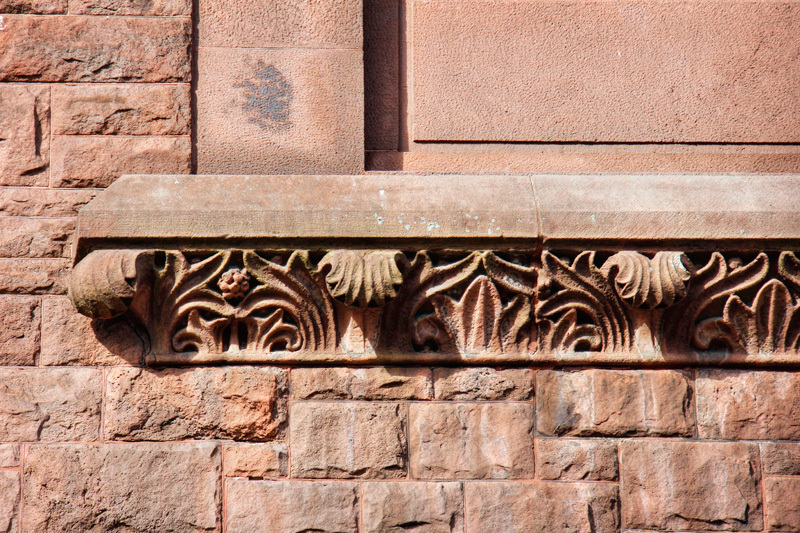 Some of the scenes depicted in the piece are the lands once inhabited by the Siwanoy Nation (a branch of the Mohicans) in the 1600s, the Croton Aqueduct, St. Nicholas of Tolentine Church, and the Hall of Fame for Great Americans at Bronx Community College. Exactly one hundred years ago, Connecticut was gripped in a frigid and snowy winter, much like the one we are currently experiencing. 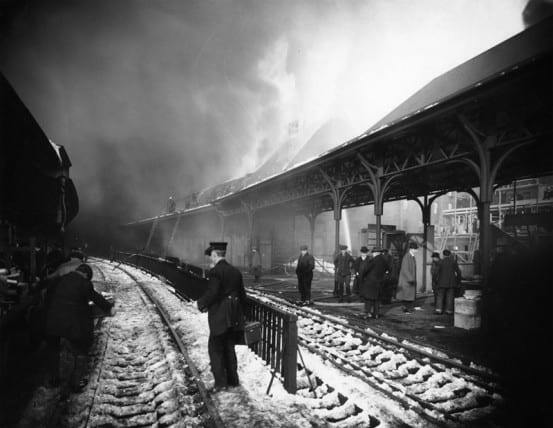 And exactly one hundred years ago last Friday, Hartford’s Union station was ablaze. On its own, a fire can be pretty devastating enough, but coupled with the snow, firefighters had difficulty getting to the station to put the fire out. 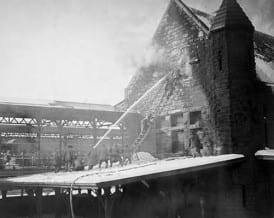 Ultimately there were several small explosions, one of which displaced a large section of the roof, pieces of which fell and destroyed the ticket office. 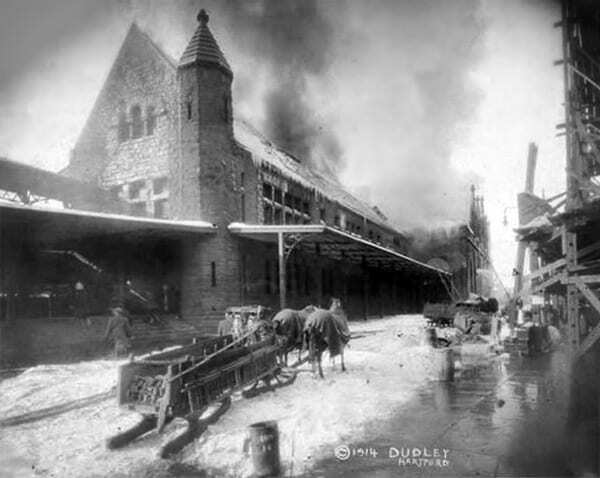 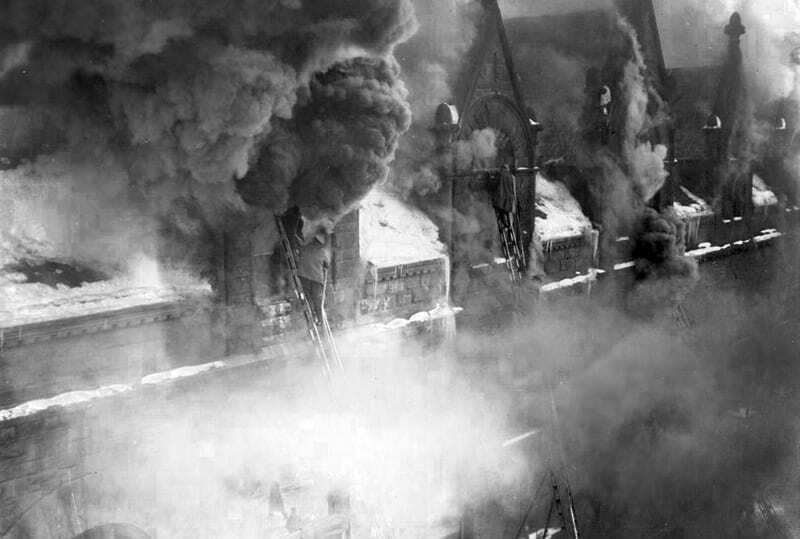 The station was heavily damaged, and much of the items in the baggage room – where the fire started – were destroyed. 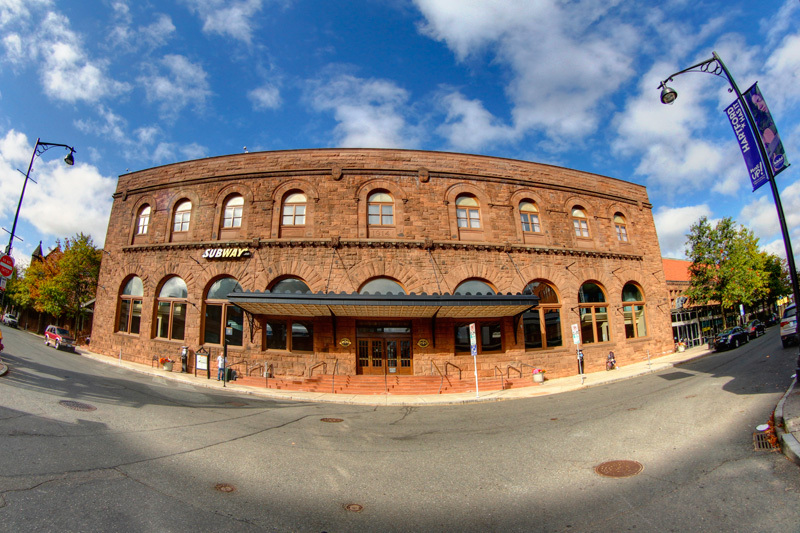 Originally constructed in 1889, Hartford’s Union station was built in the Richardsonian Romanesque style, which first gained popularity in the Boston area and was used for several stations along the Boston and Albany Railroad. 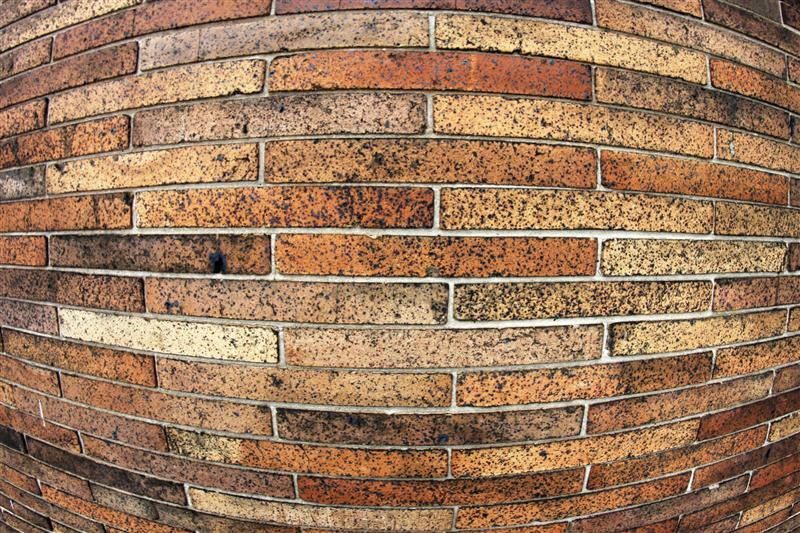 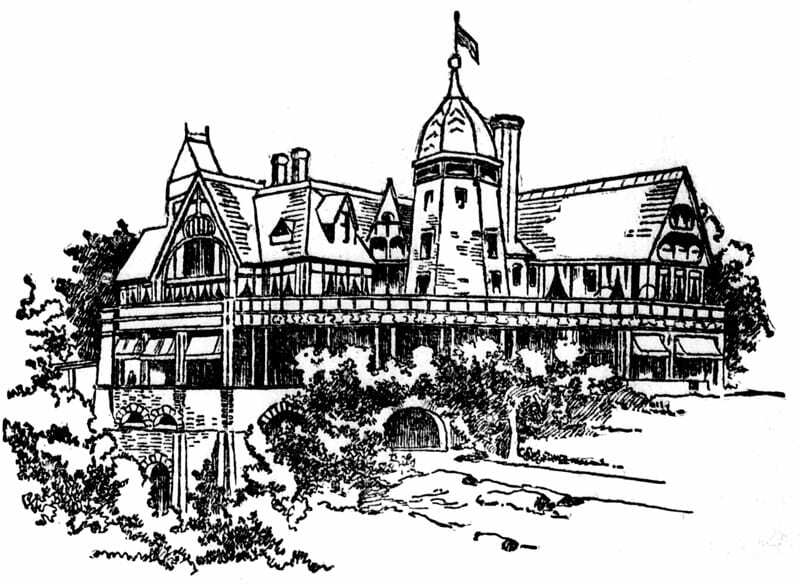 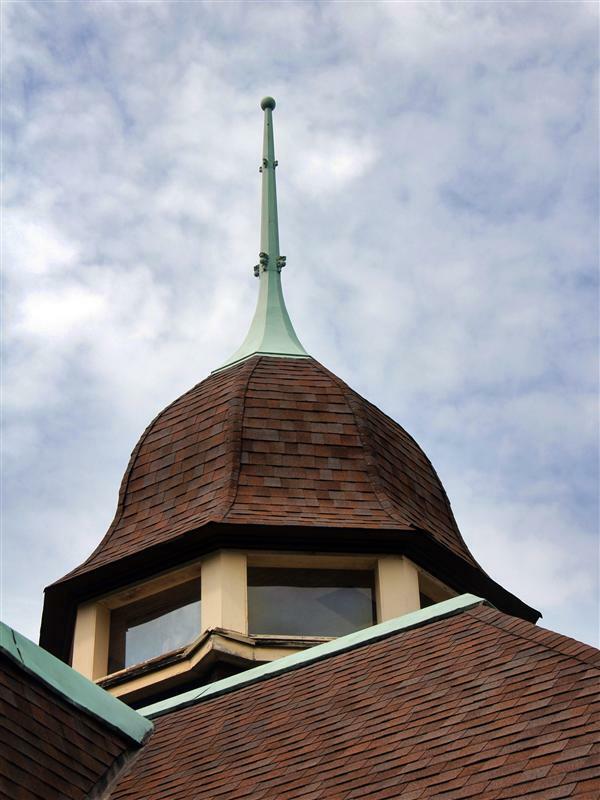 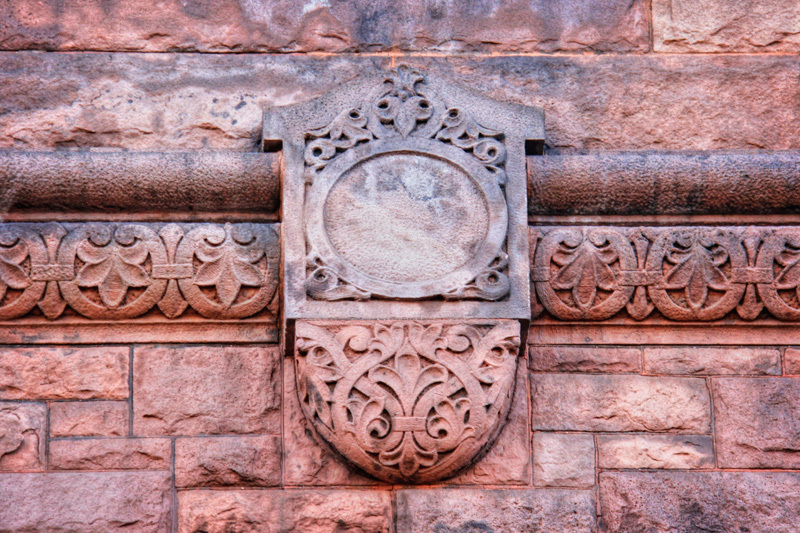 Conceptually designed by local architect George Keller, the bulk of the design work fell to architectural firm Shepley, Rutan and Coolidge, successors of Henry Hobson Richardson (which is where the “Richardsonian” part comes from. 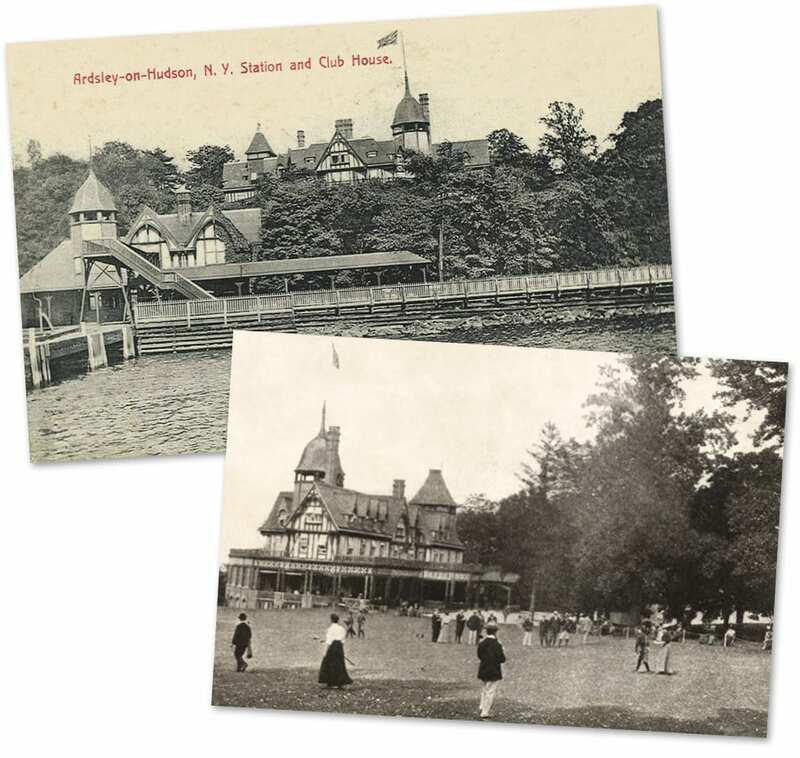 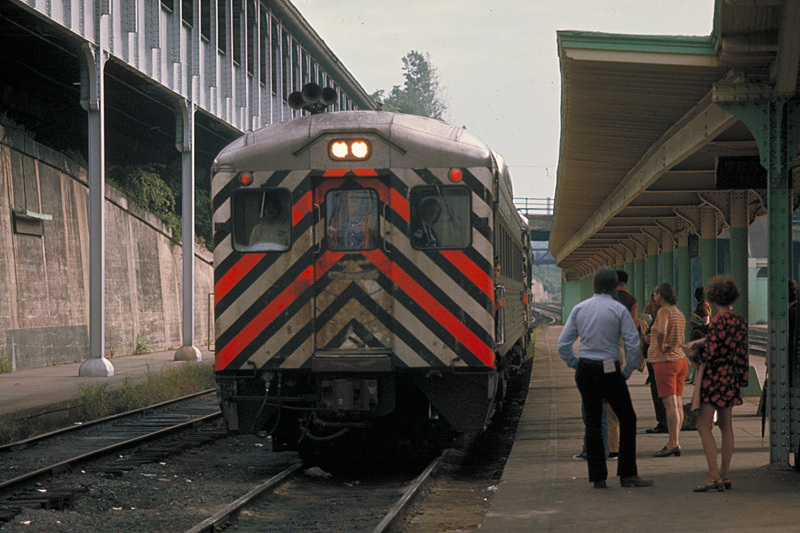 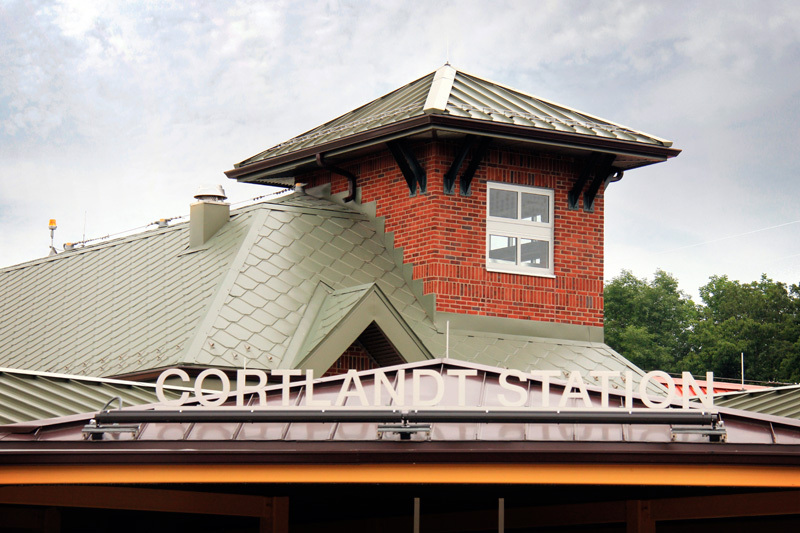 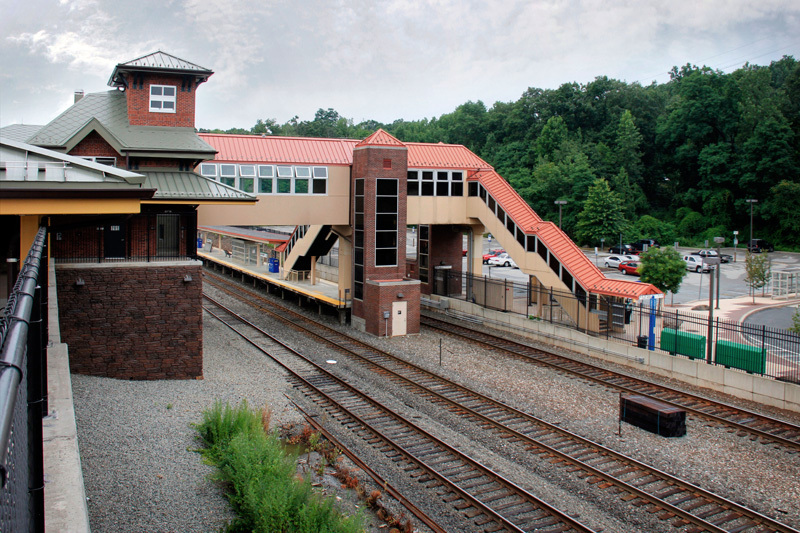 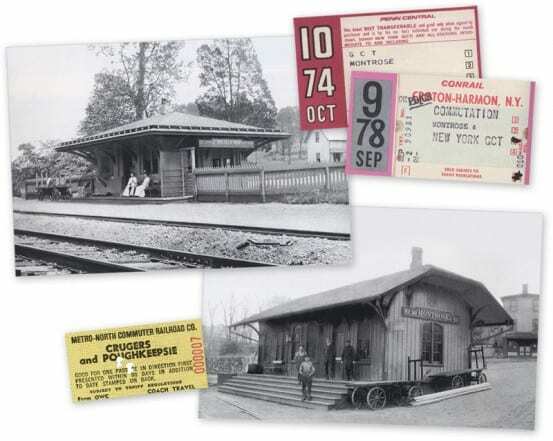 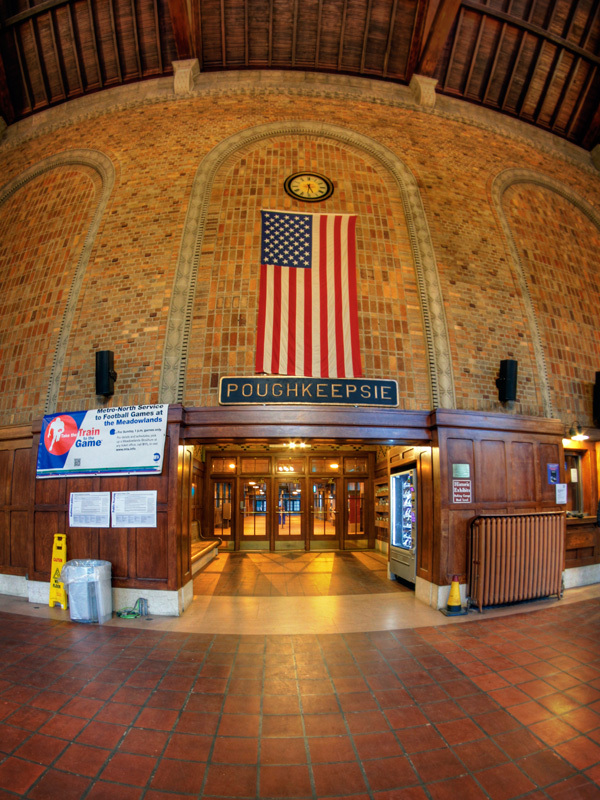 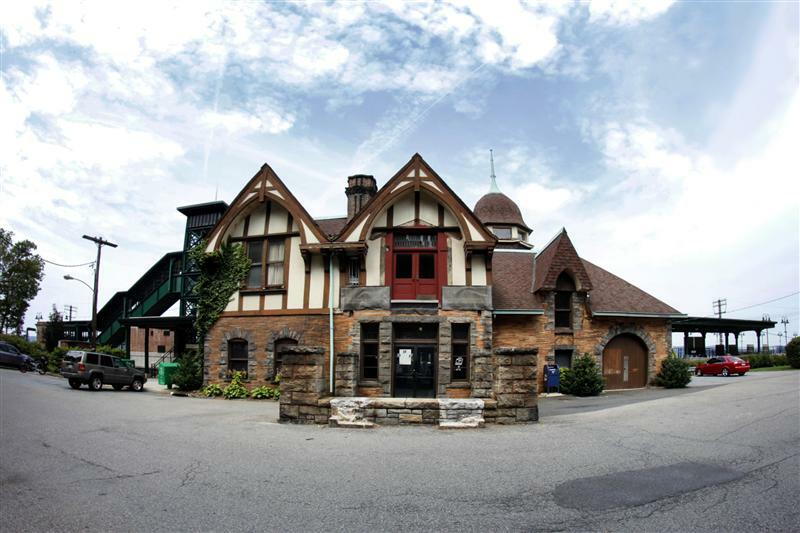 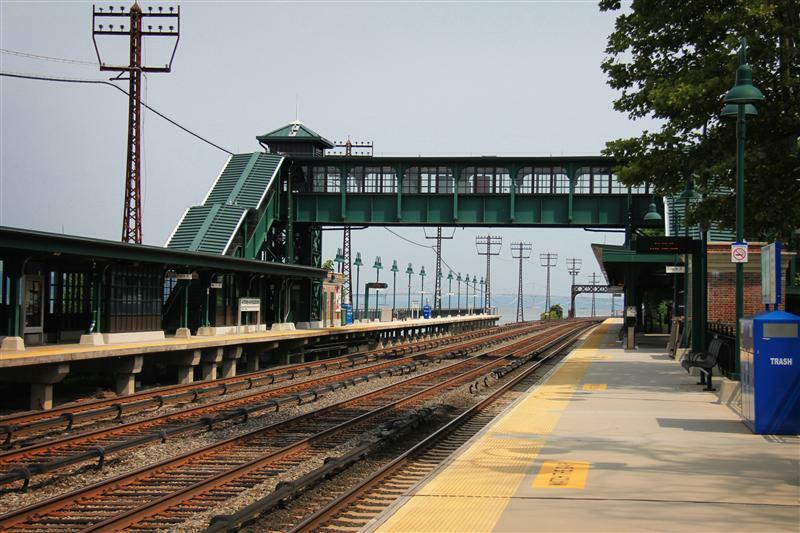 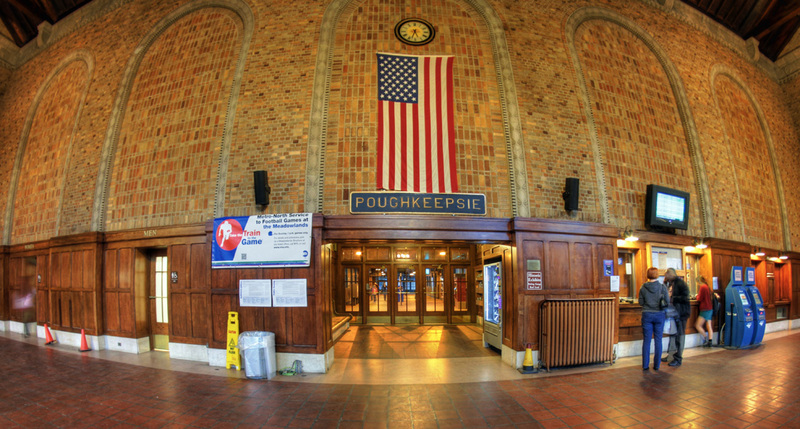 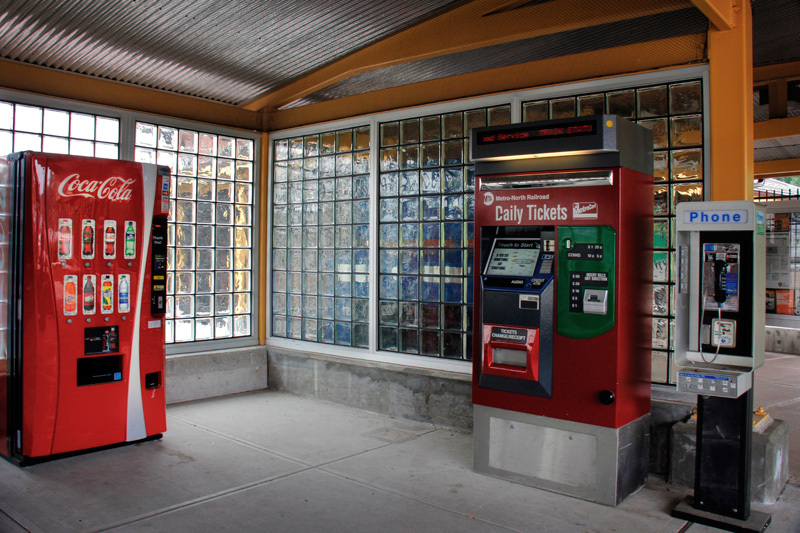 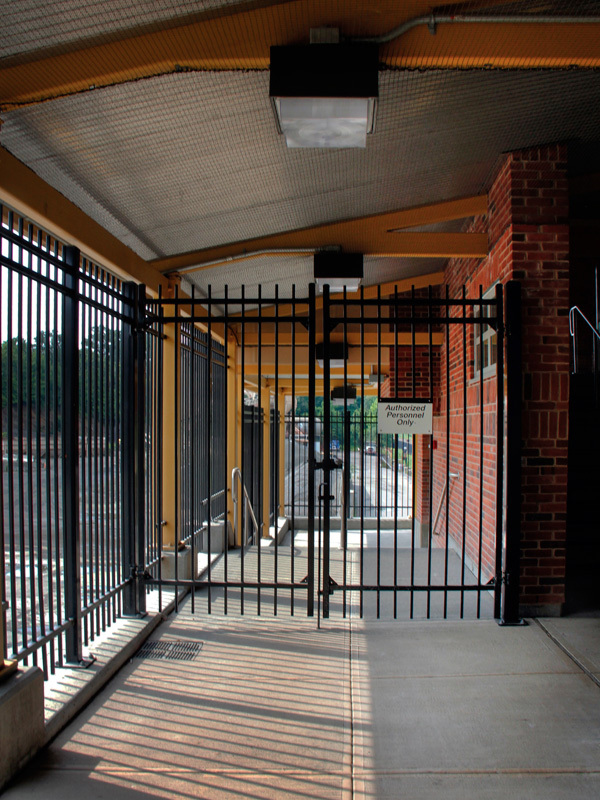 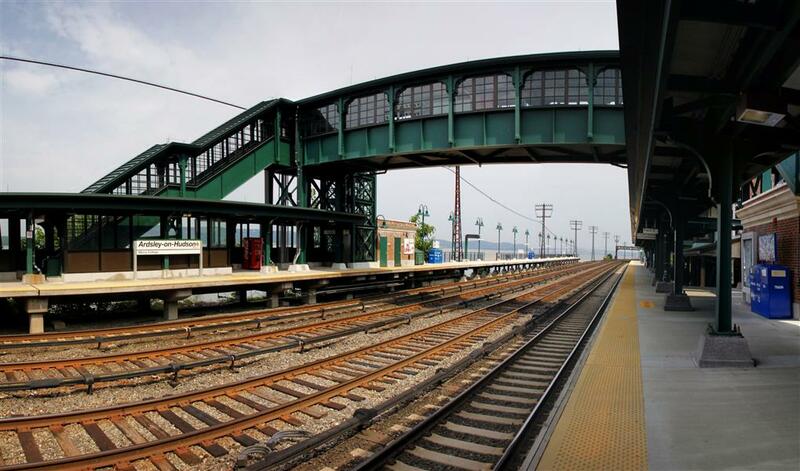 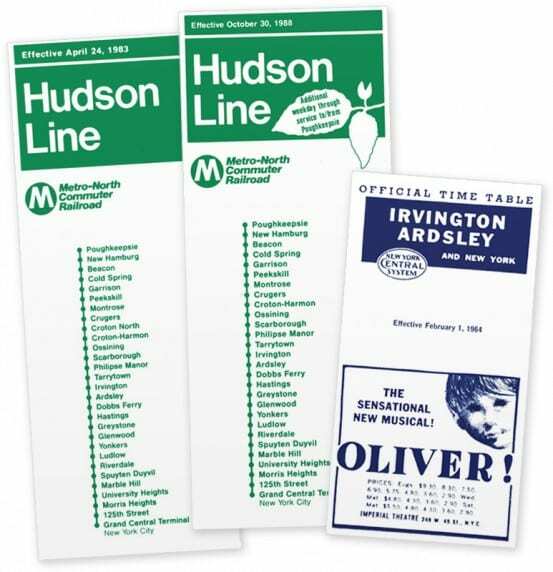 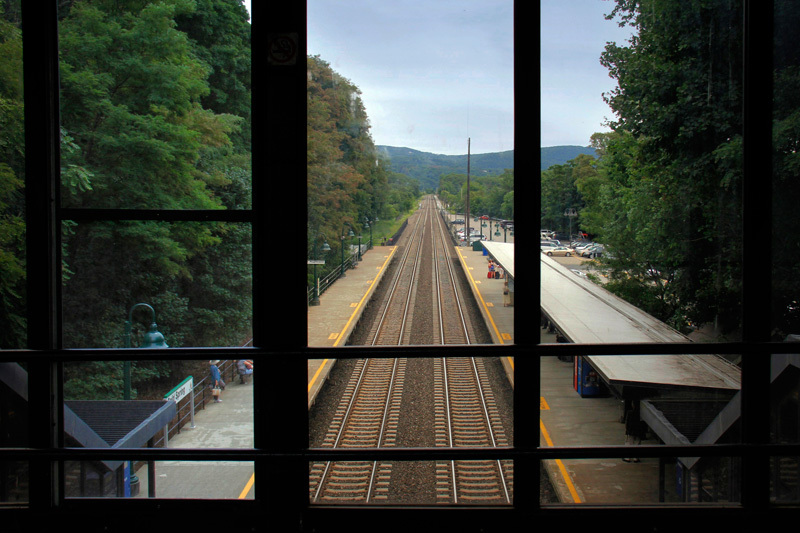 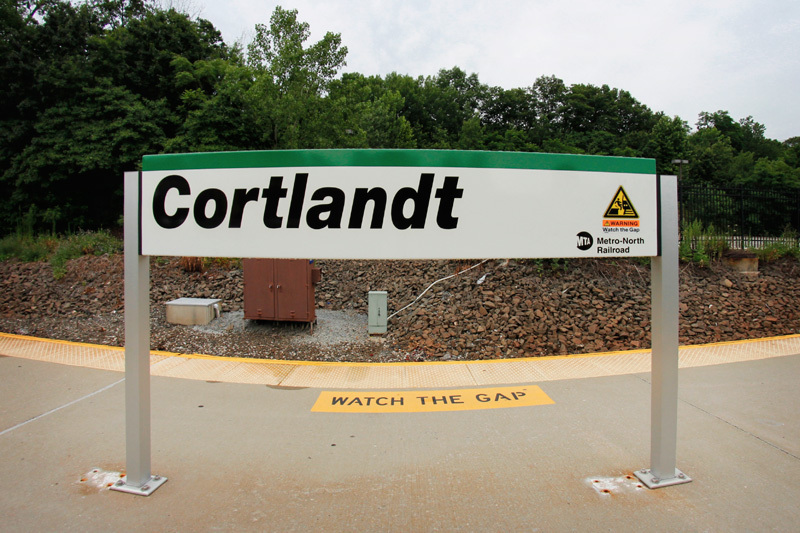 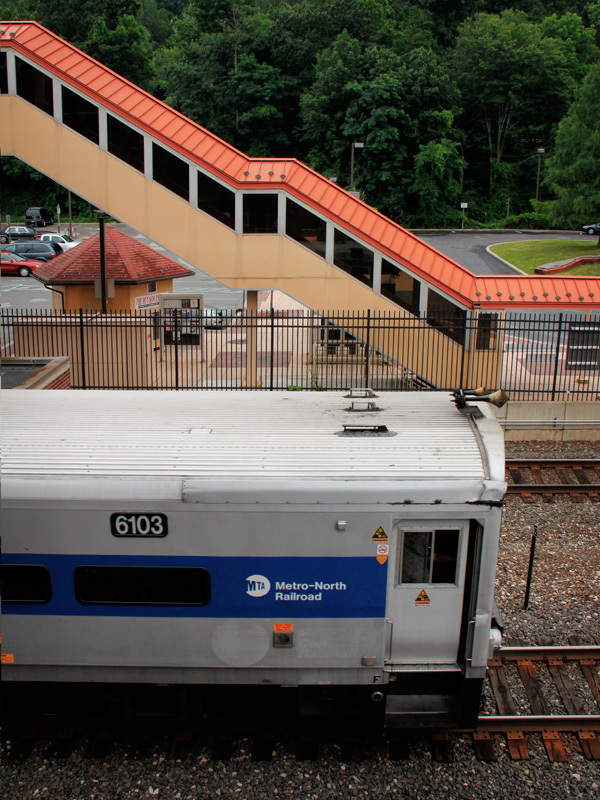 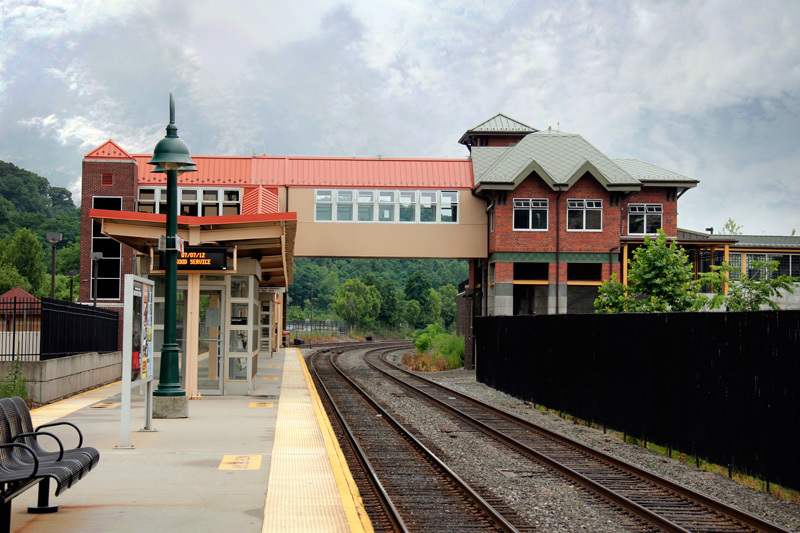 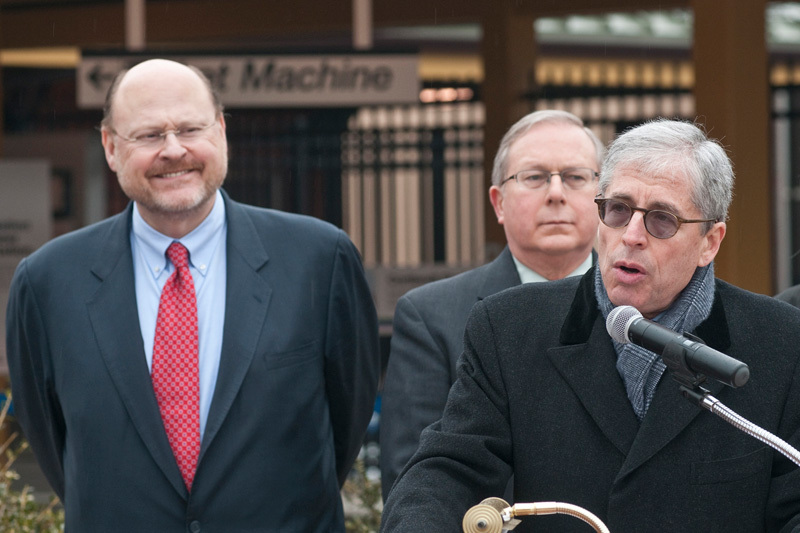 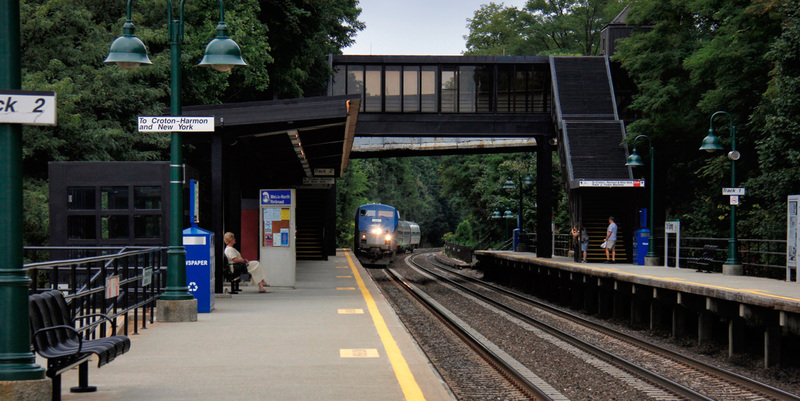 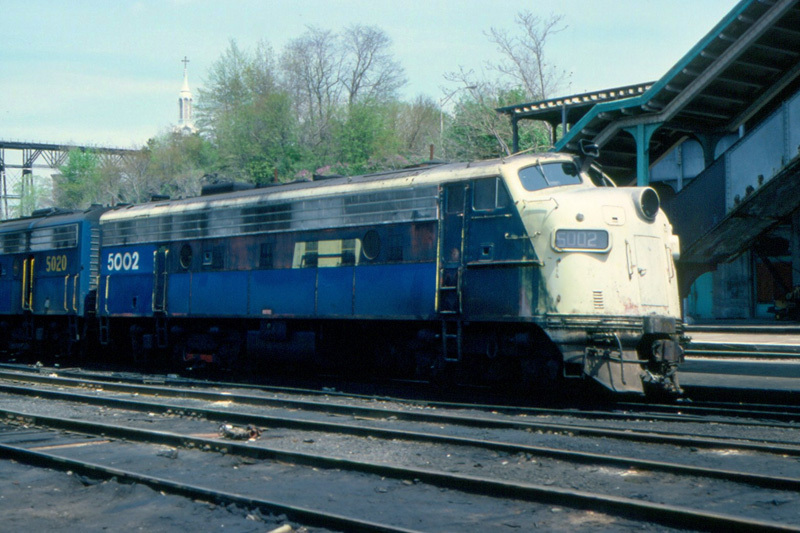 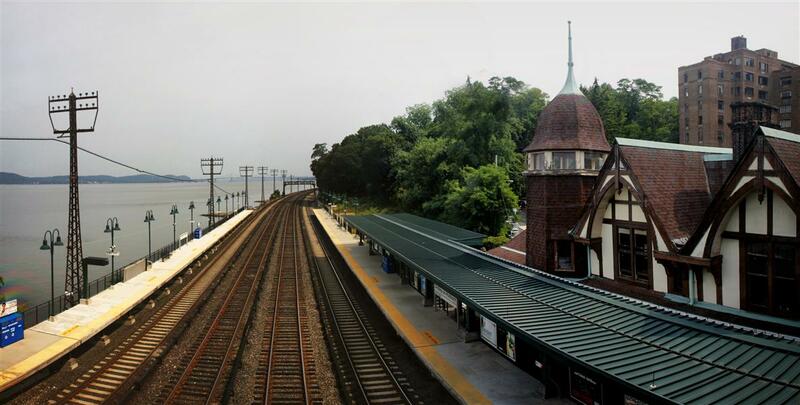 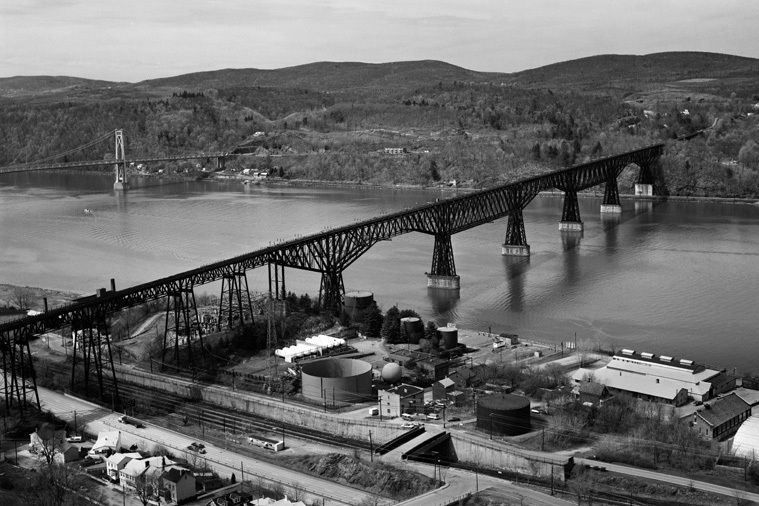 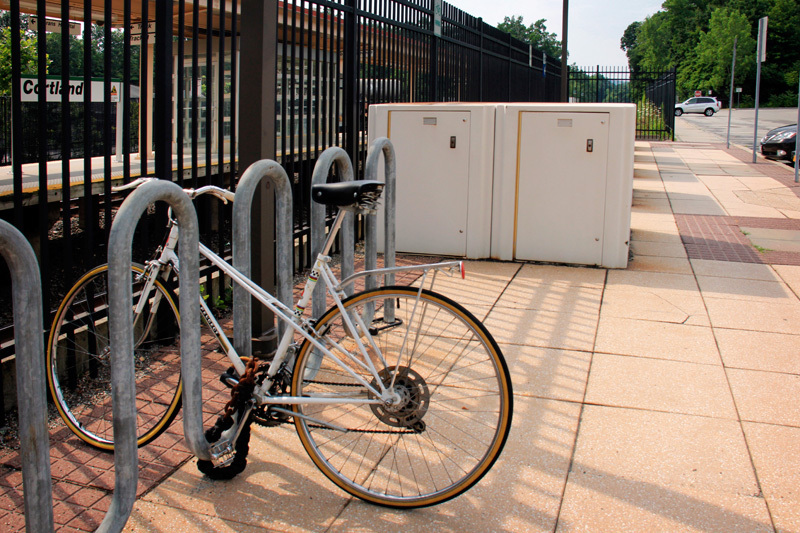 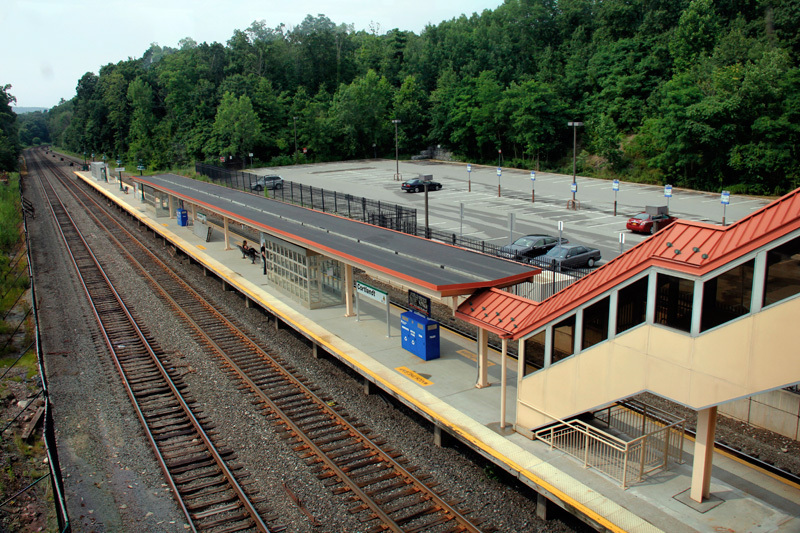 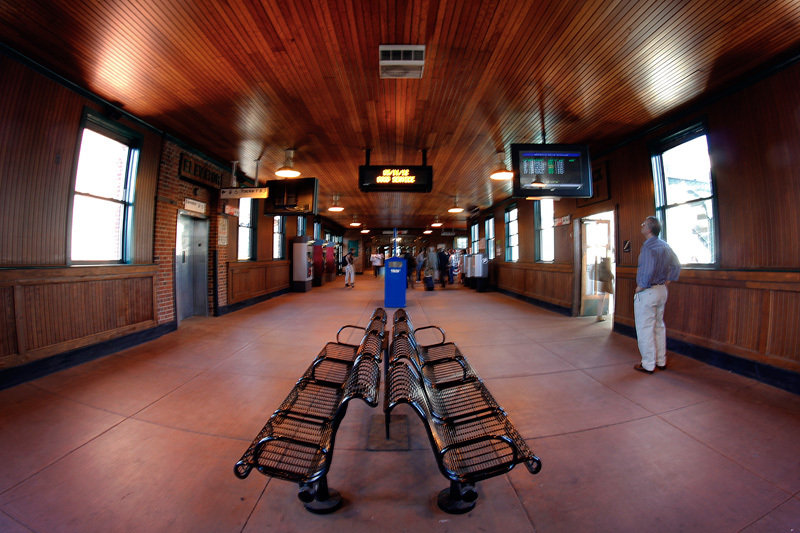 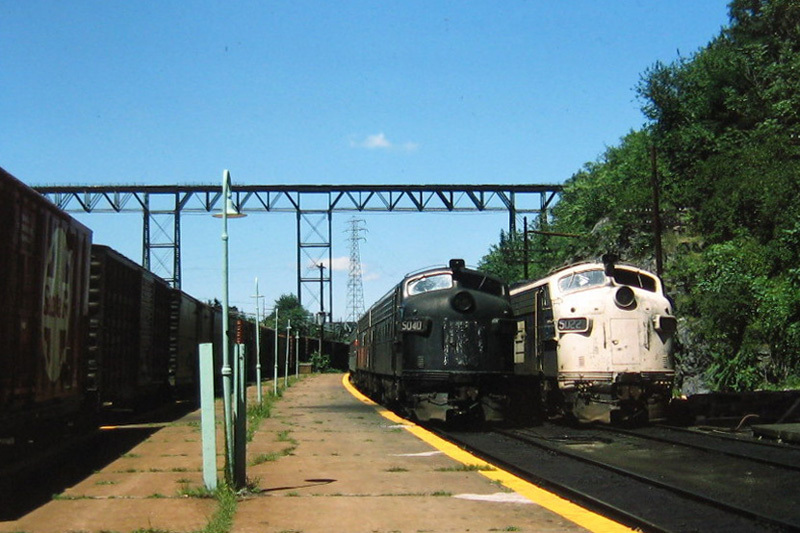 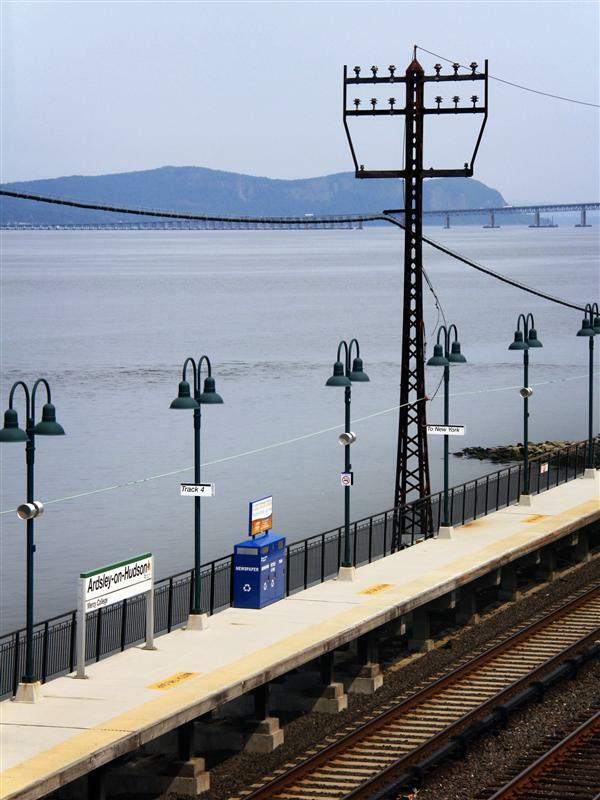 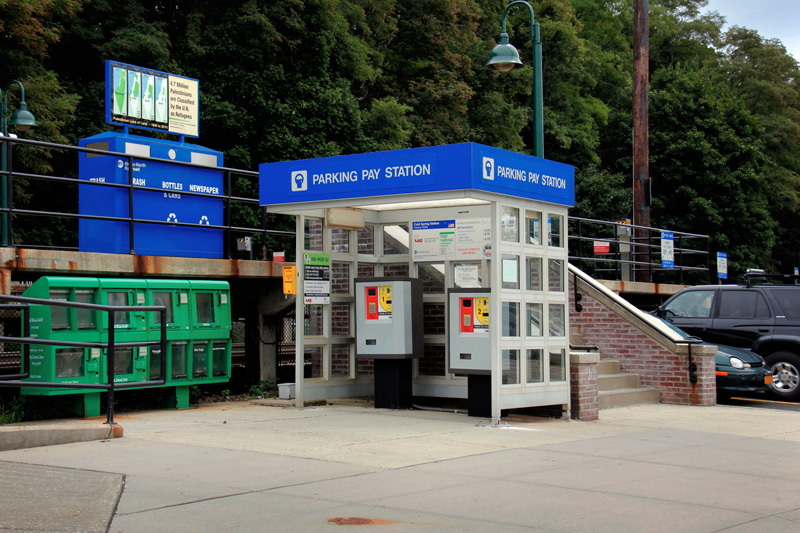 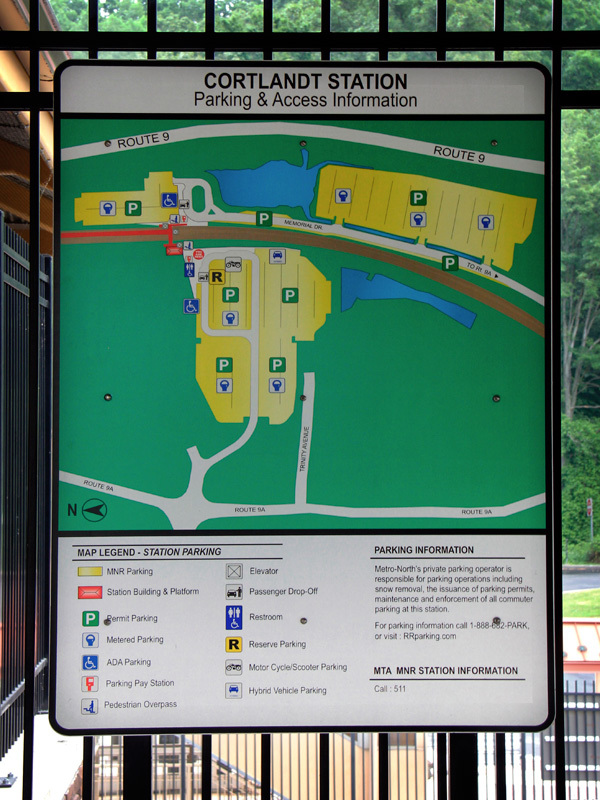 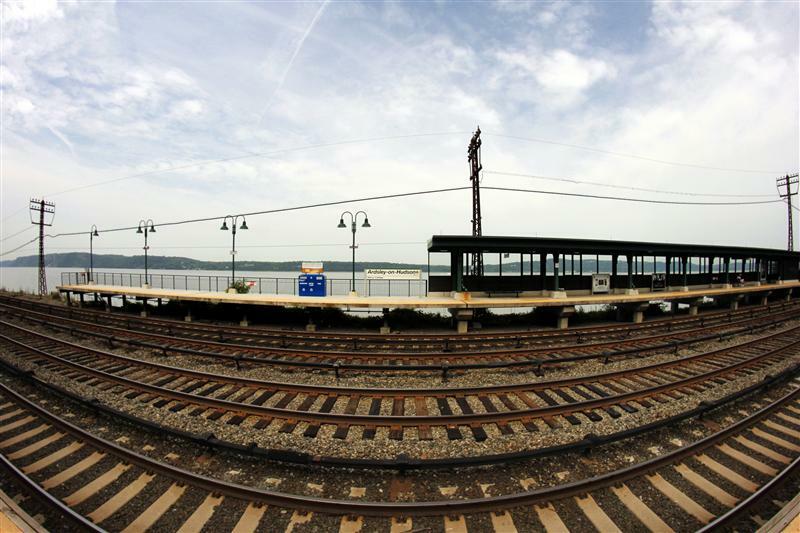 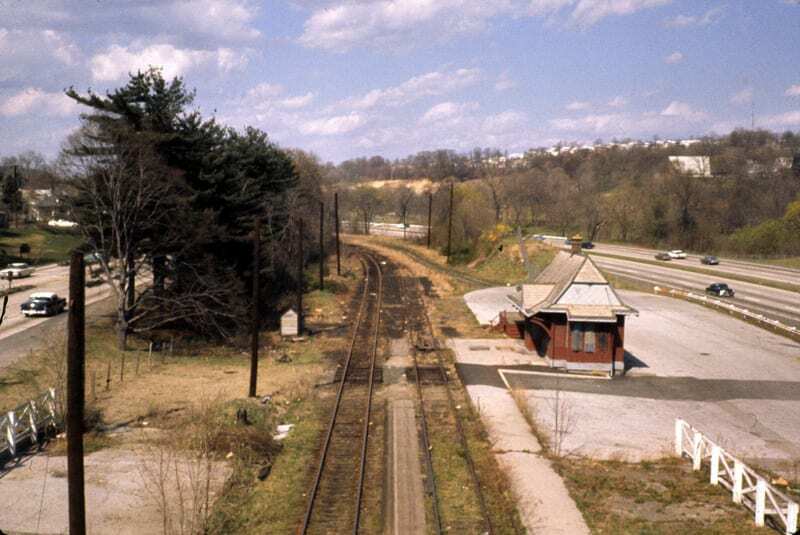 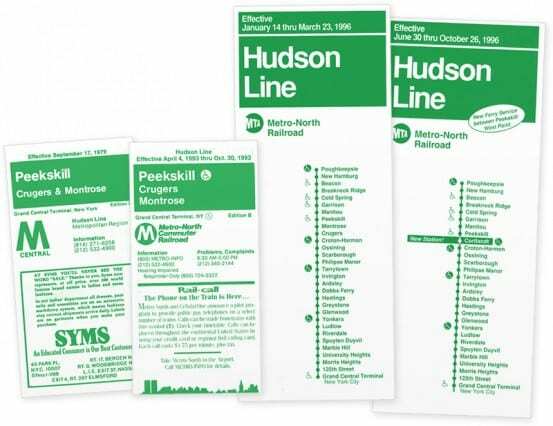 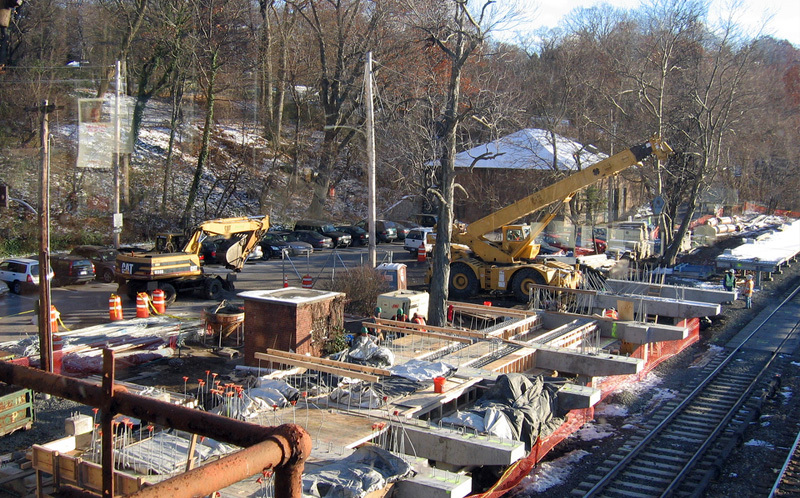 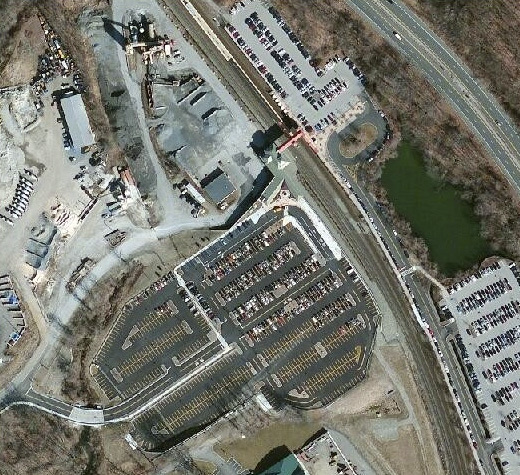 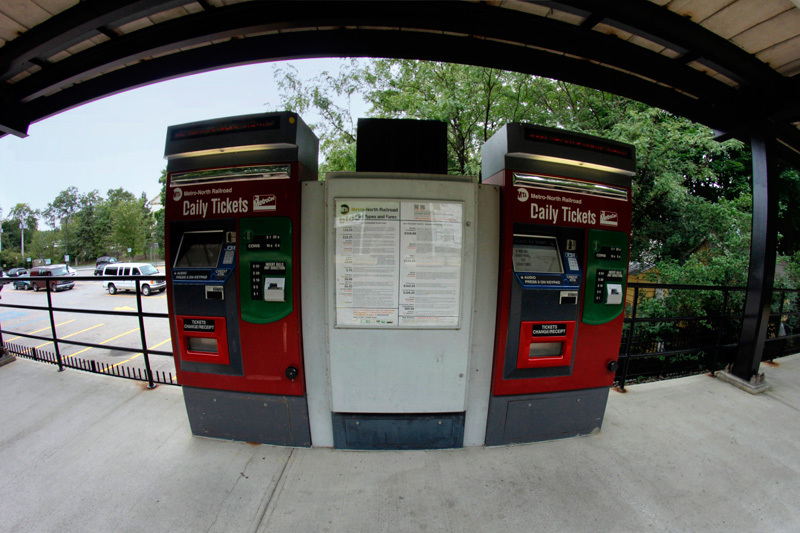 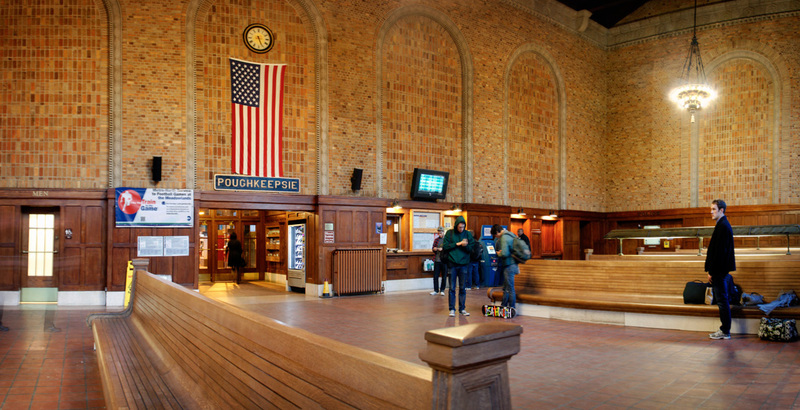 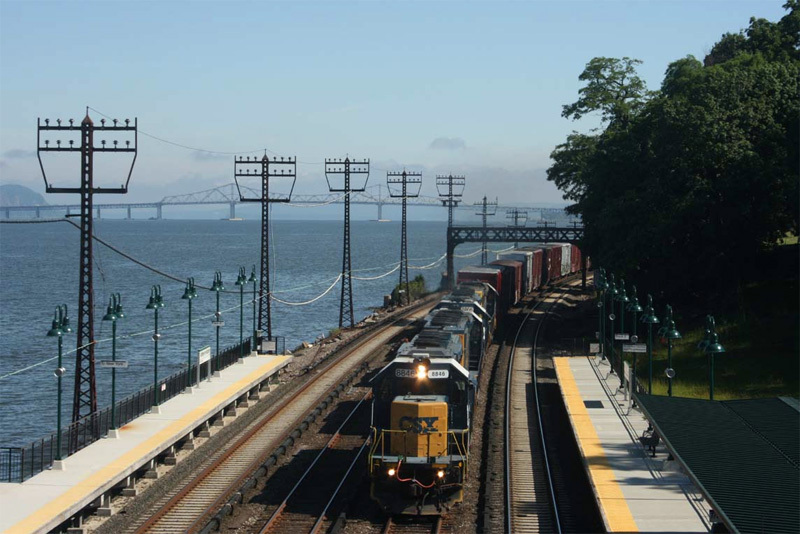 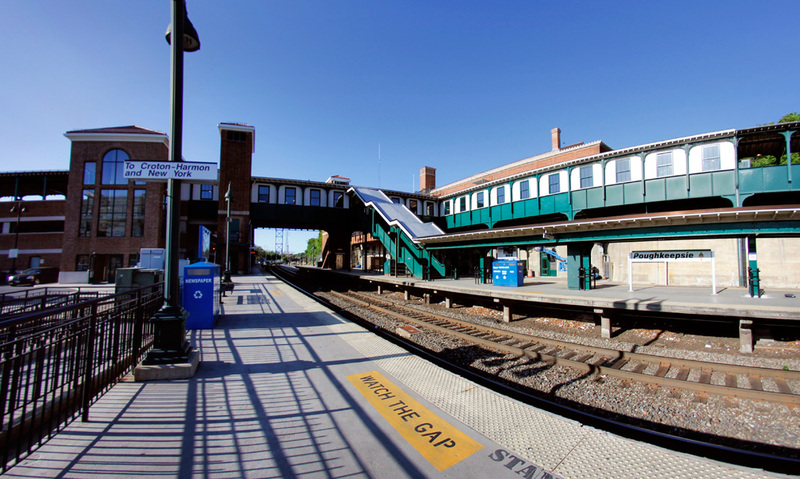 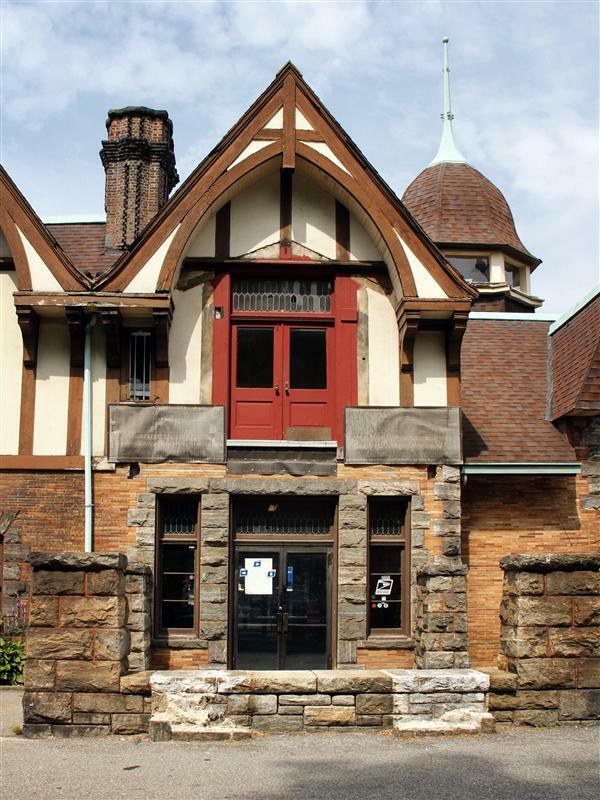 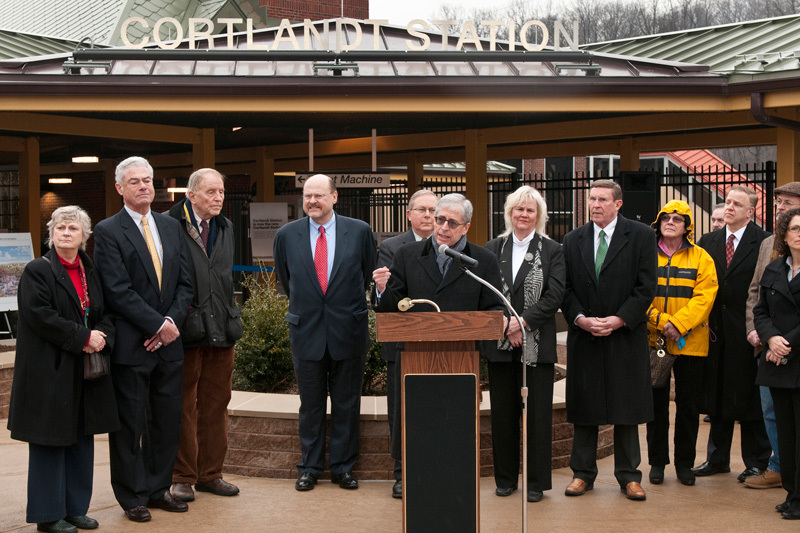 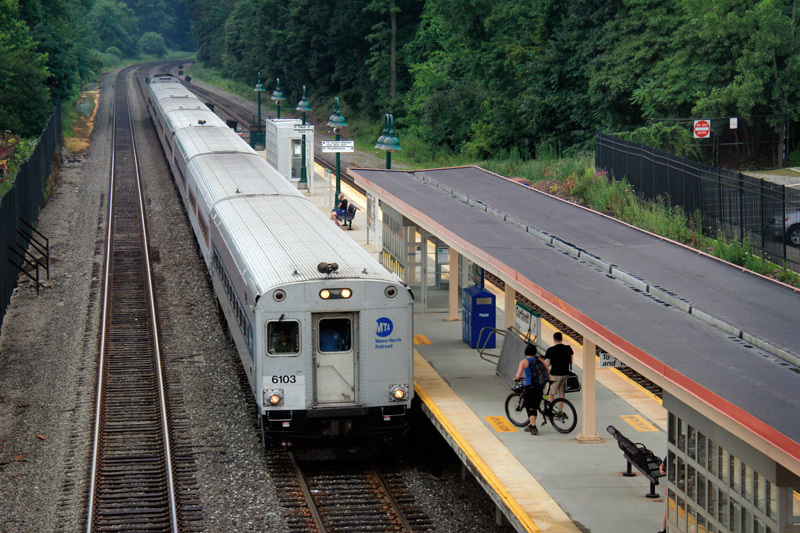 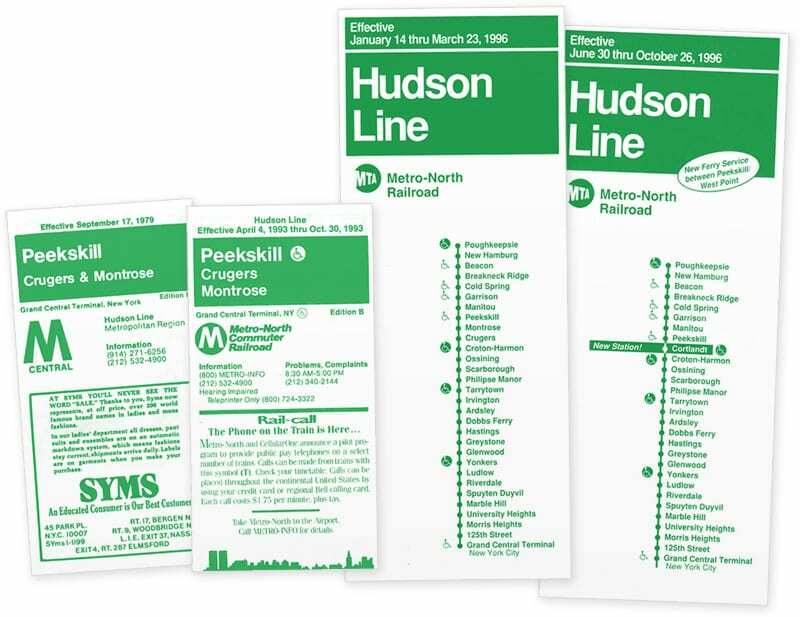 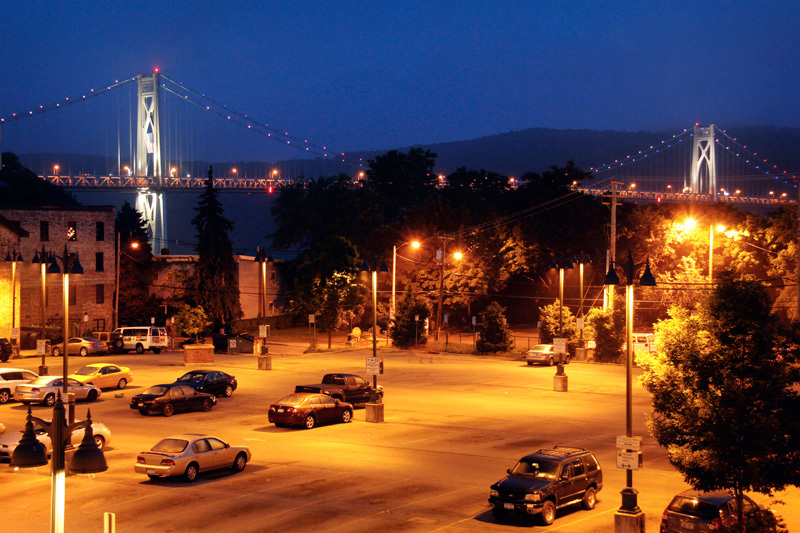 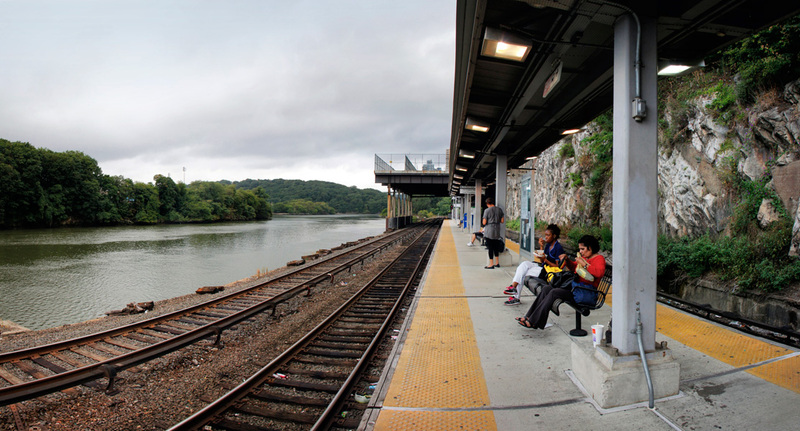 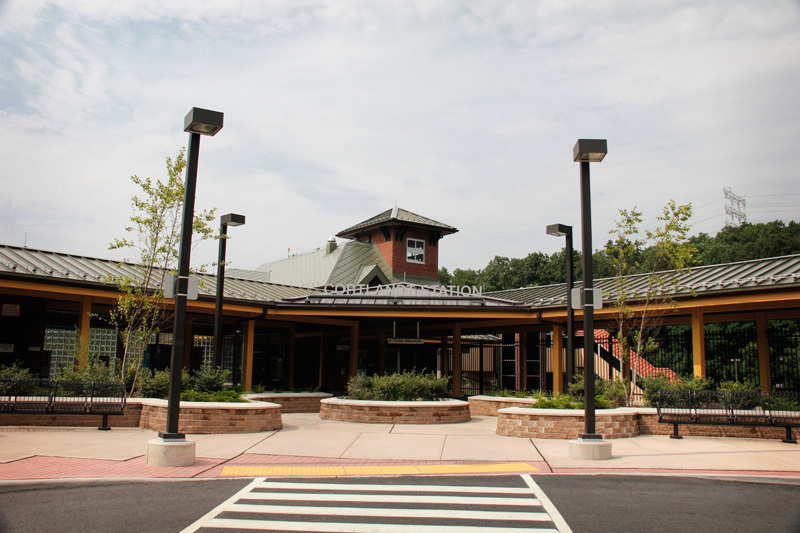 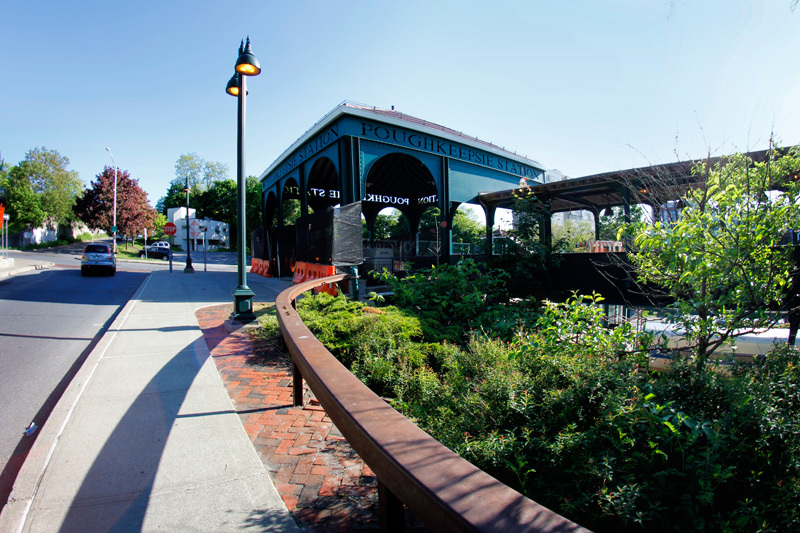 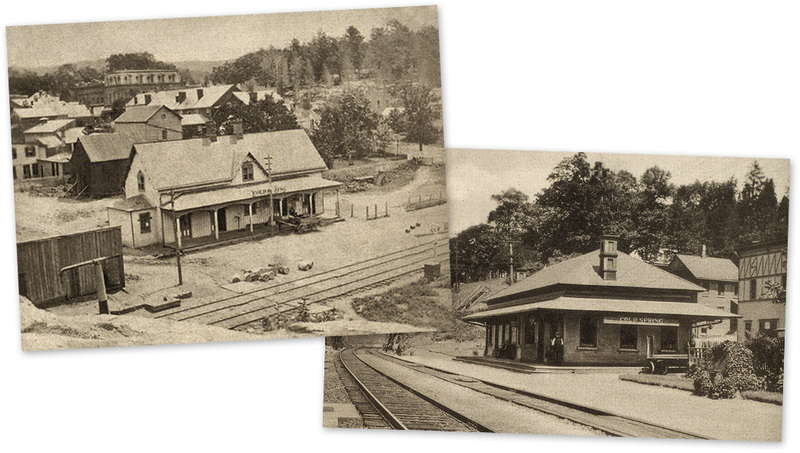 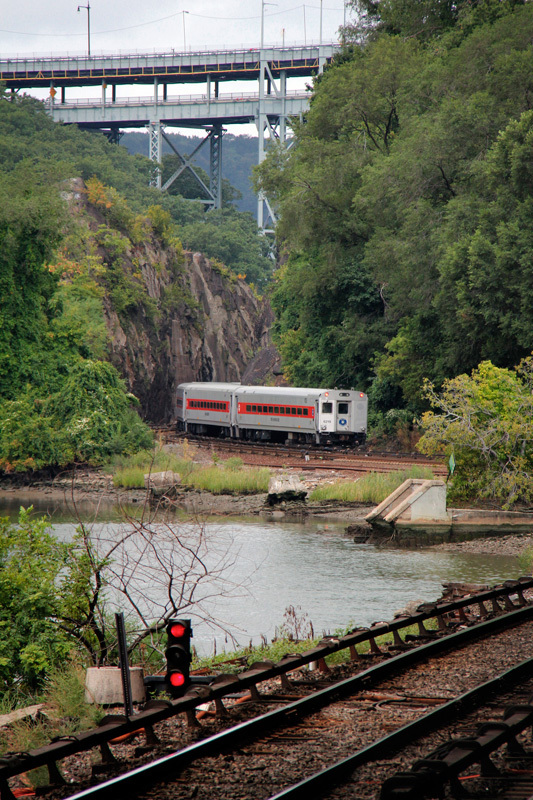 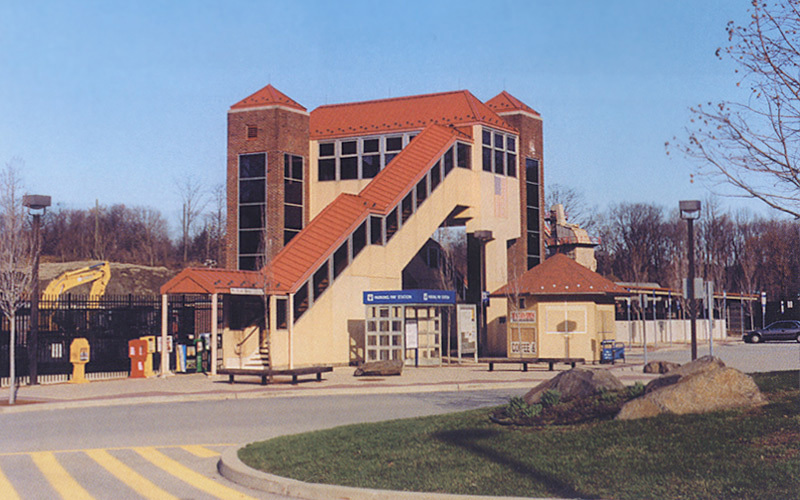 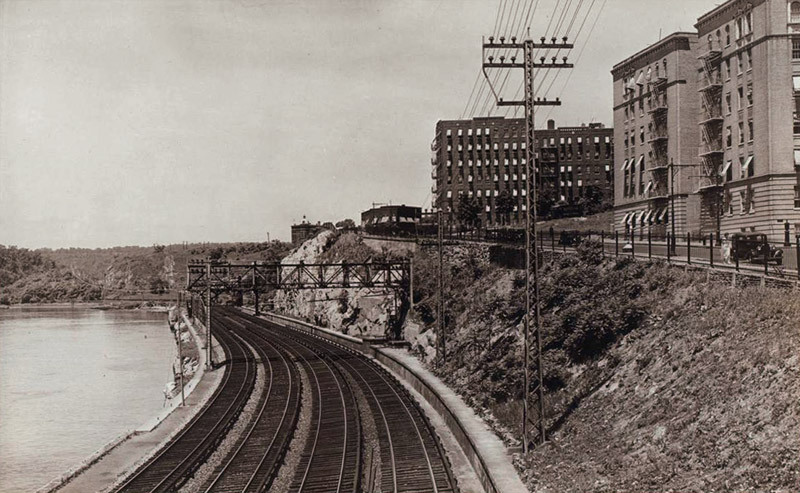 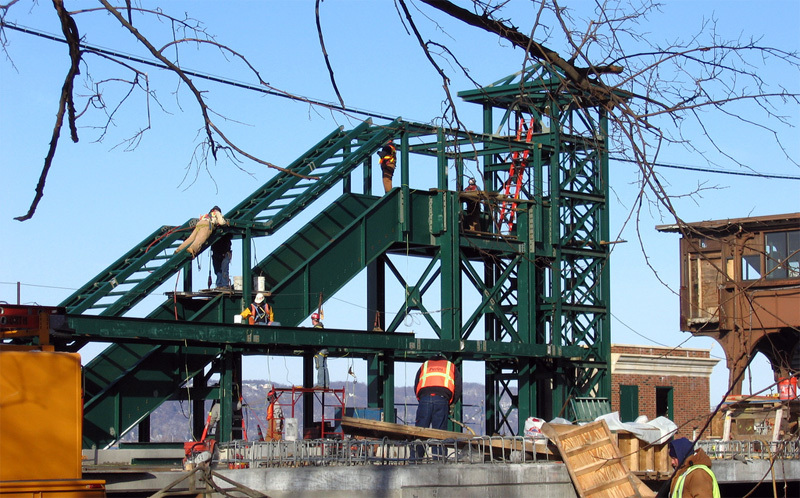 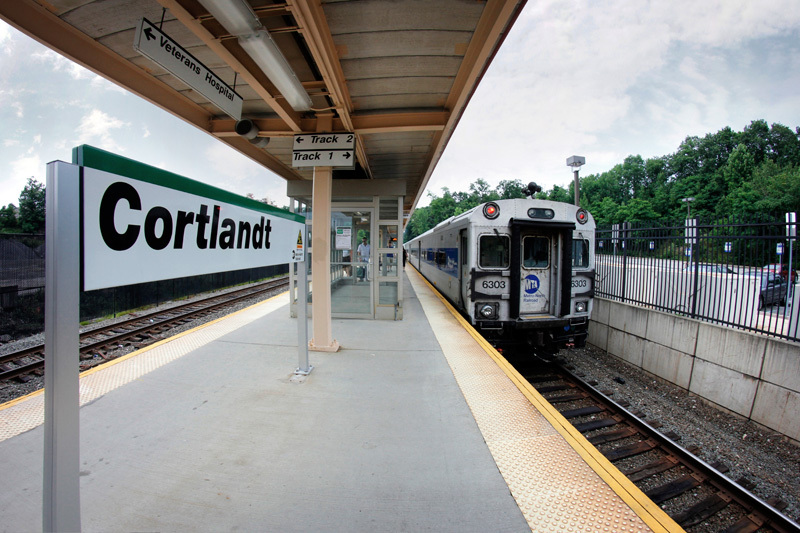 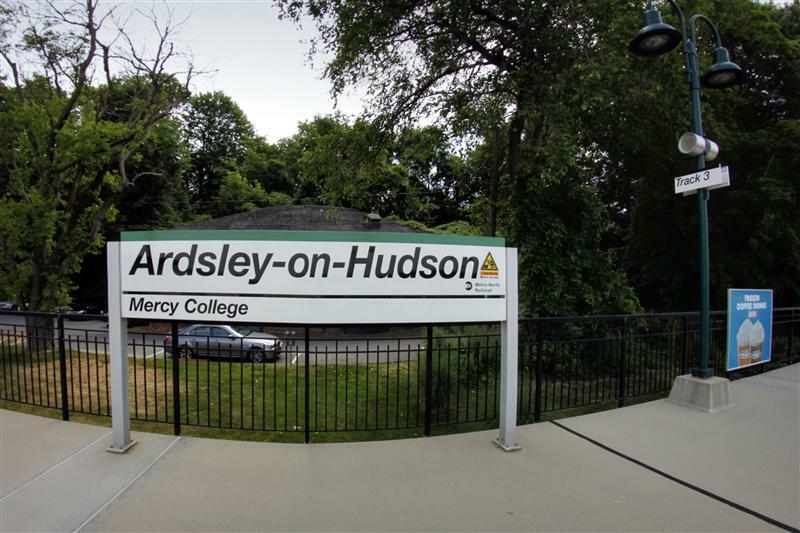 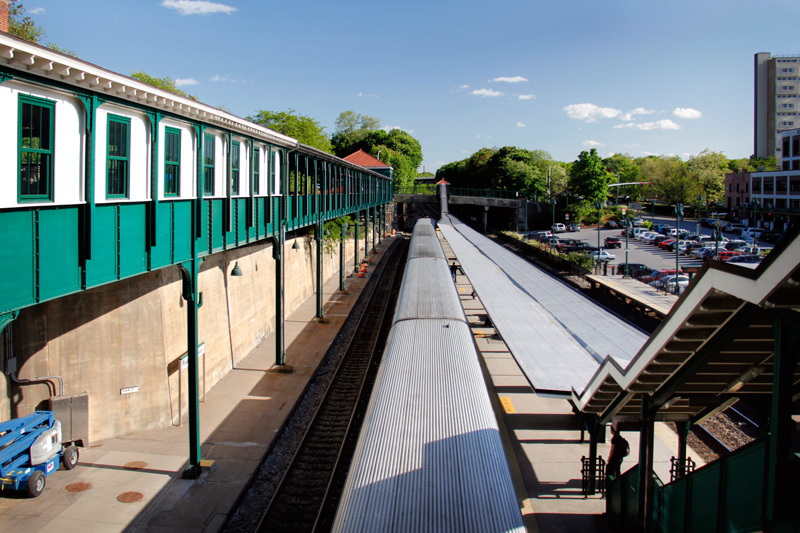 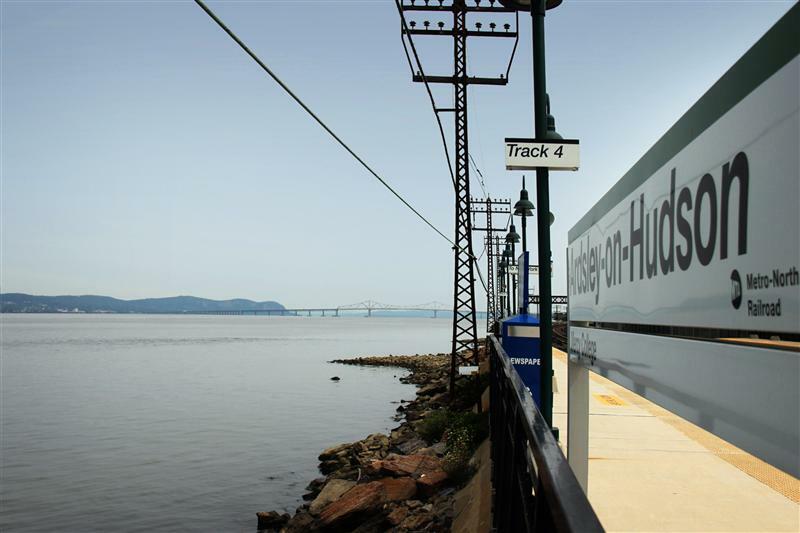 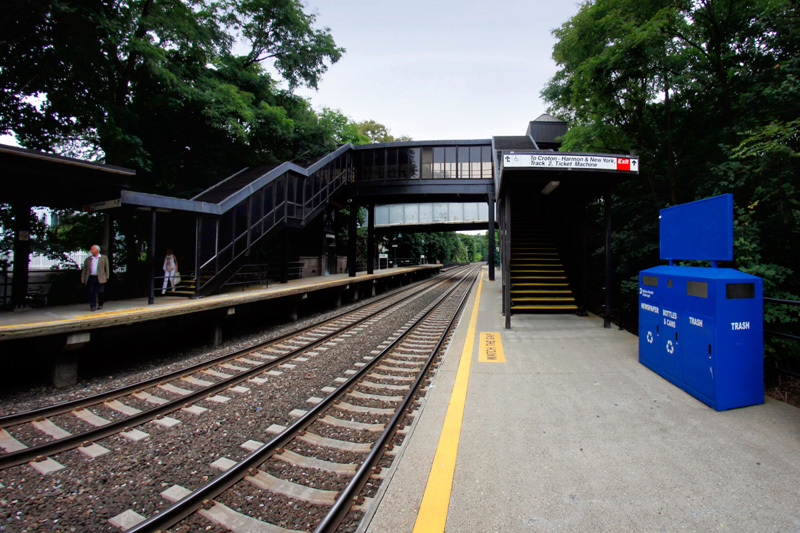 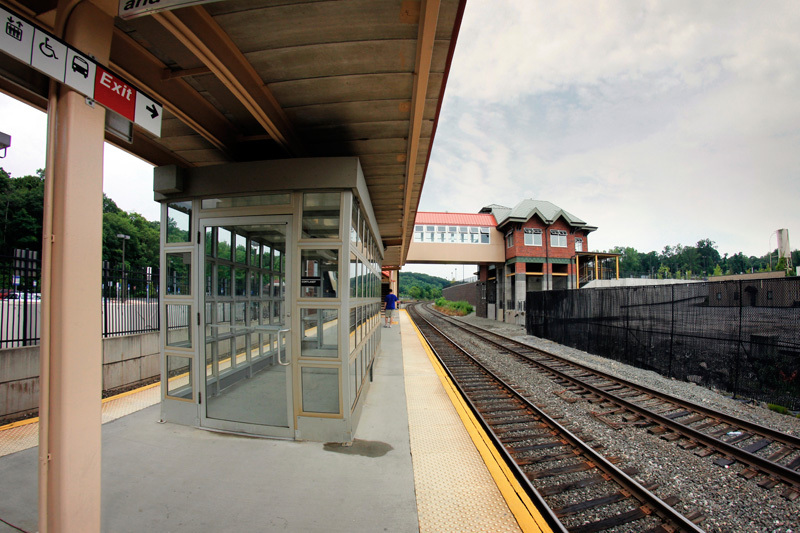 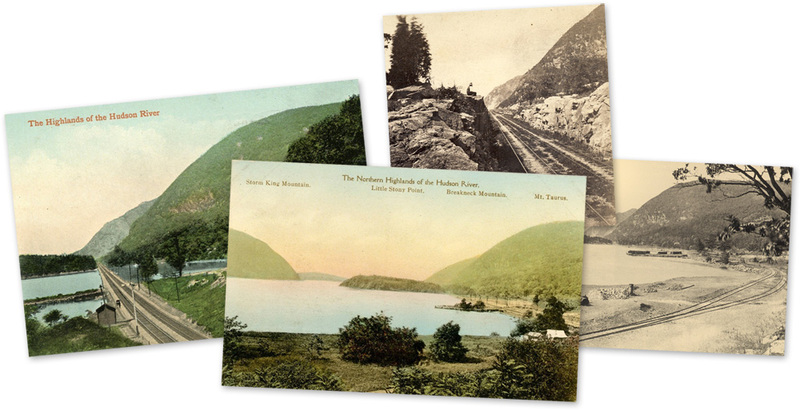 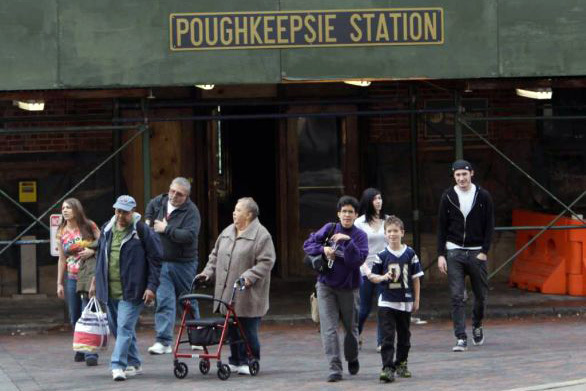 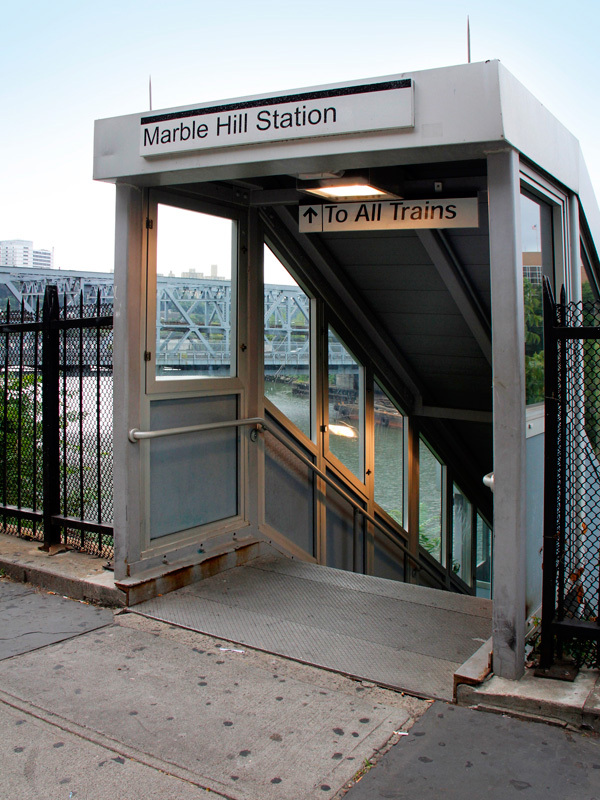 Shepley, Rutan and Coolidge also designed a few stations we’ve featured: Chatham, Dobbs Ferry, Irvington, Tarrytown). 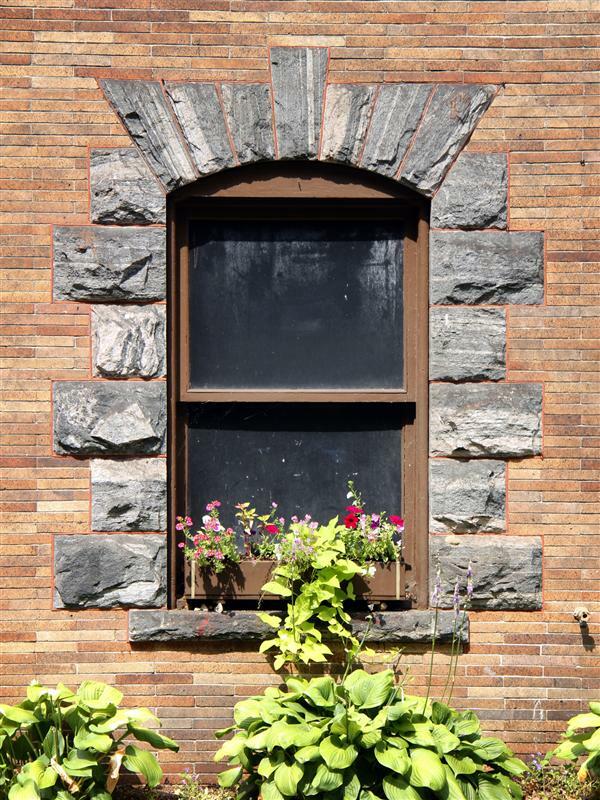 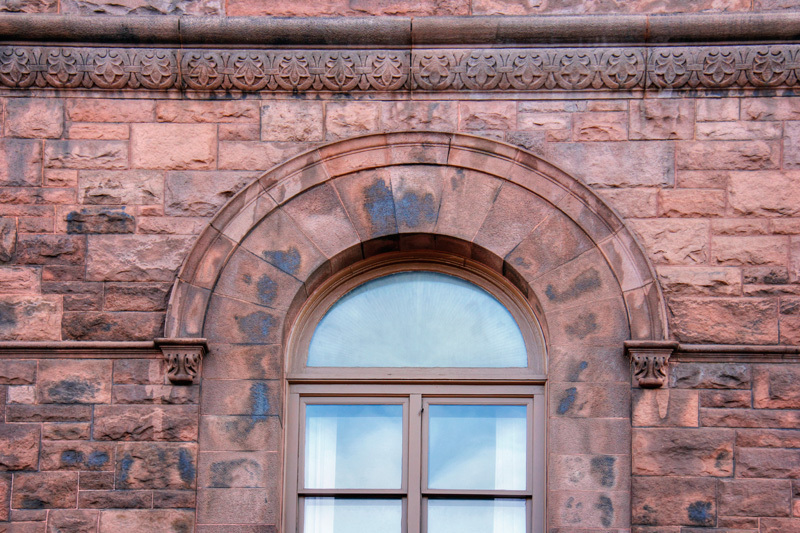 The station featured the typical arches and rusticated stonework characteristic of his style, using stone quarried in Portland, Connecticut. 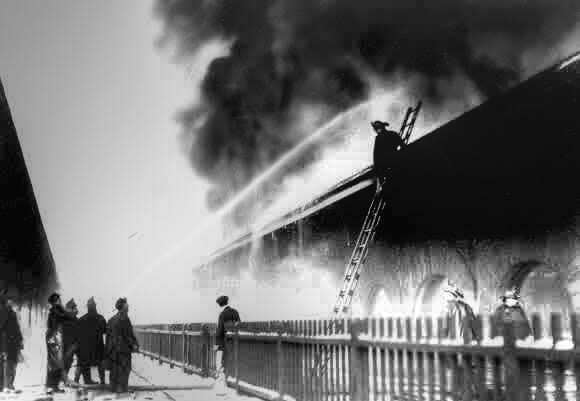 Besides the 100th anniversary of the fire, the station is also celebrating the centennial of its rebirth. 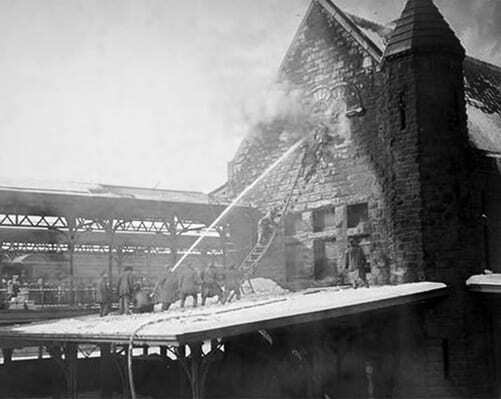 The entire building was not completely destroyed by the aforementioned fire, but the roof and interior were both gutted. 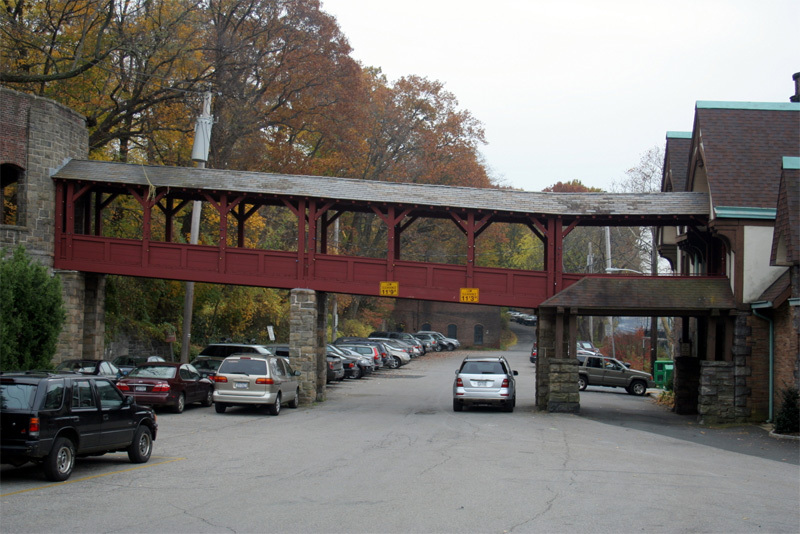 Though some of the decorative arches at roof level were only slightly damaged, it was decided that the rebuild would not be to the exact specifications of the old station. 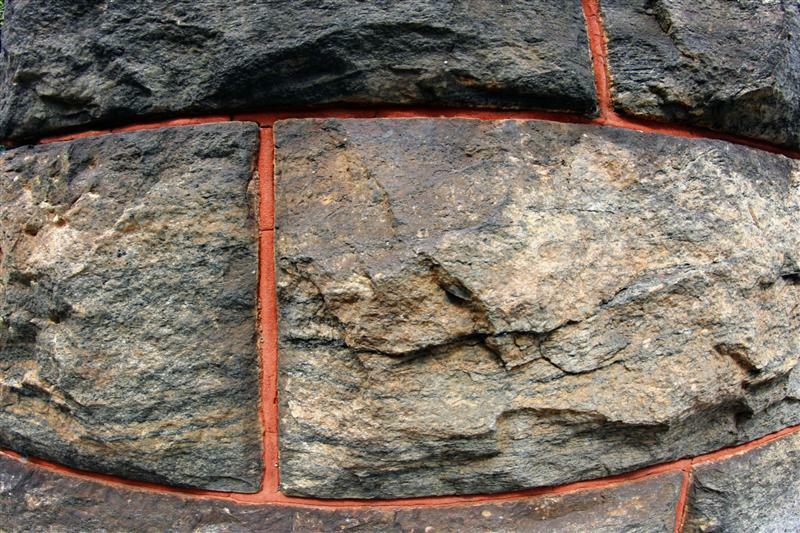 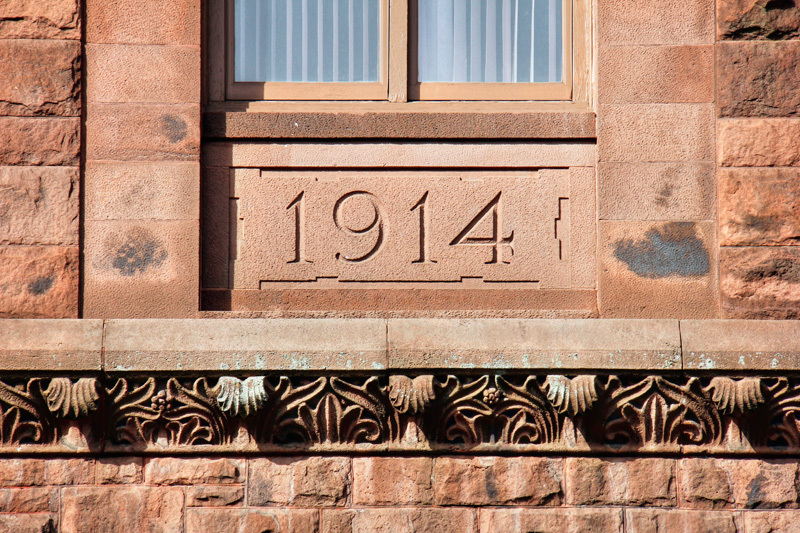 Roof-level decorative elements were removed, and stonework was repaired – now bearing the date “1914”. 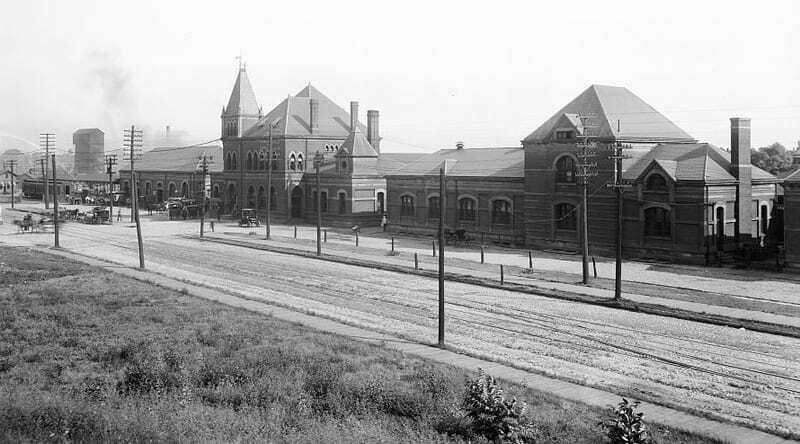 The “new” Union Station boasted a full third story, and, as one would imagine, a fireproof roof. 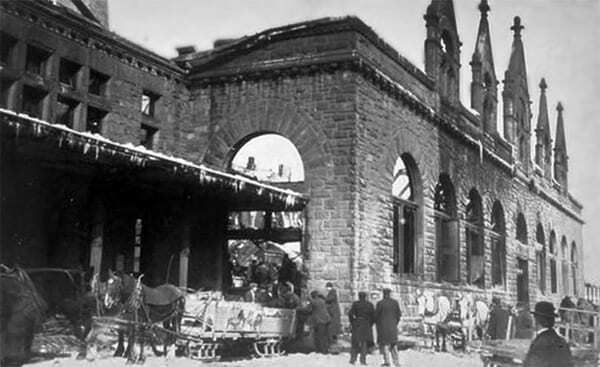 The station after the fire was put out. 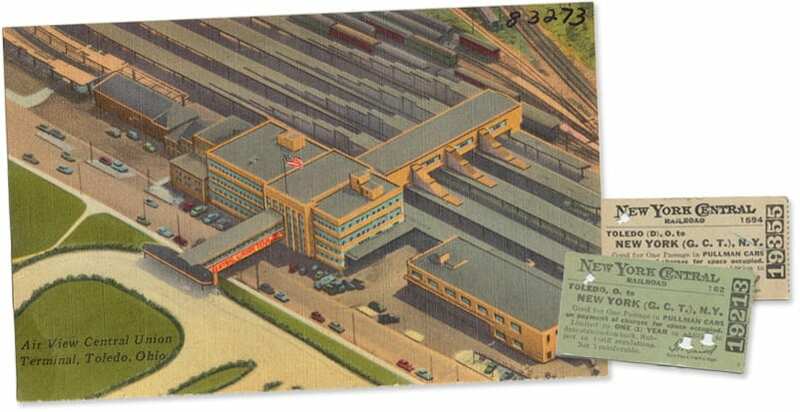 Note the detail on the roof that no longer exists. 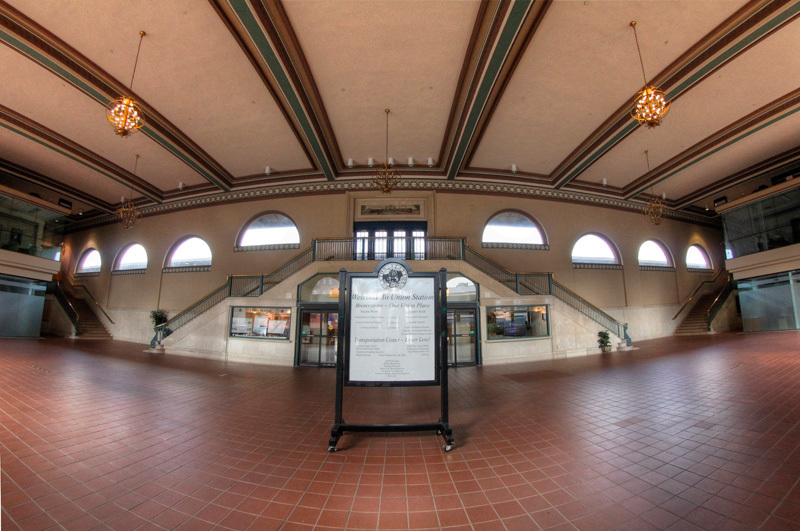 Despite spending the first twenty plus years of my life living in Connecticut, I am mildly embarrassed to admit that I had never visited Hartford’s Union Station until recently. 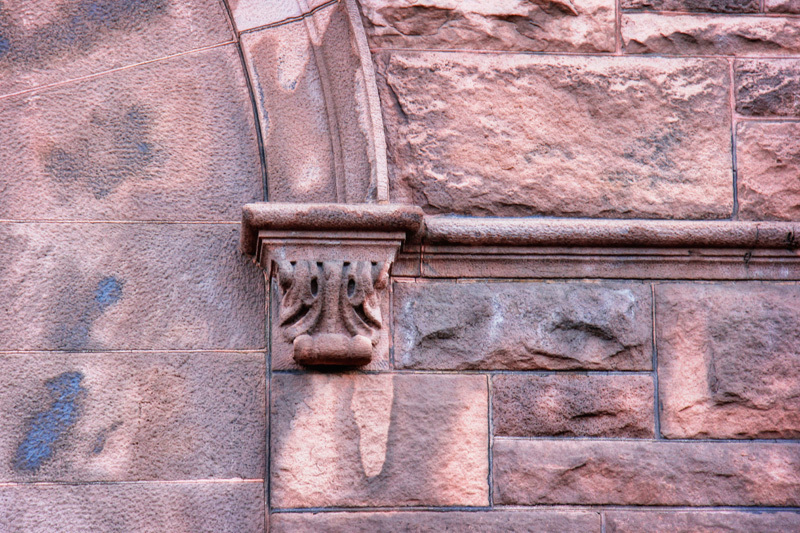 Likewise, I must also admit that I was unaware that Hartford’s Latin motto is Post nubila, phoebus (after clouds, the sun). 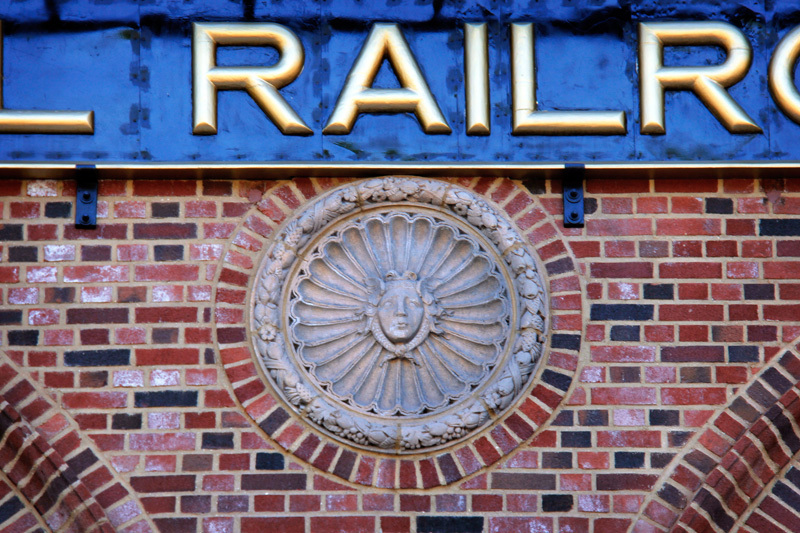 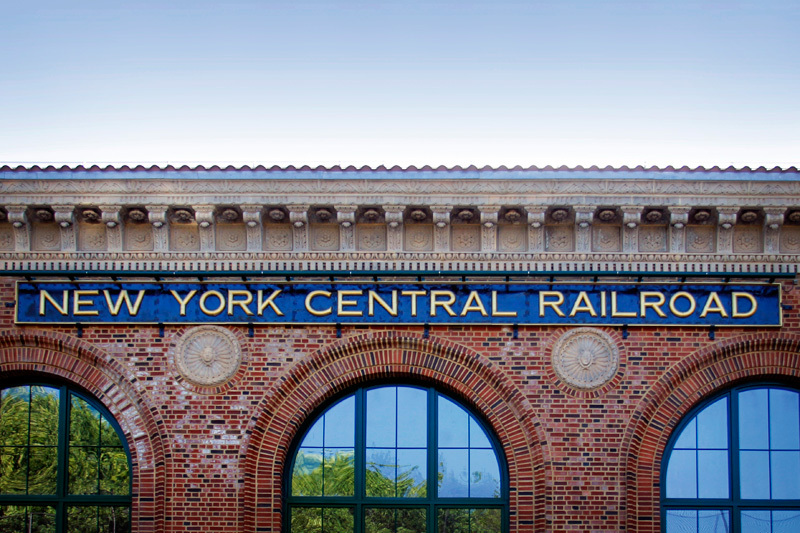 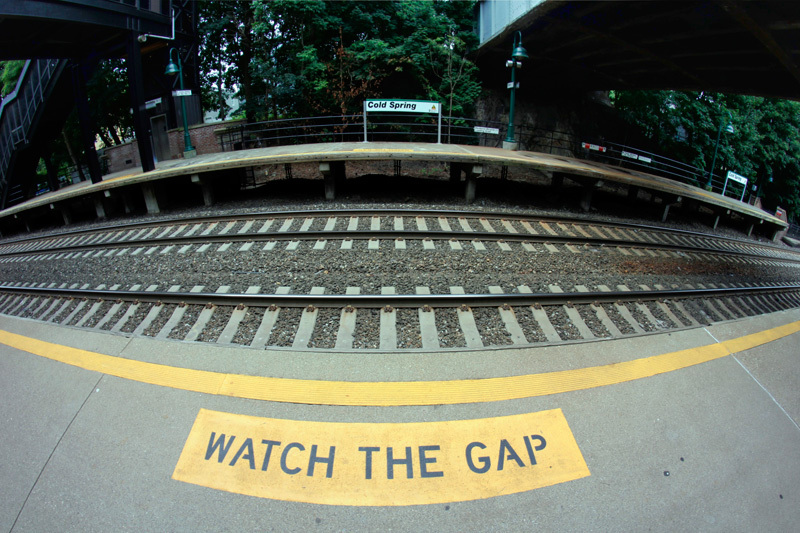 That motto can be found within the station, above the doors that once led out to the platform, flanked between the past and present of railroading – steam and electric. 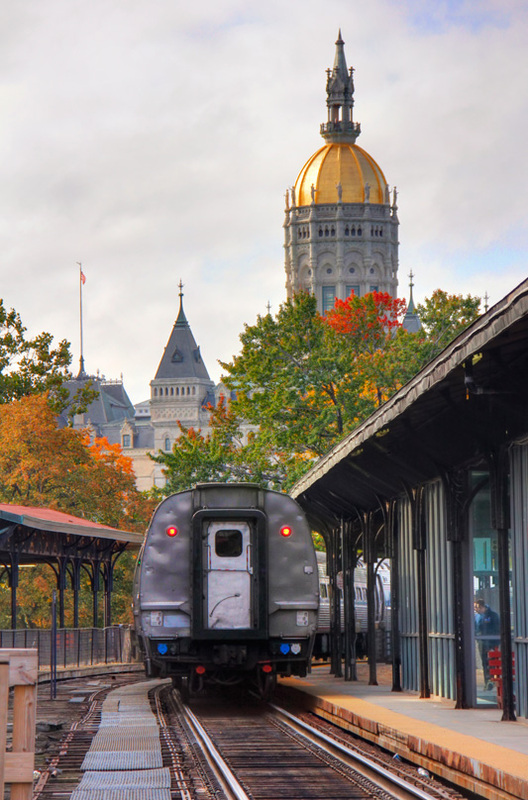 These days, Hartford is not the hub it once was. 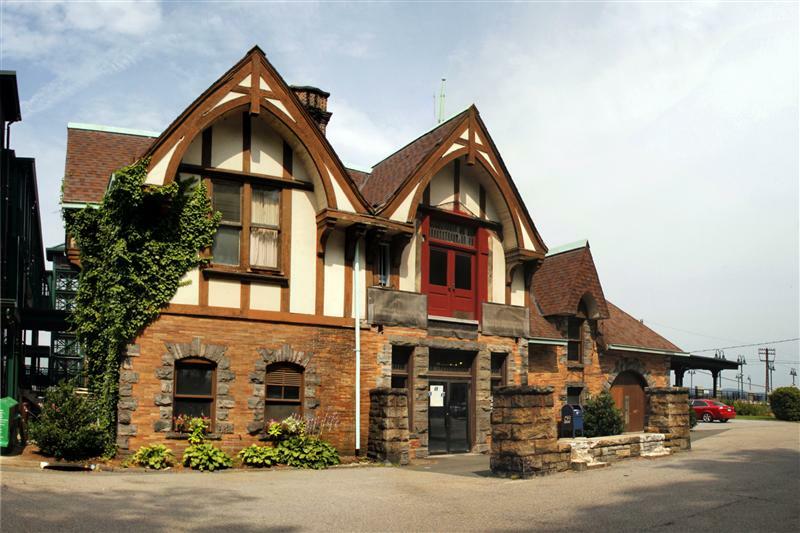 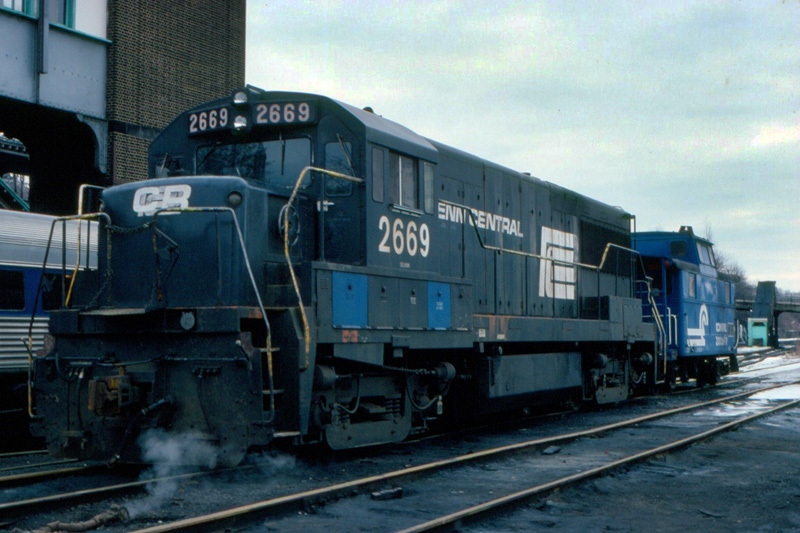 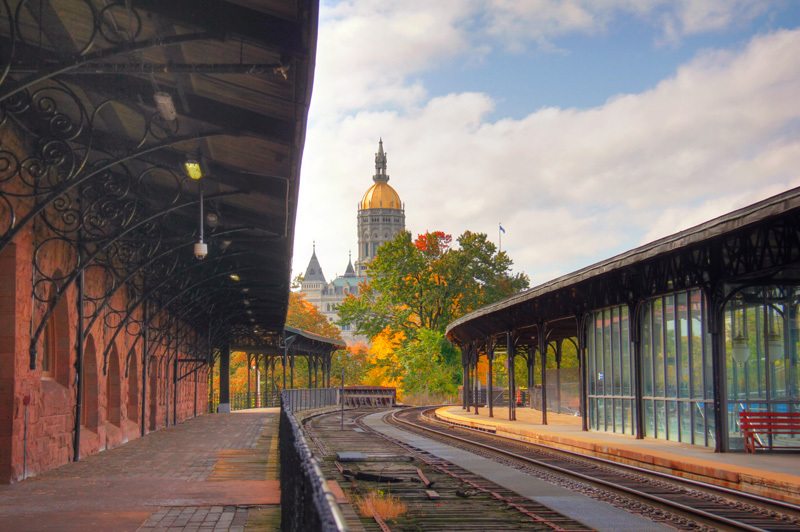 No longer are the days where trains were plenty, and it has been many decades since quasi-celebrity citizens like Mark Twain and Harriet Beecher Stowe called Hartford home. 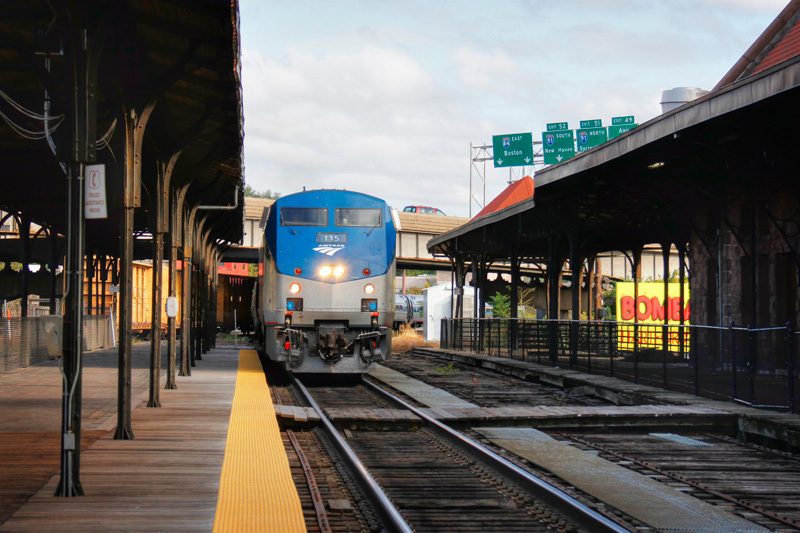 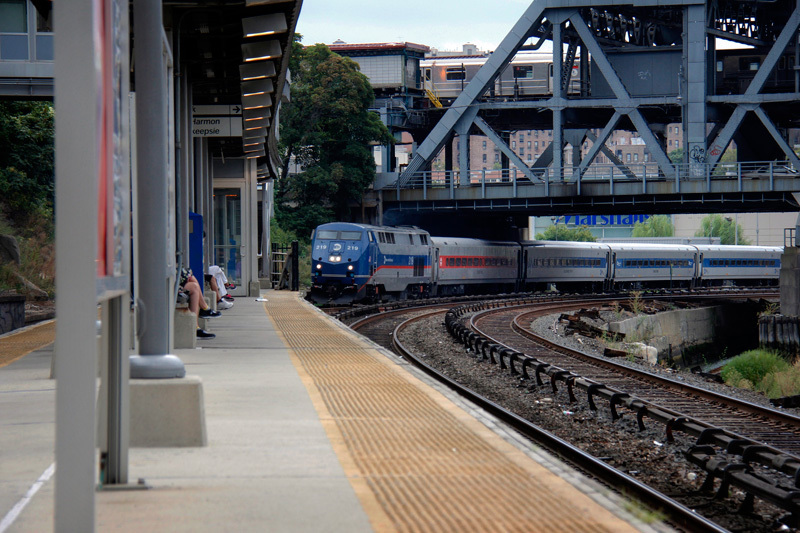 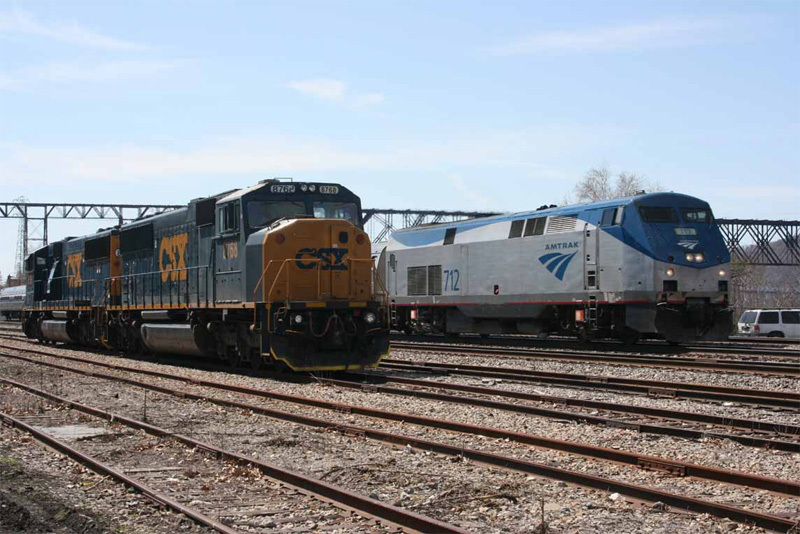 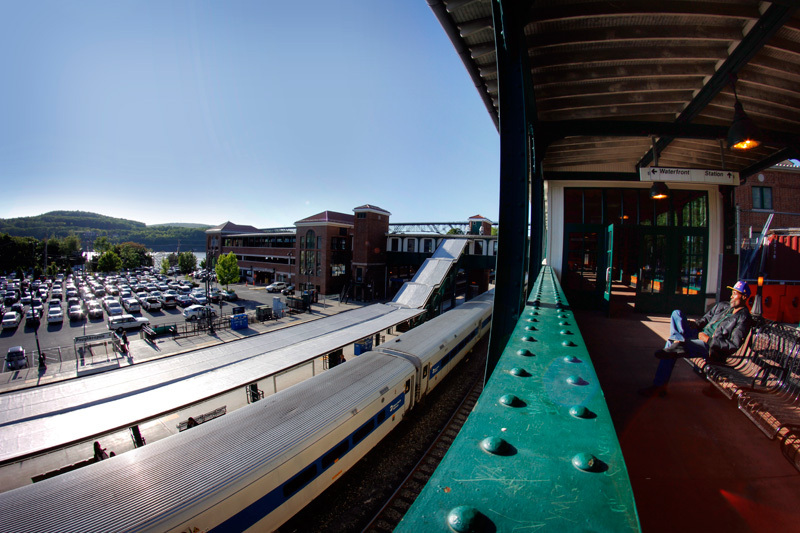 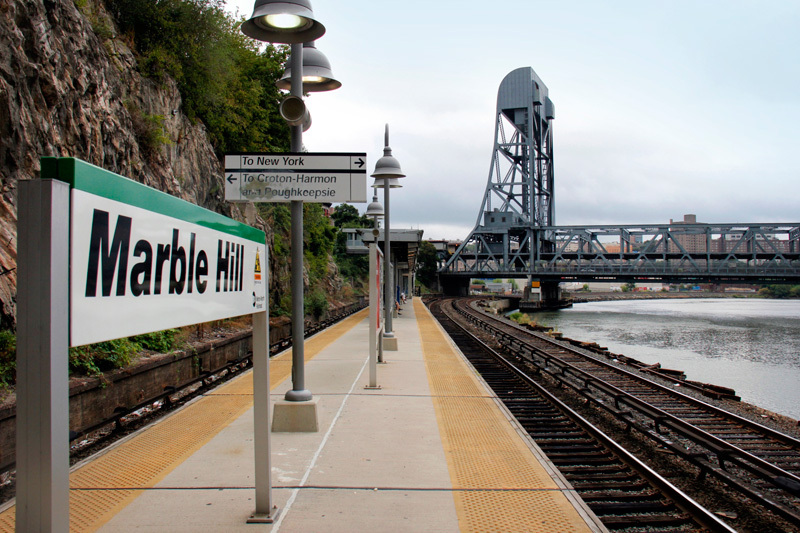 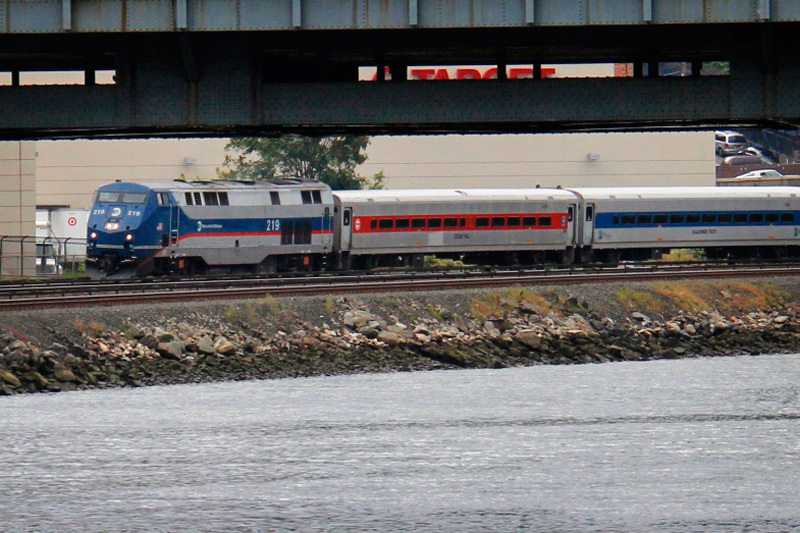 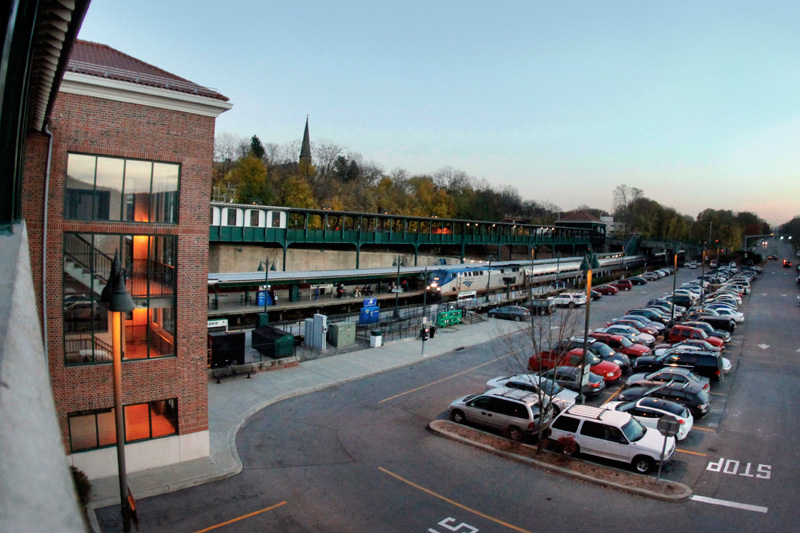 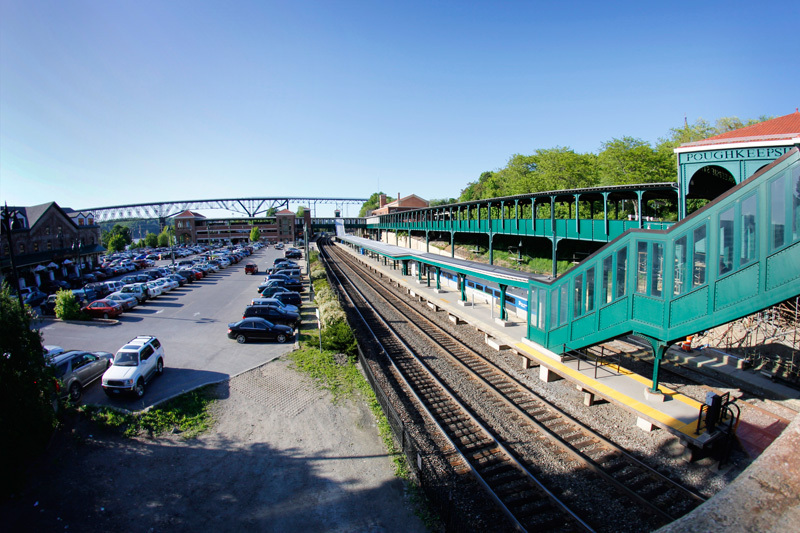 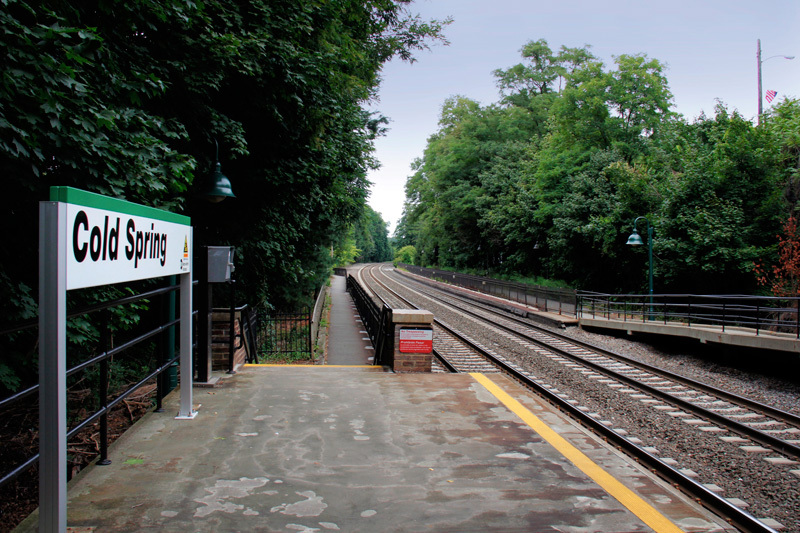 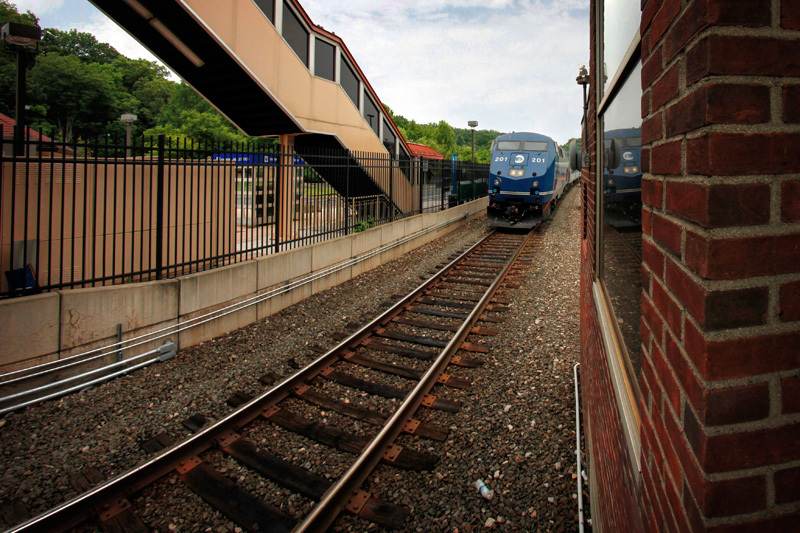 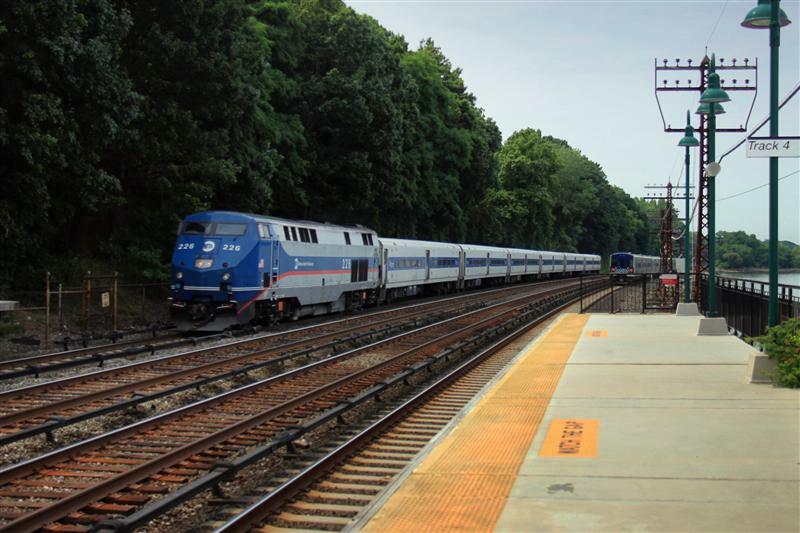 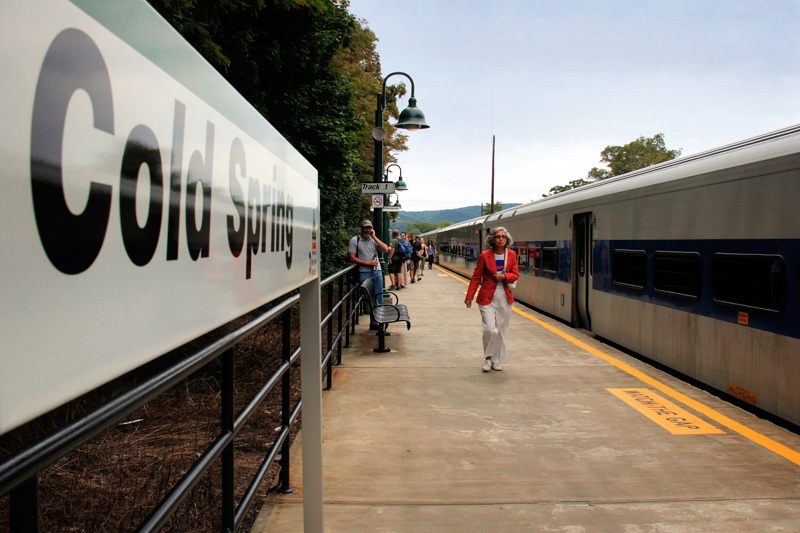 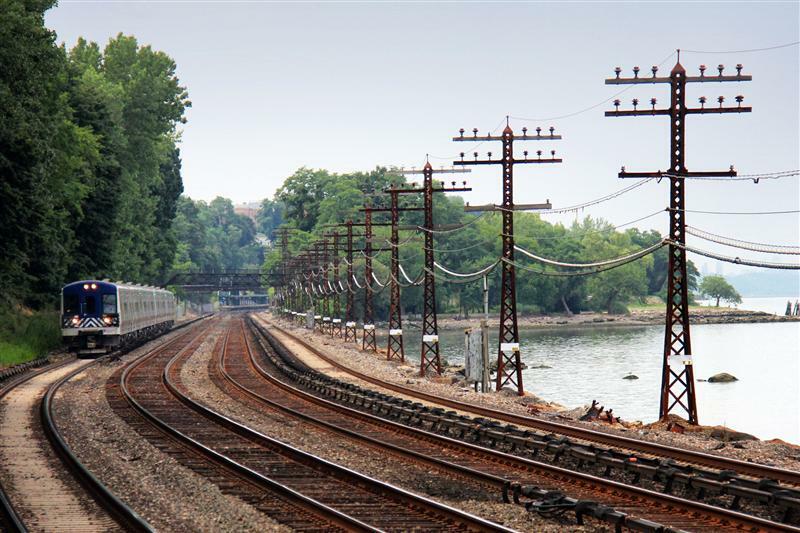 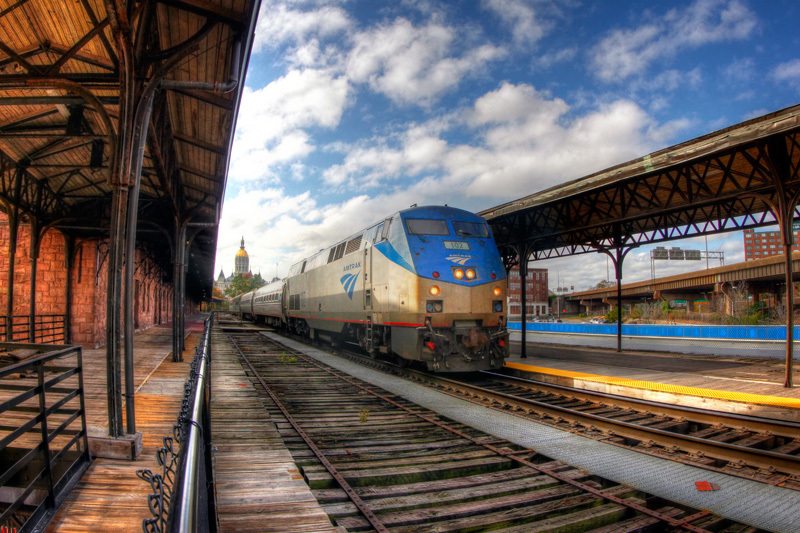 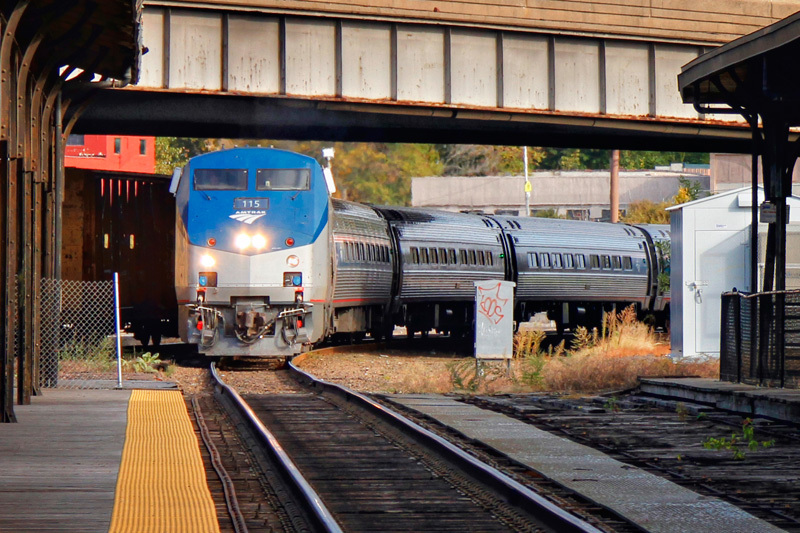 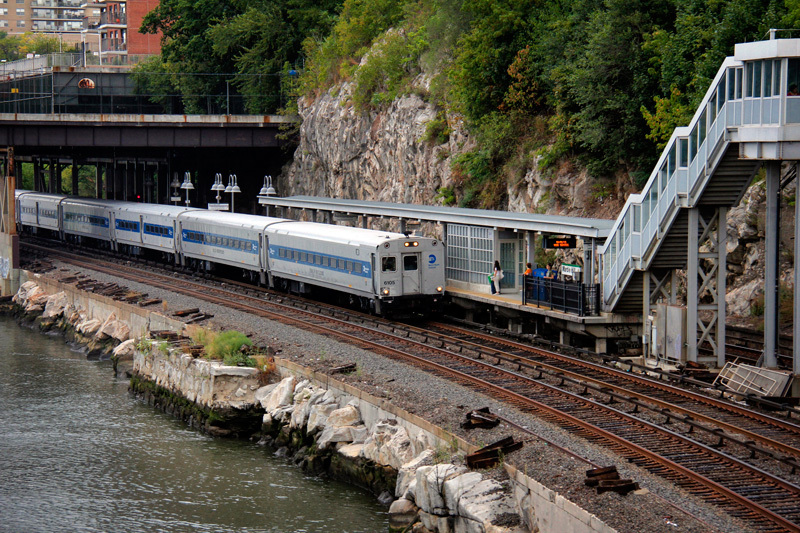 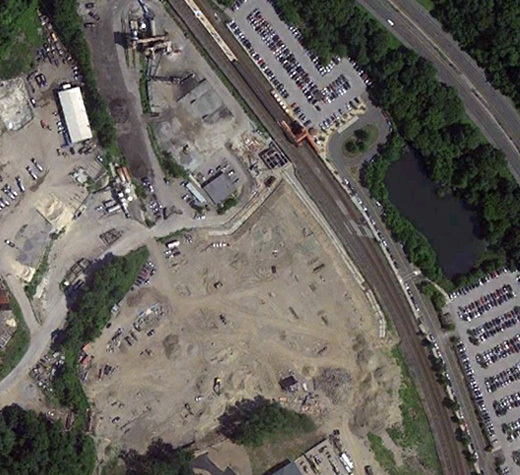 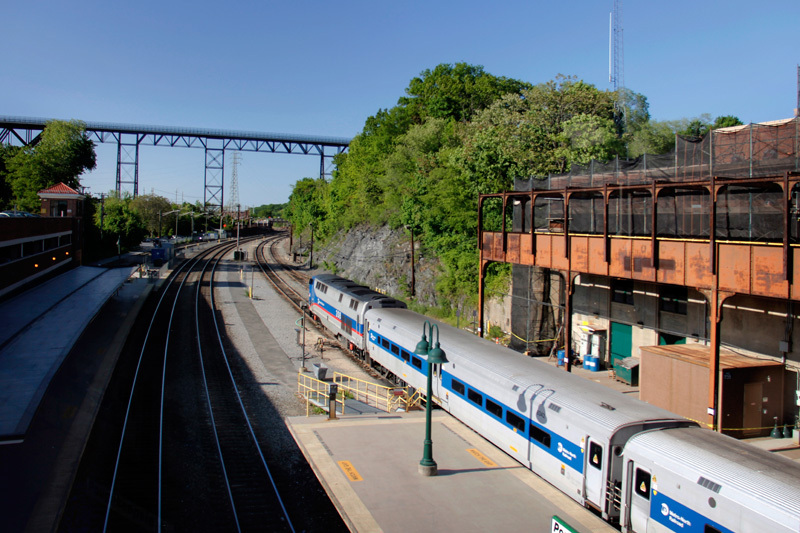 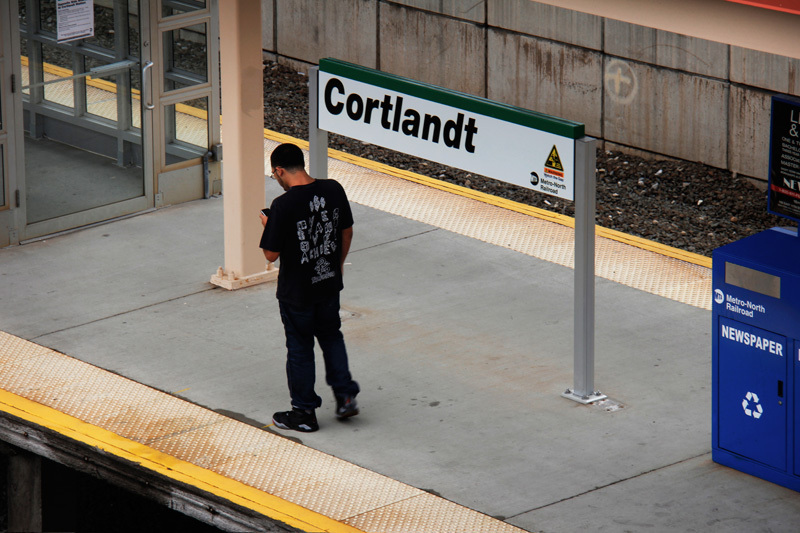 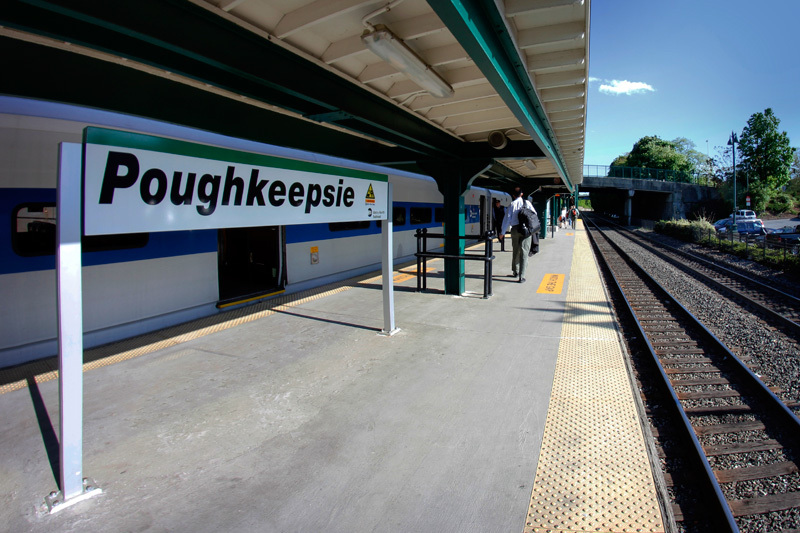 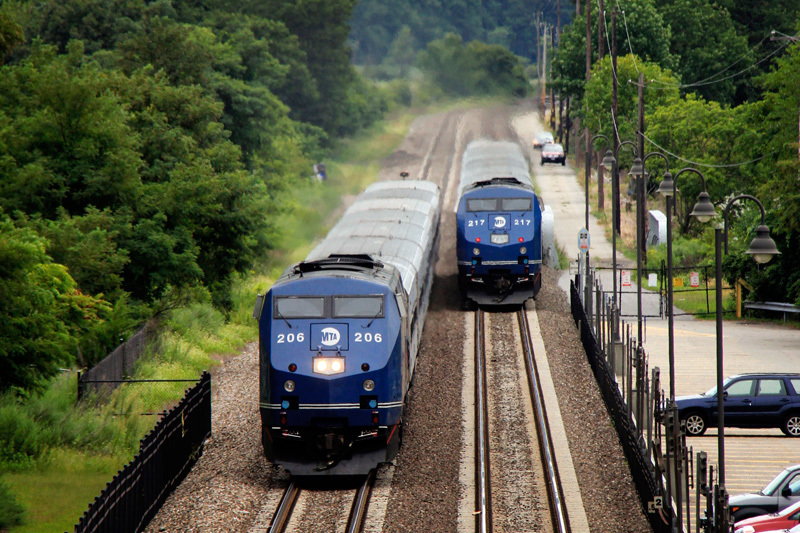 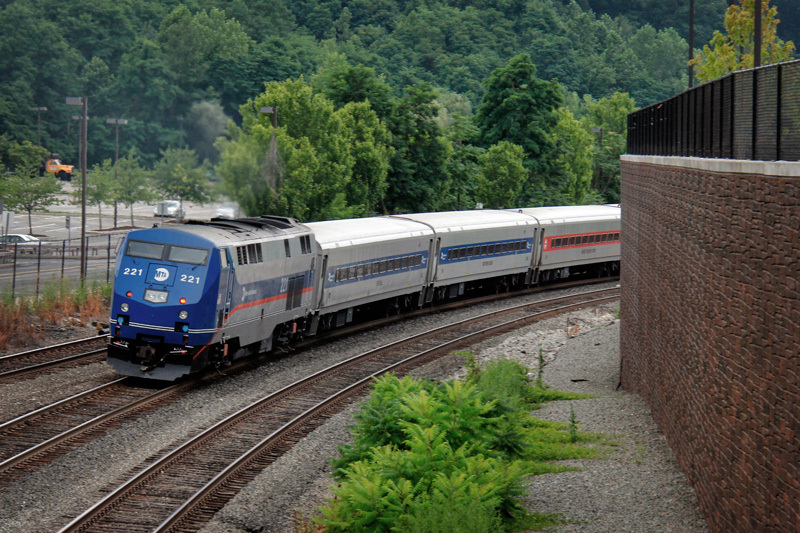 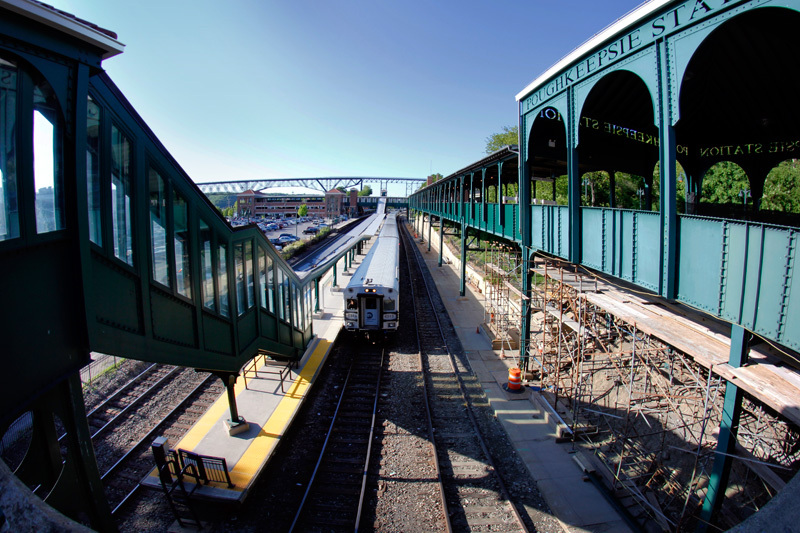 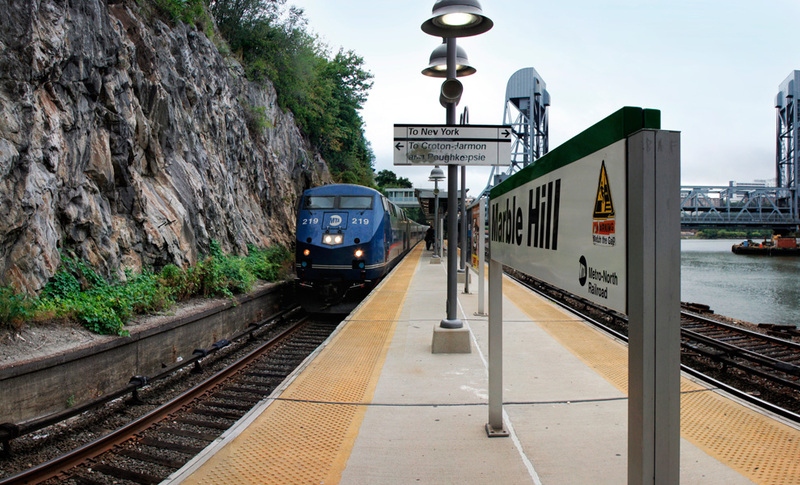 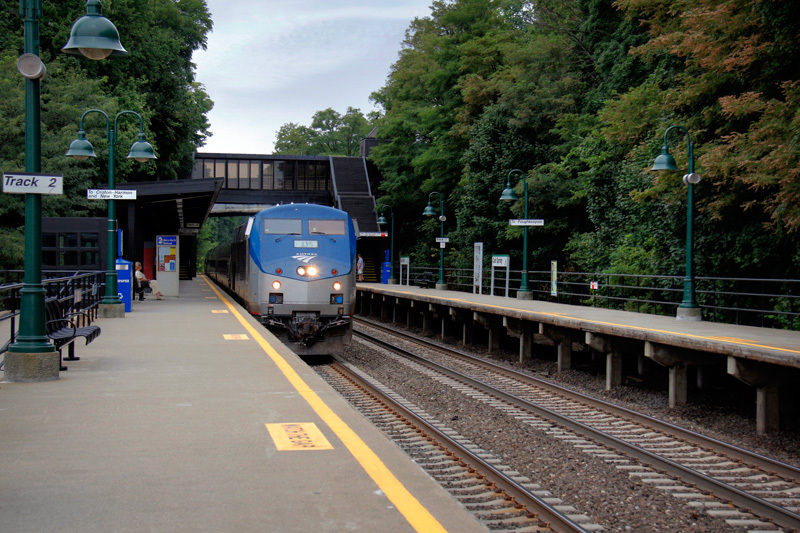 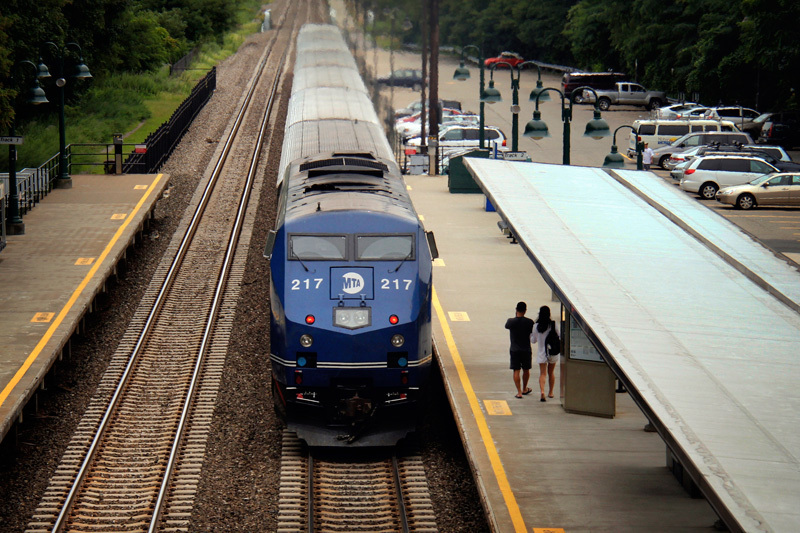 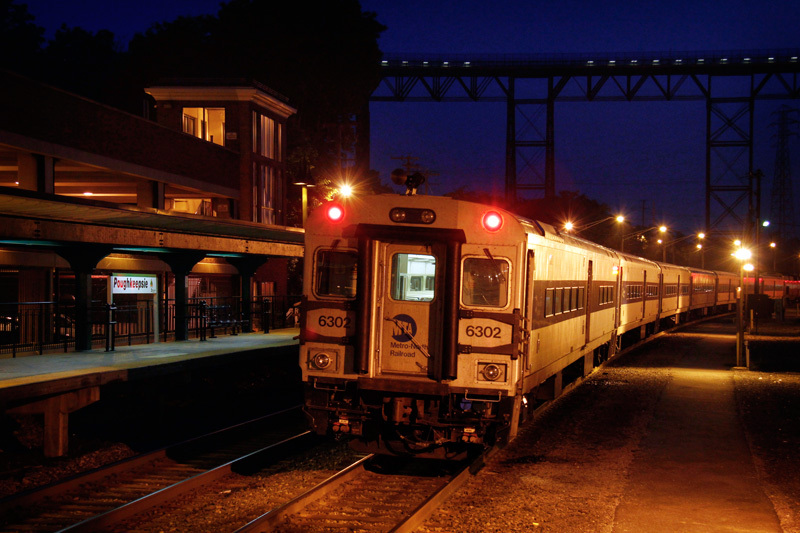 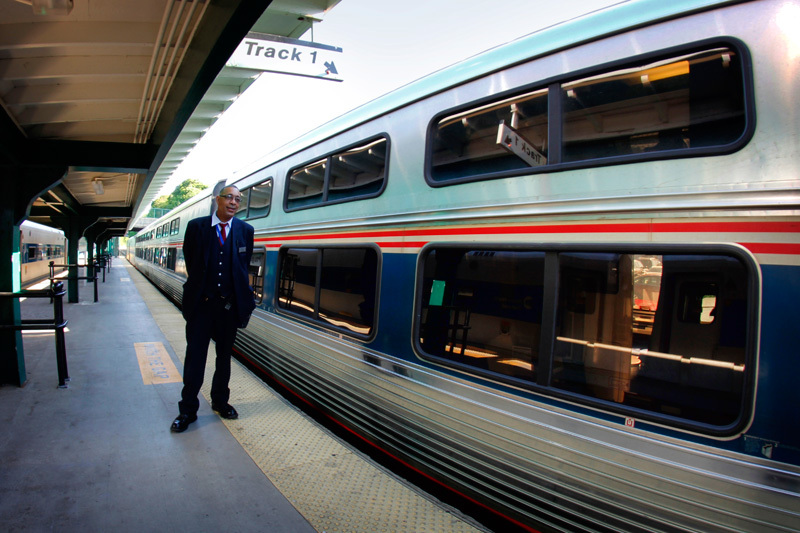 About twelve trains stop daily at the station, the station is along Amtrak’s Vermonter, and Northeast Regional routes, and is a station stop on the New Haven – Springfield shuttle. 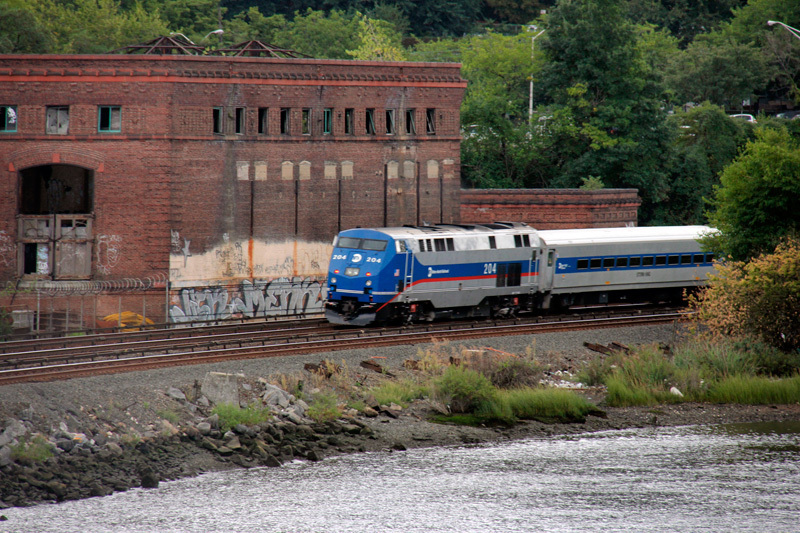 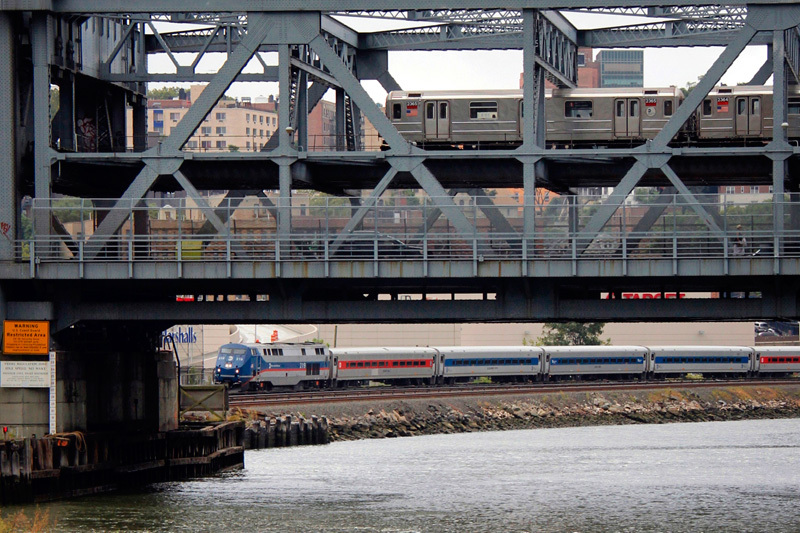 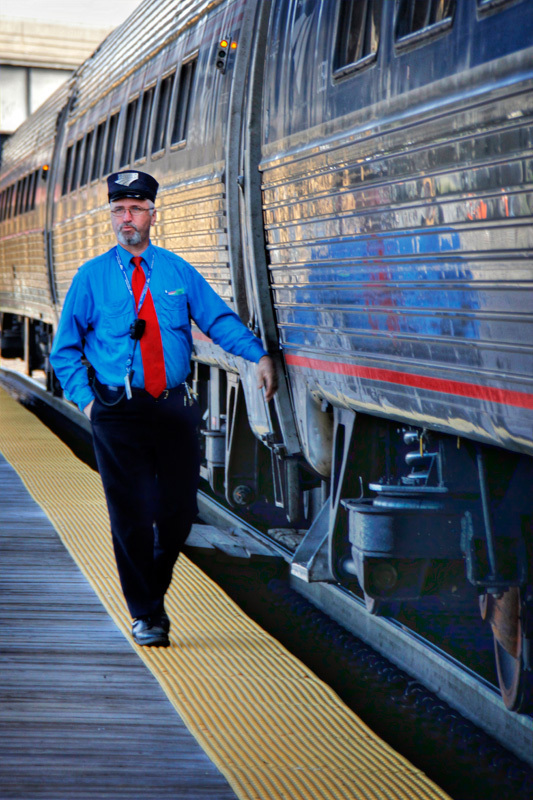 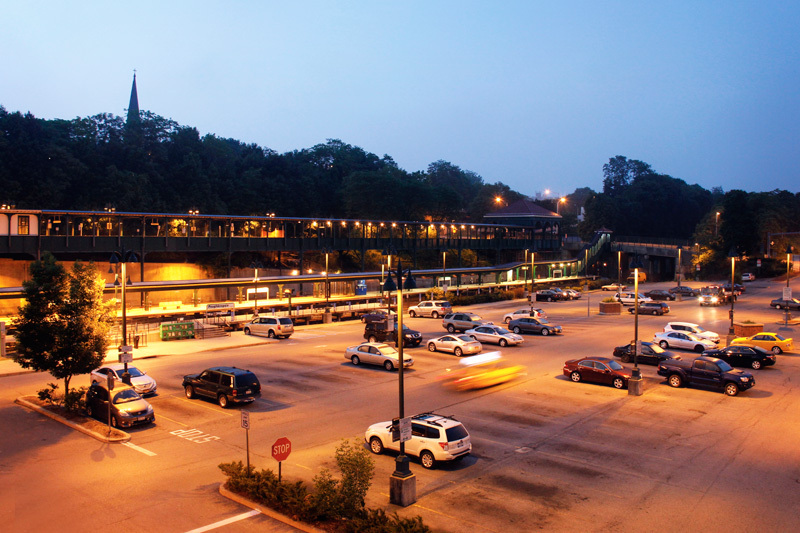 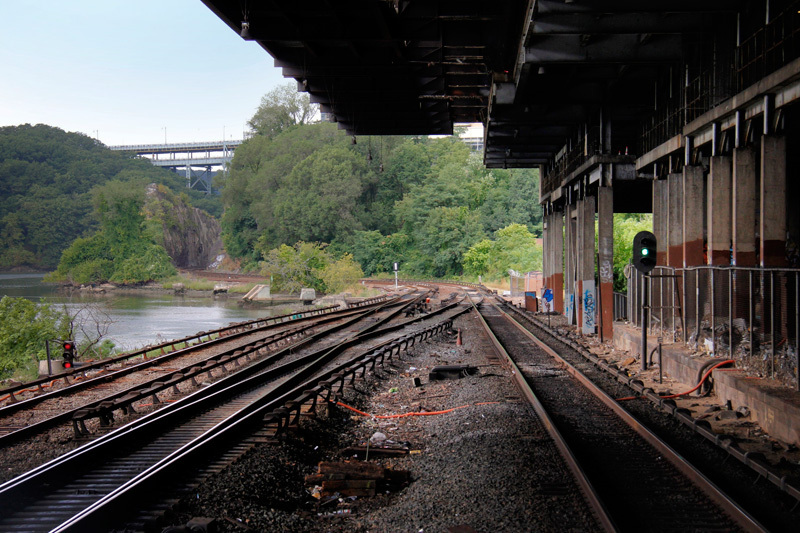 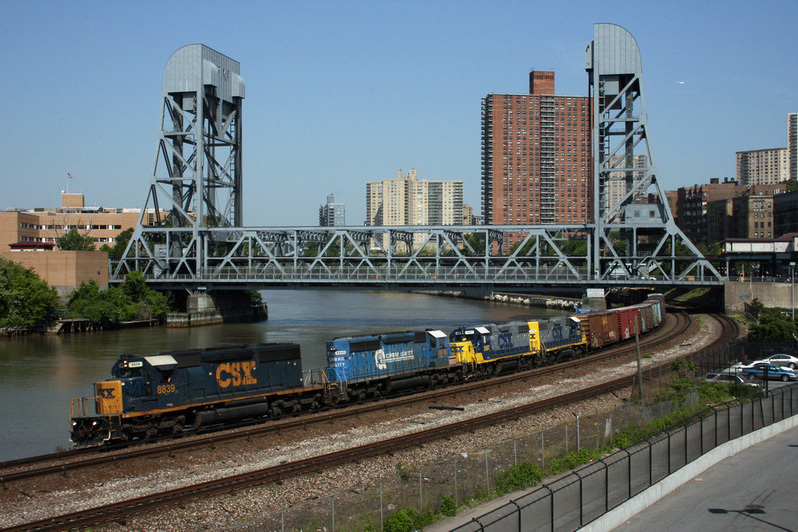 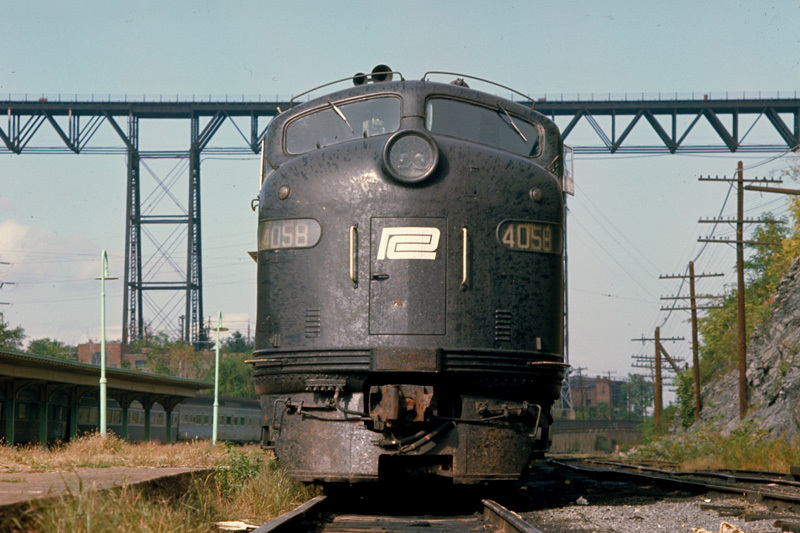 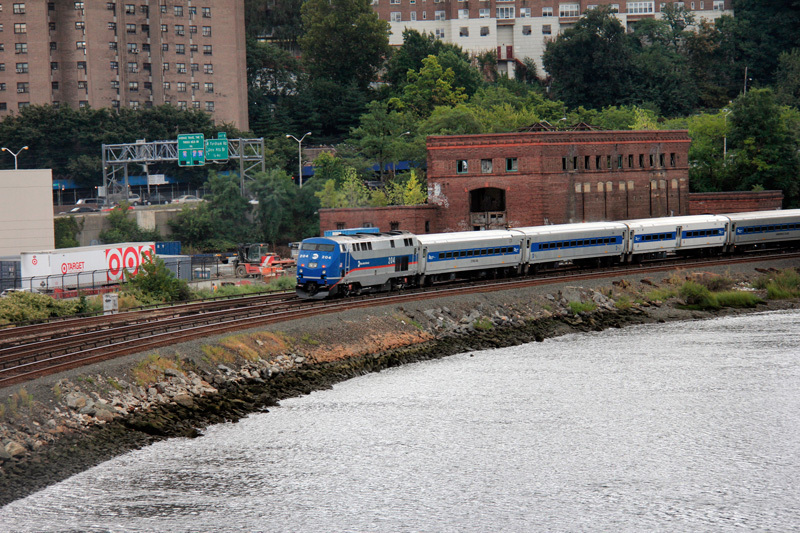 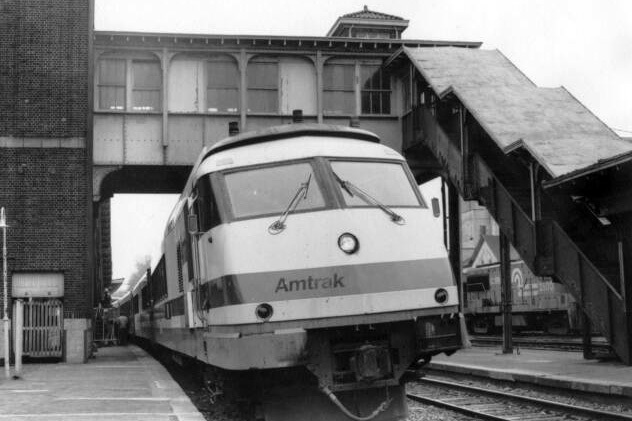 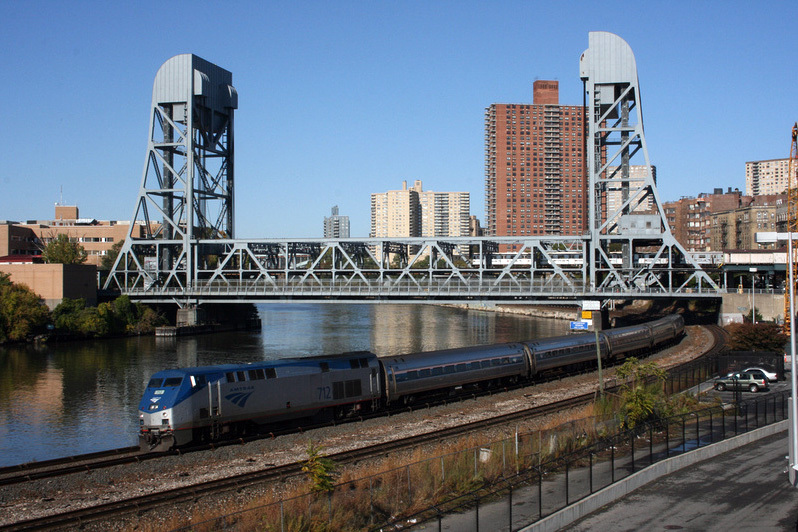 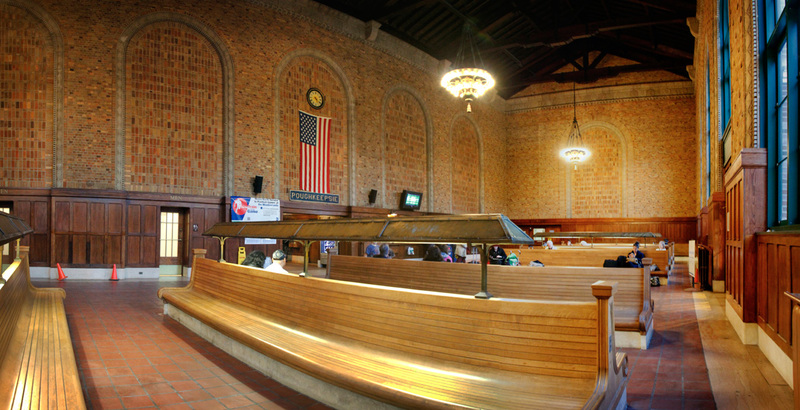 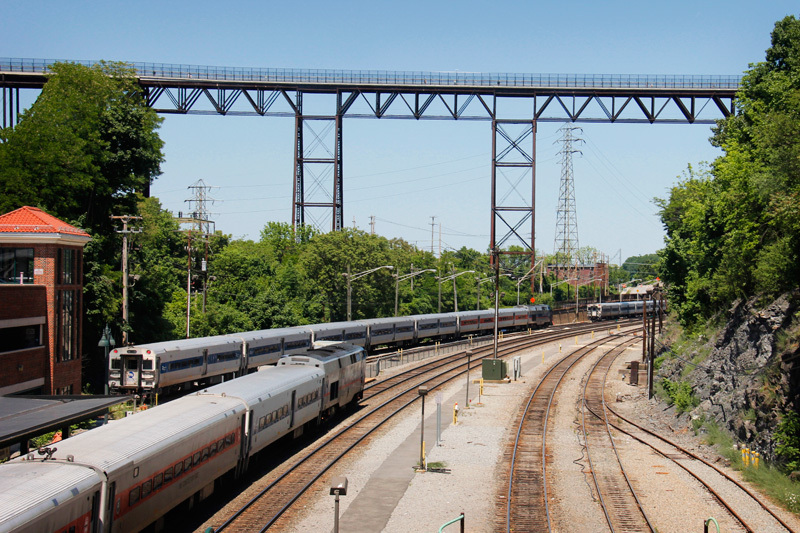 Technically trains don’t run from the historical building – Amtrak occupies out of an addition underneath the viaduct carrying the railroad over the city, along with bus operators and a few fast food kiosks. 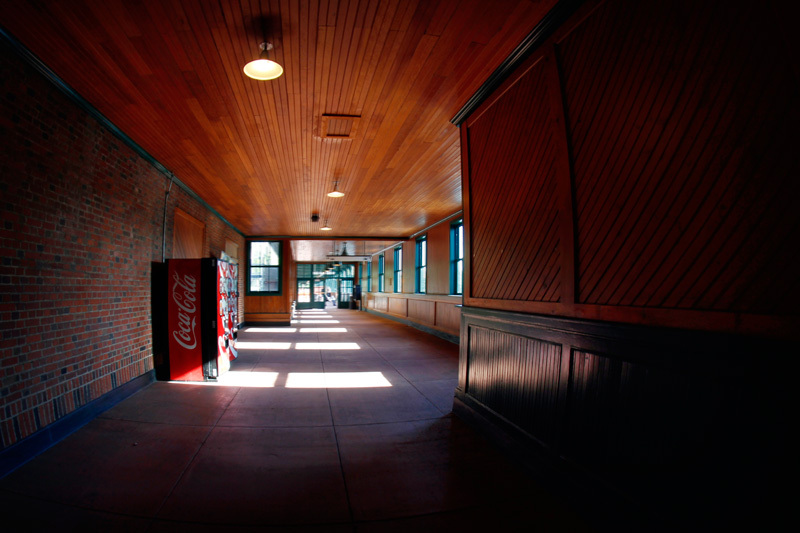 One can, however, enter the addition from the historical depot. 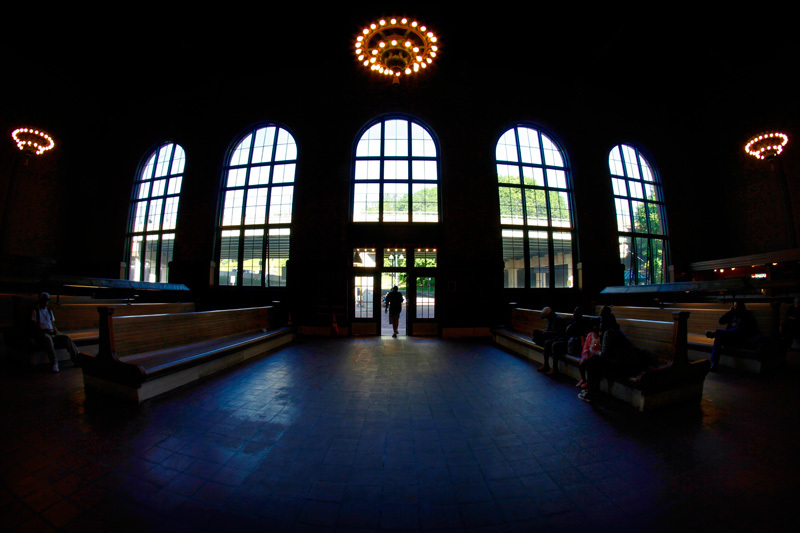 If you’re ever passing through Hartford, the old station is at least worth a look. 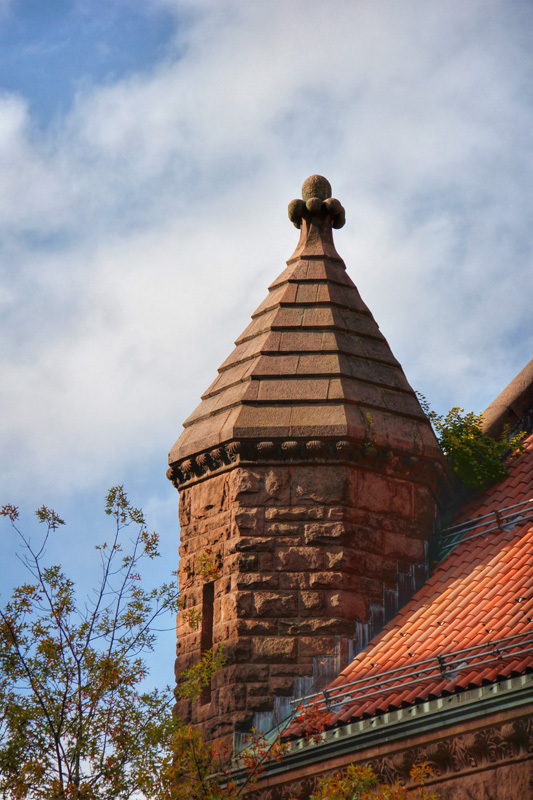 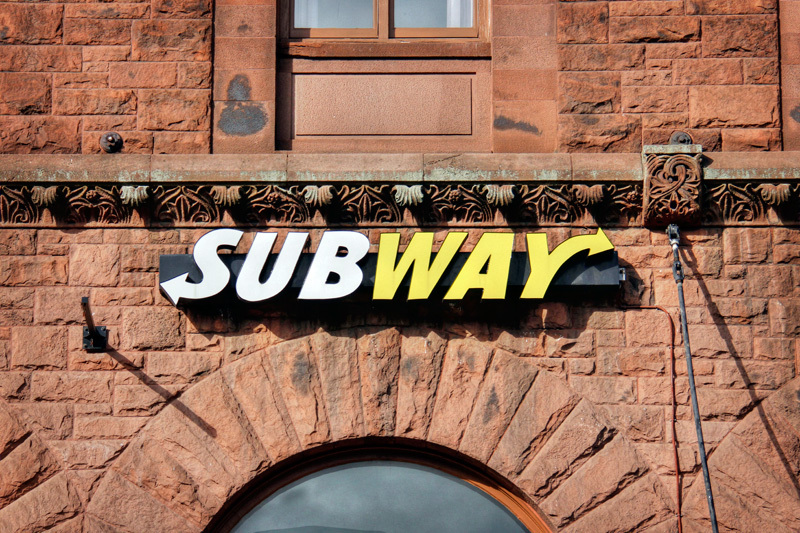 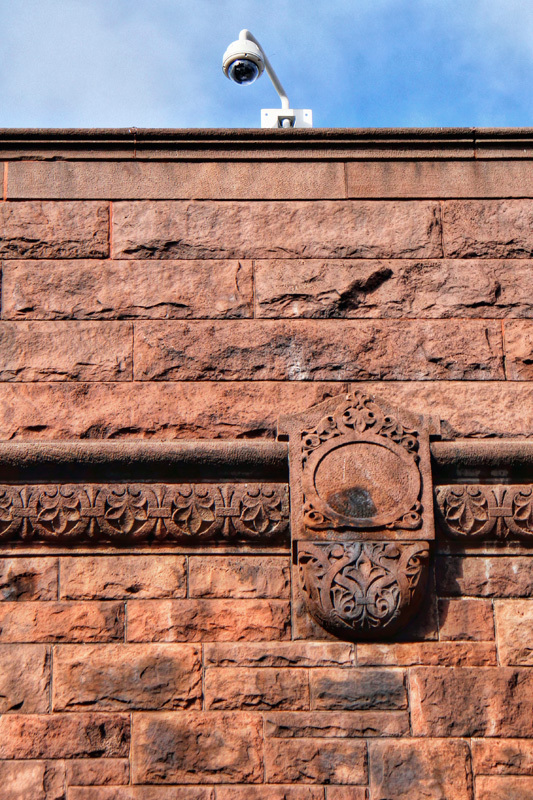 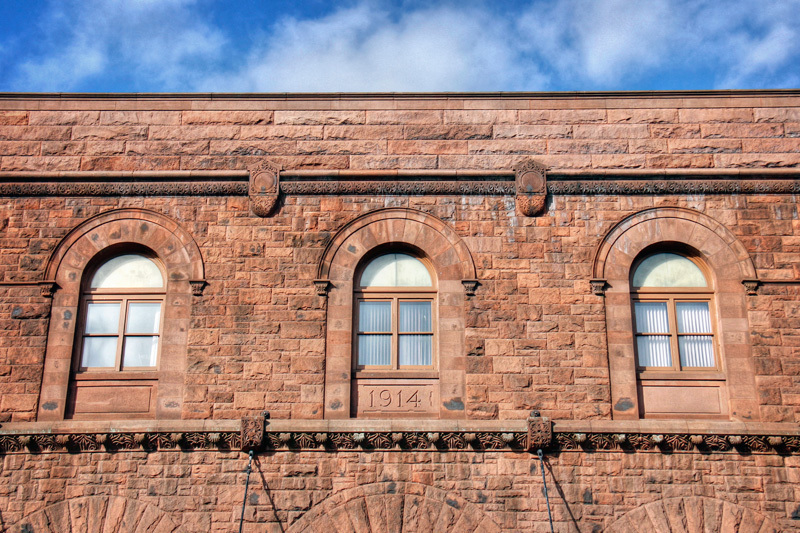 The stonework and detailing found on the exterior is undoubtedly beautiful, only marred by a few trappings of today – you’ll find security cameras just above decorative elements, and a garish Subway logo above a once more graceful arch. 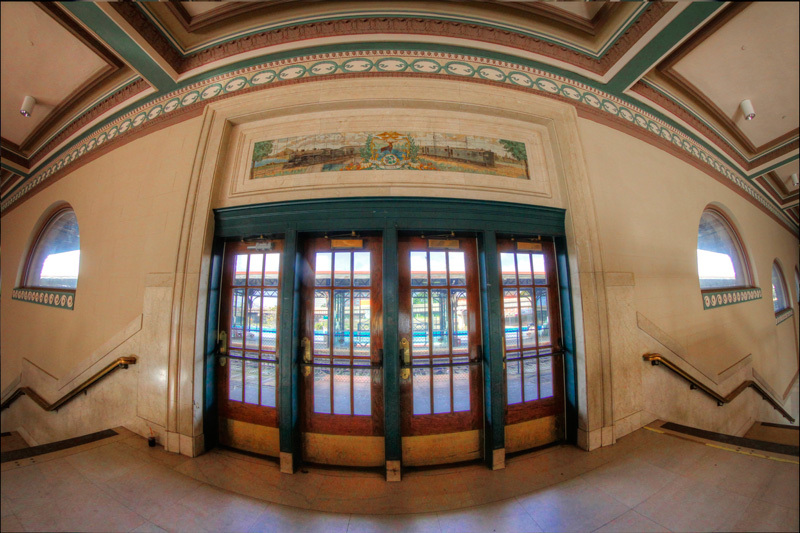 Be sure to check out the artwork at the top of the steps, and keep your eyes peeled for views of the the Capitol building from the platform. 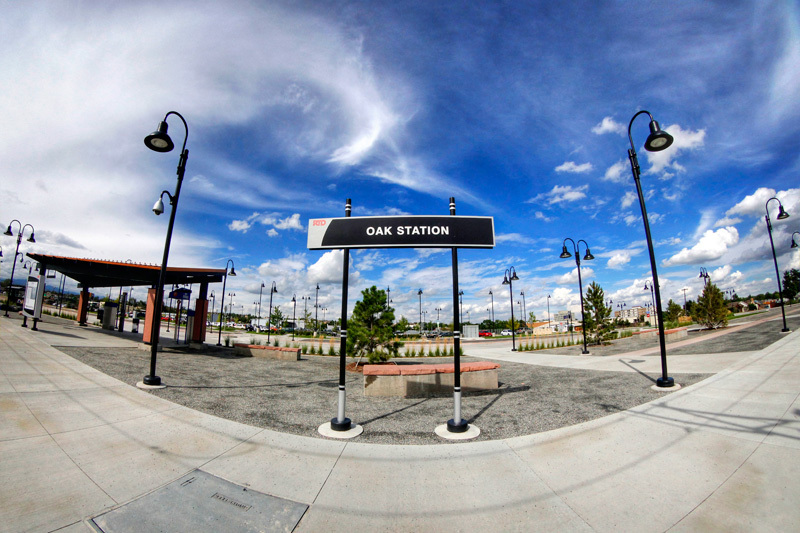 Today’s Friday afternoon photo tour takes a quick visit back to Denver to catch the new West Rail Line, or W Line. 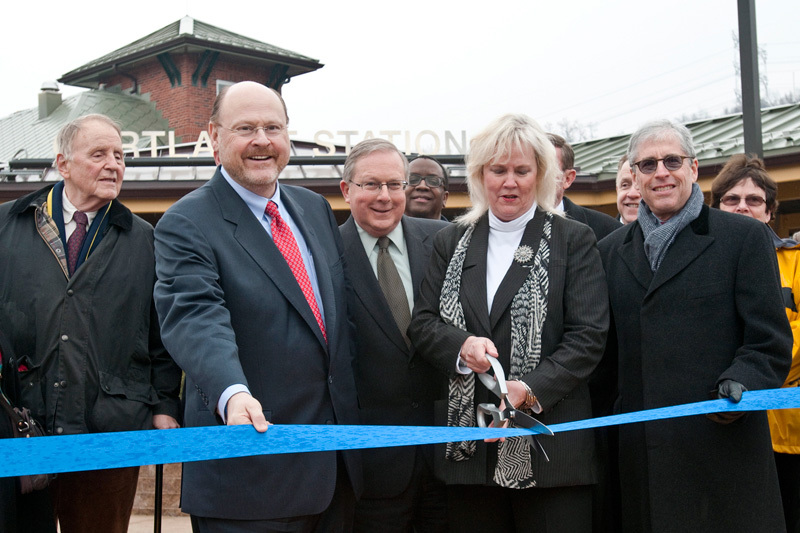 Construction began on this line in 2007, and it was finally opened at the end of April, 2013. 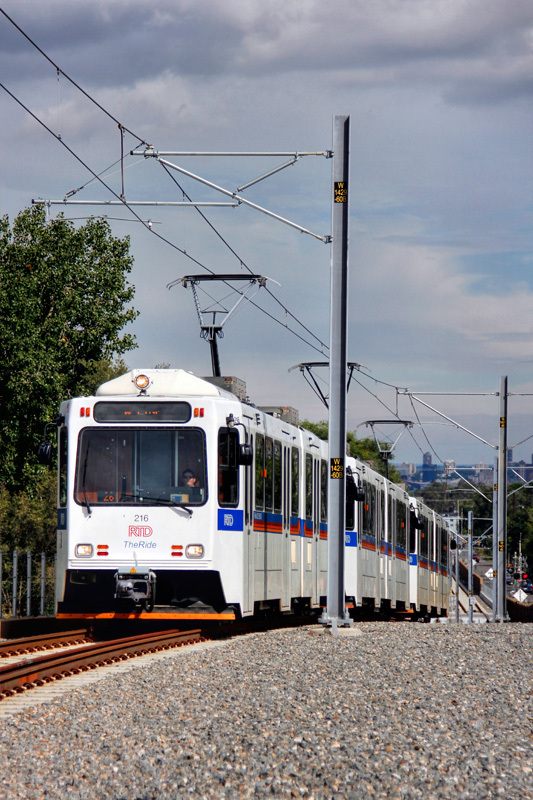 The 12.1 mile route runs from the Jefferson County Government Center to Denver’s Union Station, and added eleven new stations to the light rail system. 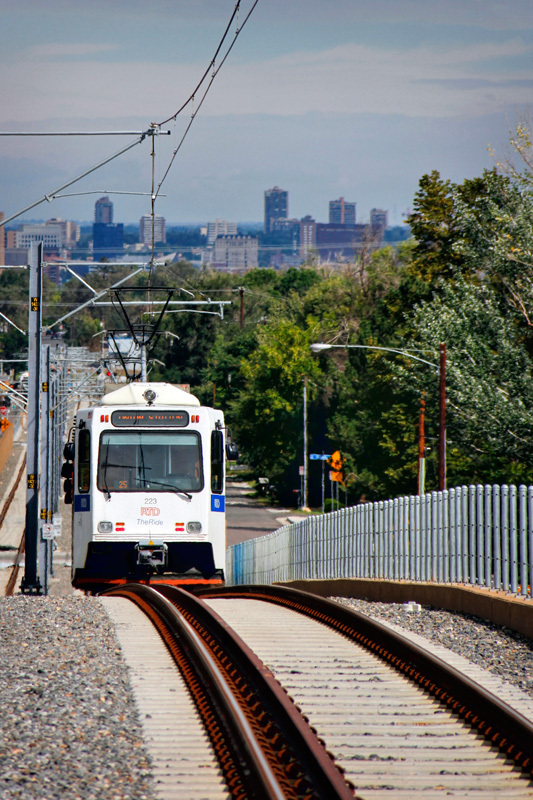 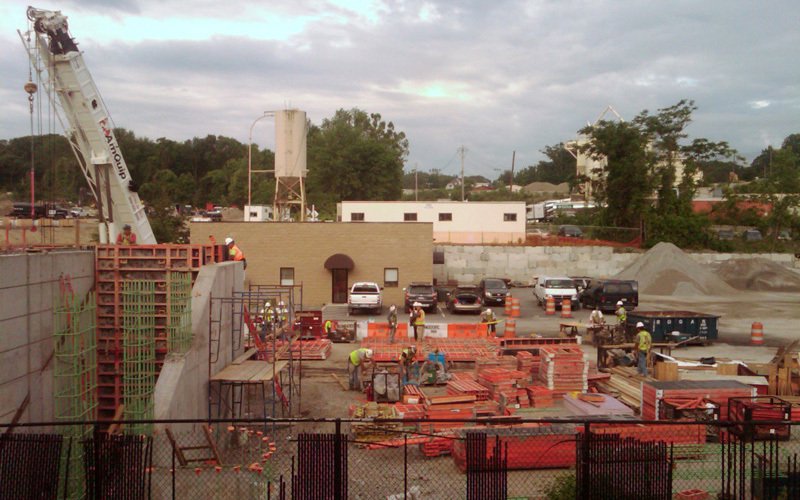 All of today’s photos are from the new W Line, including some photos of two Art-n-Transit pieces. 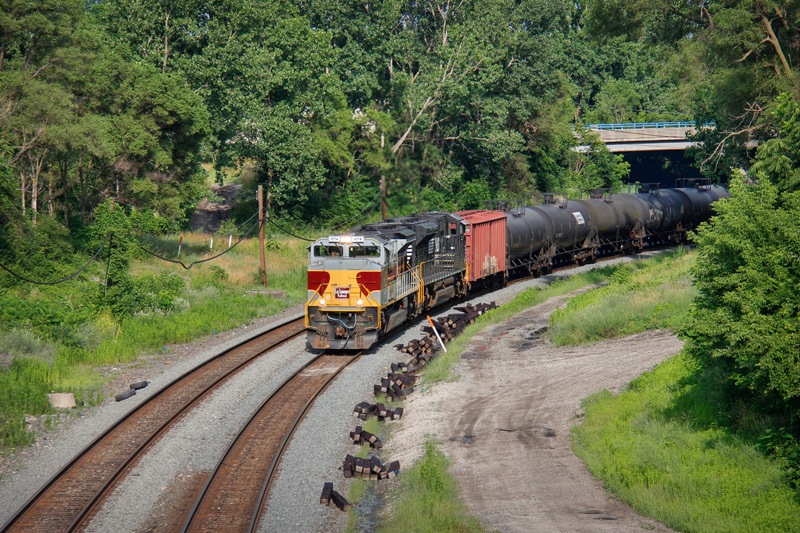 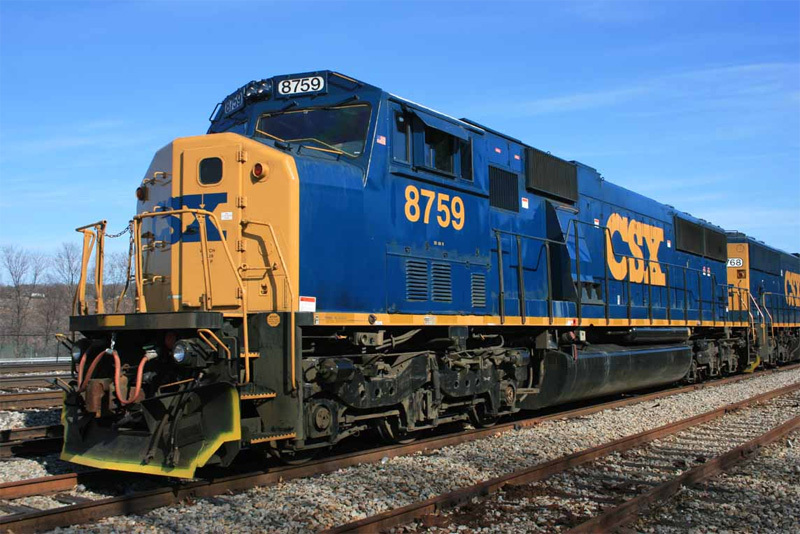 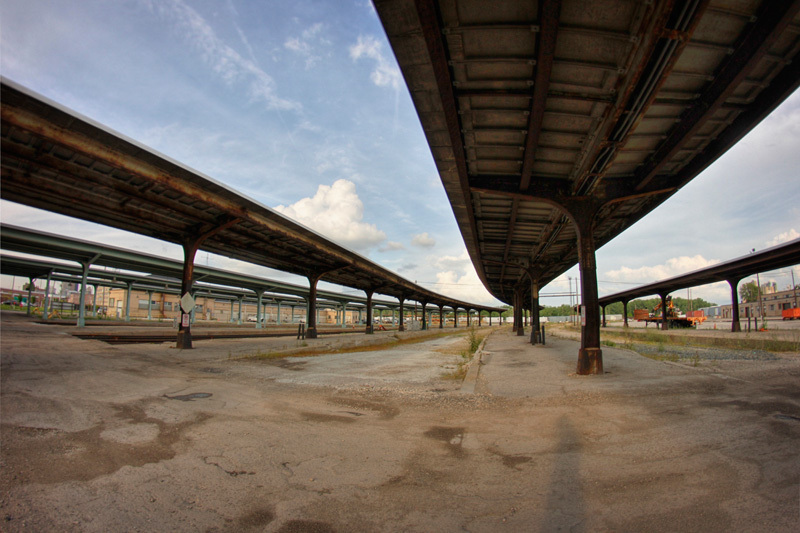 Over 900 application were received from artists looking to create something for the new rail line. 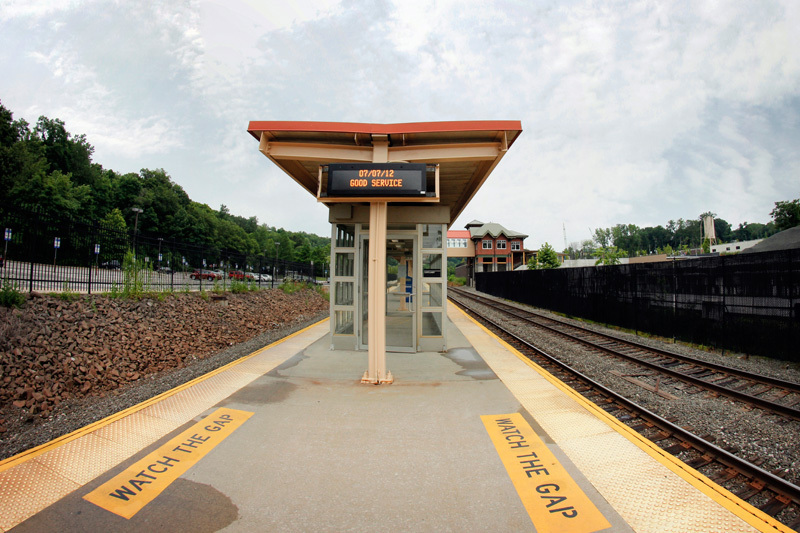 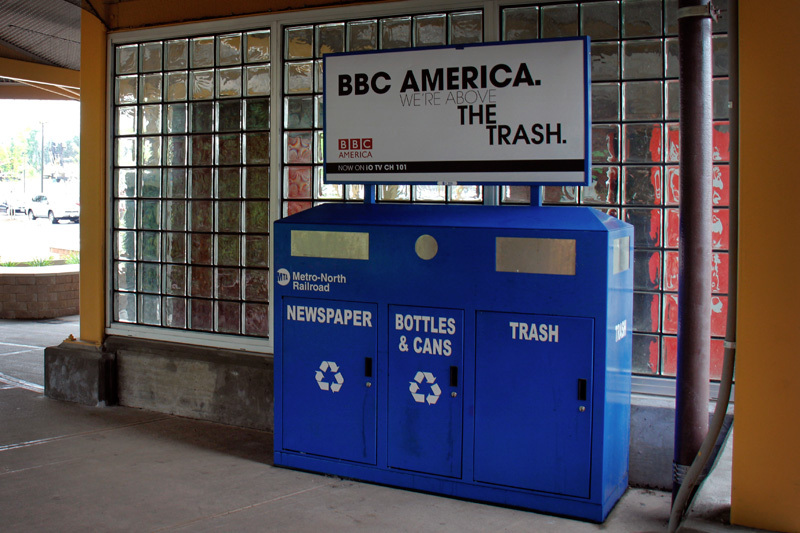 Artworks were commissioned for each of the new stations, though a few have yet to be installed. 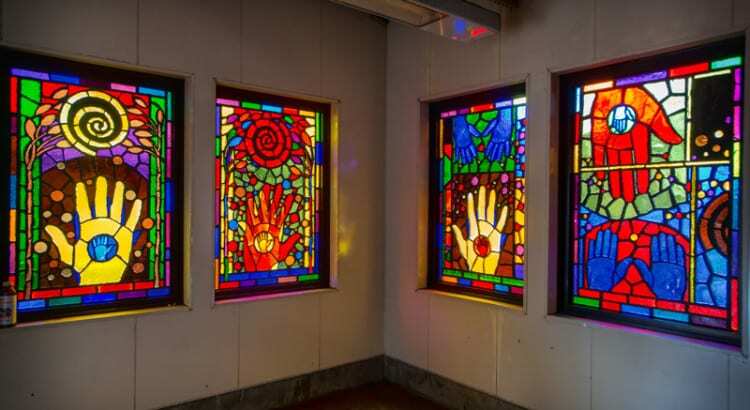 Found at the Lakewood-Wadsworth Station is a glass sculpture titled “Rain and Sun” by artist John Rogers. 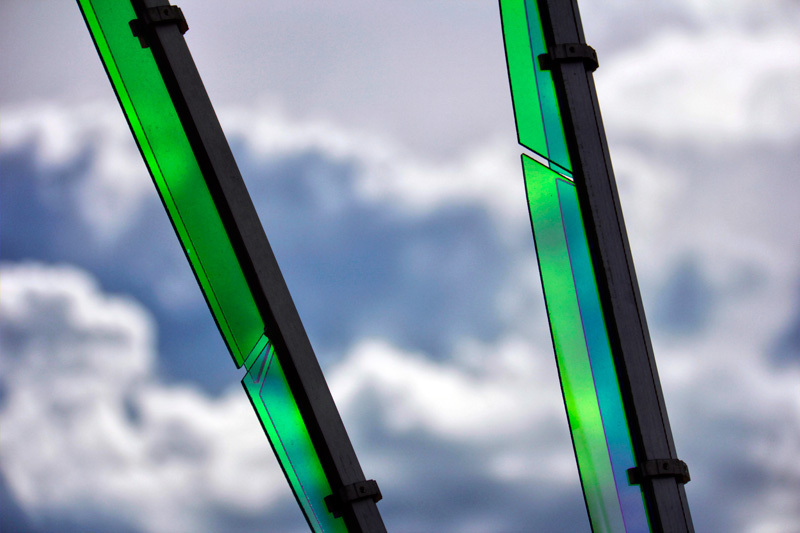 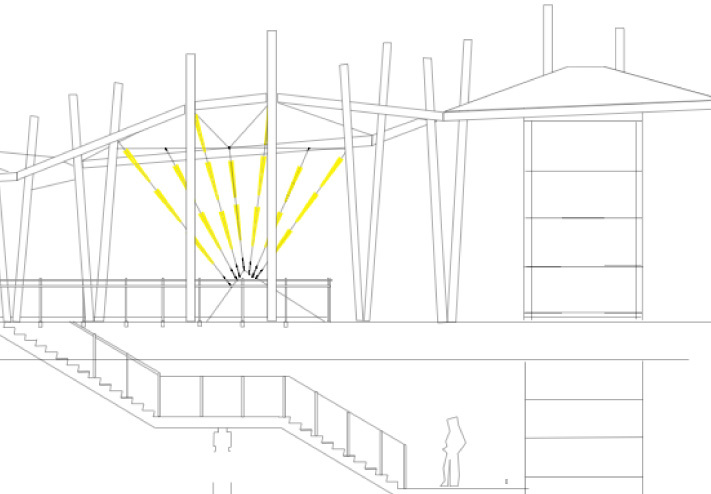 Colored pieces of glass are suspended on wires, which reflect sunlight onto the platform in an array of colors. 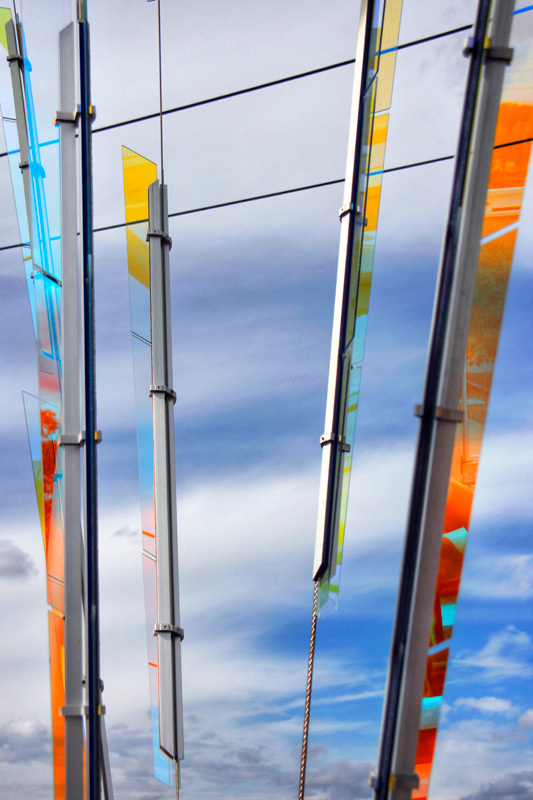 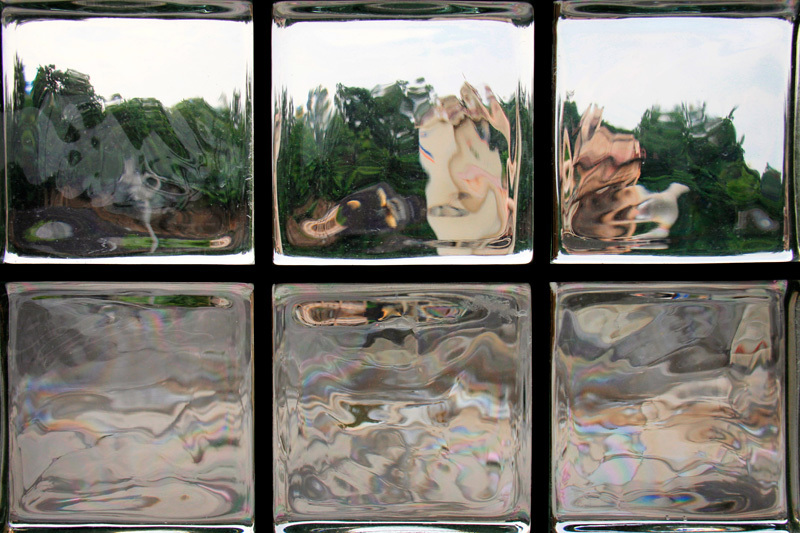 Installed kinetic glass sculpture by John Rogers found at Lakewood-Wadsworth Station. 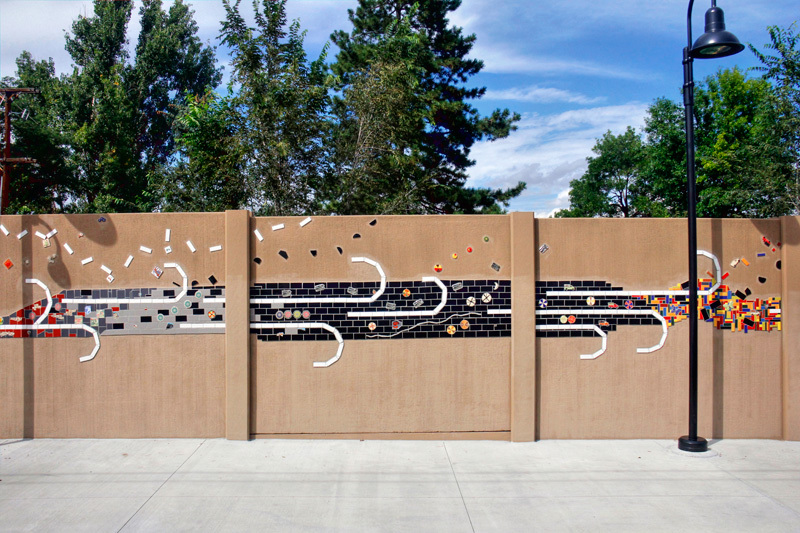 A mosaic titled The Winds of Change can be seen in the photos of the new Garrison station, created by Mike Squared Mosaics. 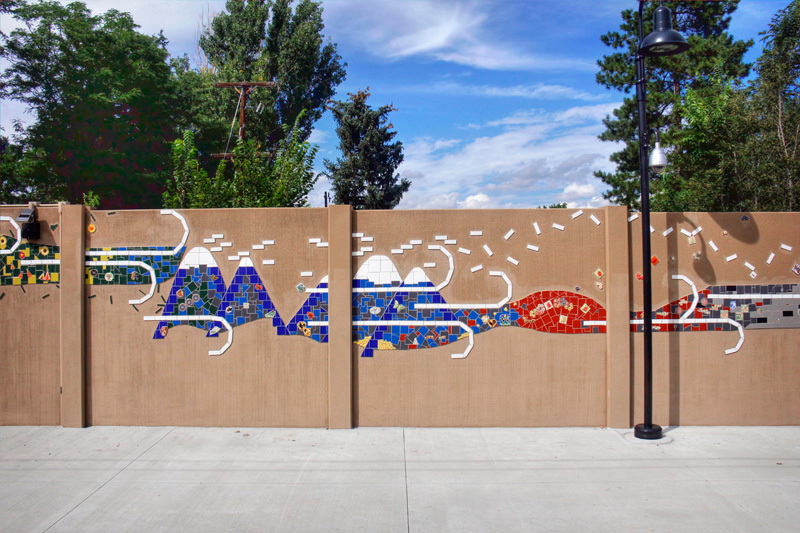 Mike Squared Mosaics are the works of two Colorado artists – Mike Cody and Mike Juarez. 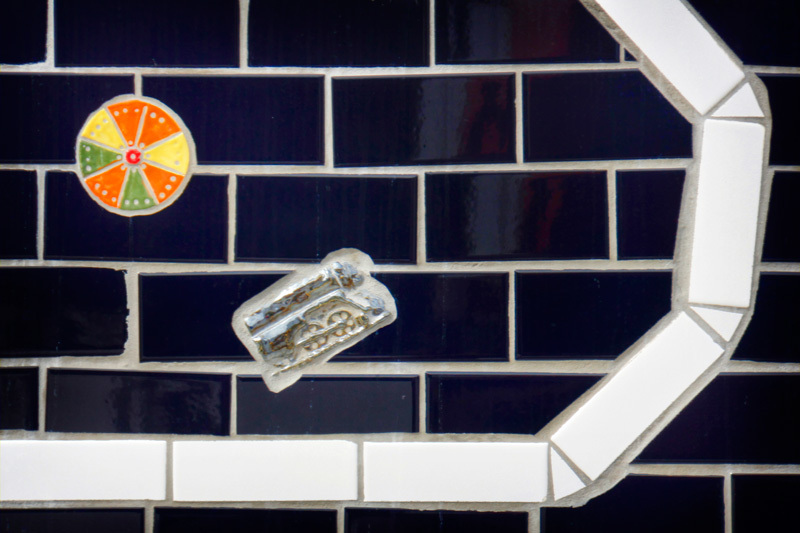 The duo fire their own custom made mosaic tiles, all of which are hand-cut. 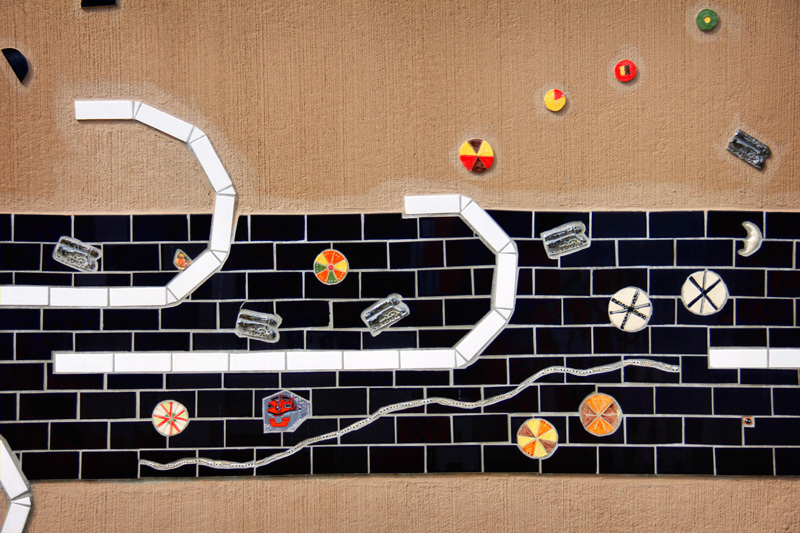 The 220 foot “mosaic mural” combines tile, glass, and even pottery in a colorful and somewhat abstract portrayal of the area’s natural history. 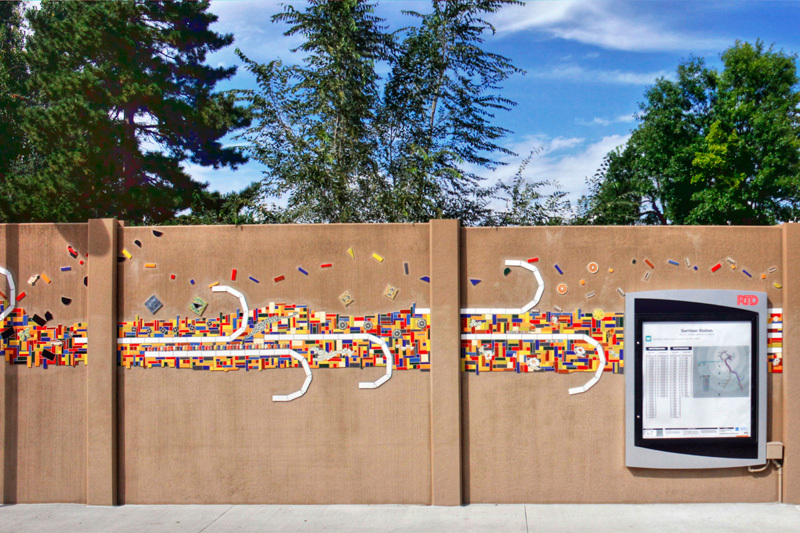 Installed mosaic by Mike Squared Mosaics at Garrison station. 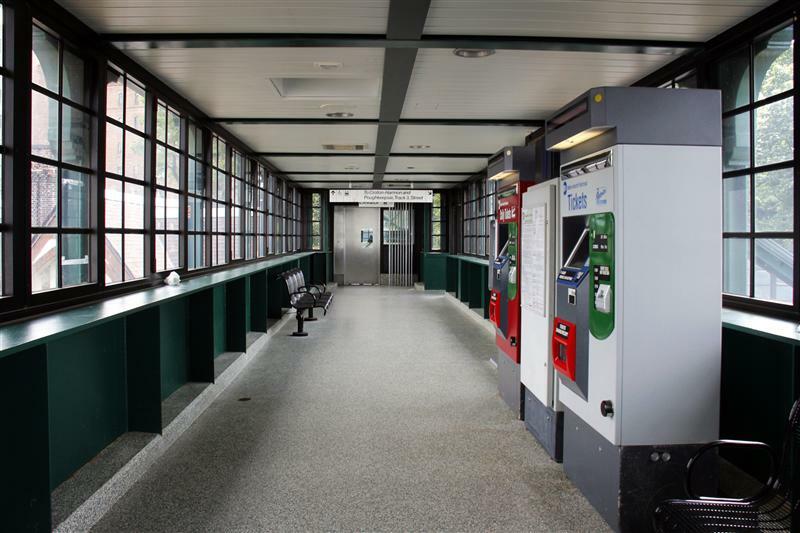 Besides the full commissioned artworks, you’ll notice that there are various pleasingly aesthetic elements found at the stations. 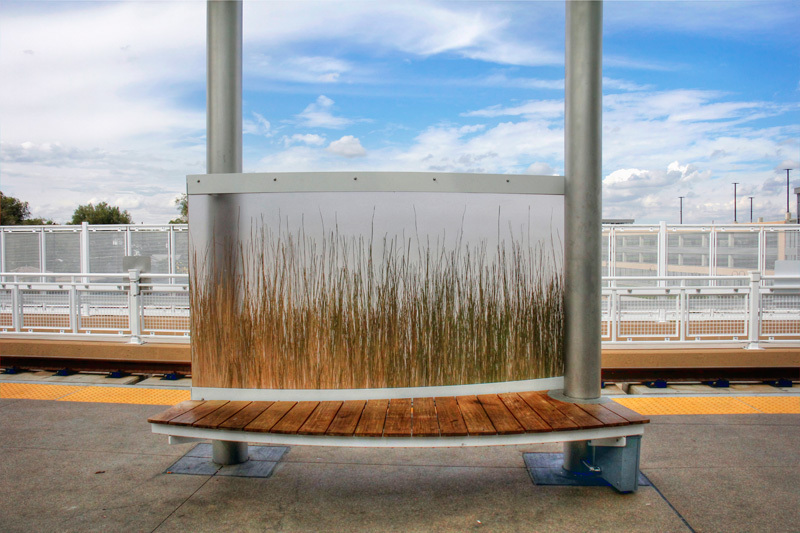 Benches at several stations feature imagery of tall grasses on panels of layered glass. 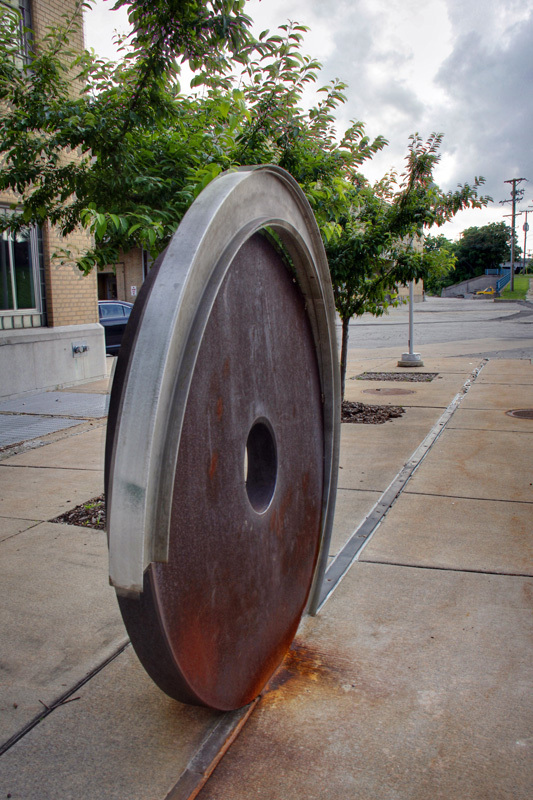 Other benches have cutouts that carry a similar theme. 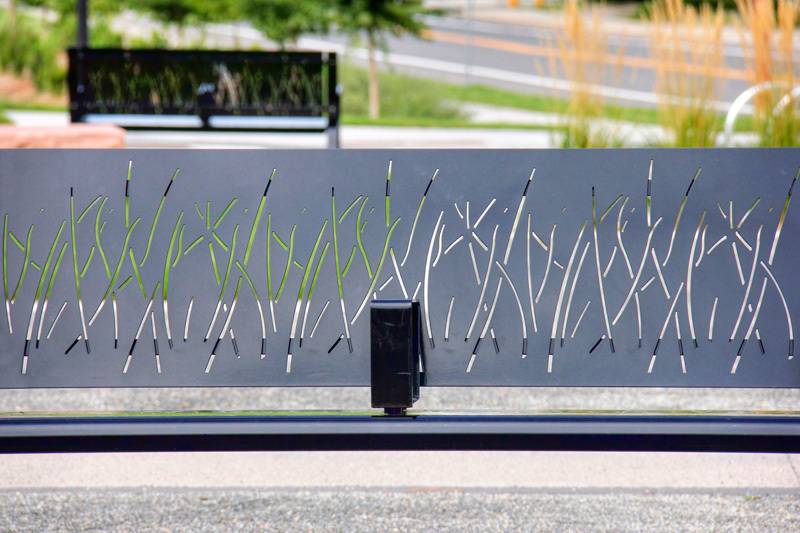 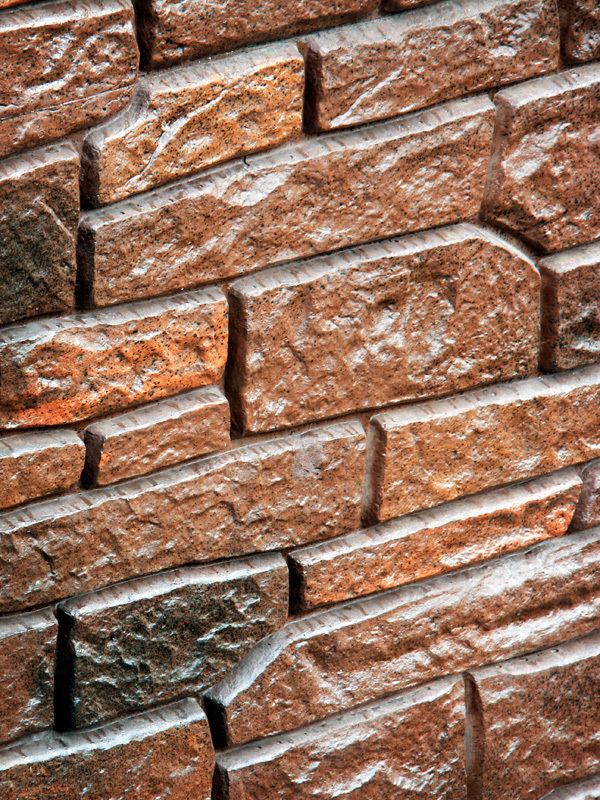 Concrete panels with stylized grass in relief can also be found in places along the line. 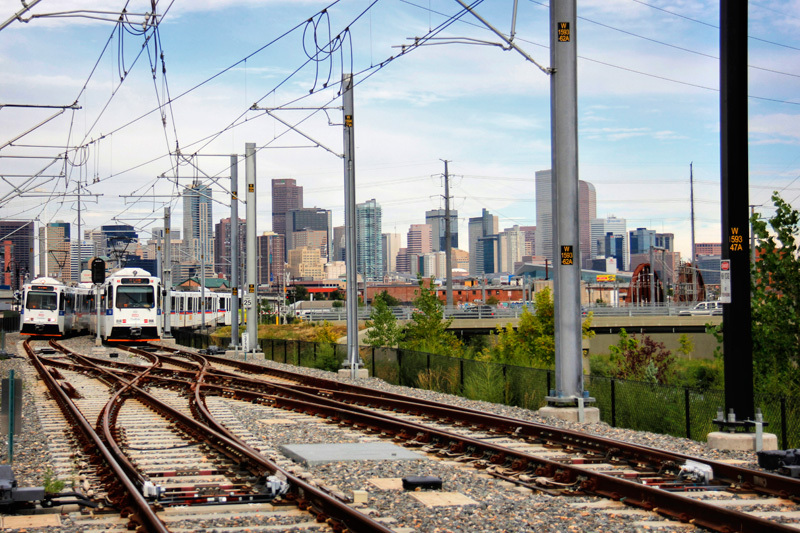 All in all the new line turns out to be a nice ride, complete with nice views of downtown Denver’s skyline. 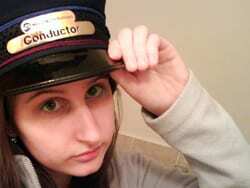 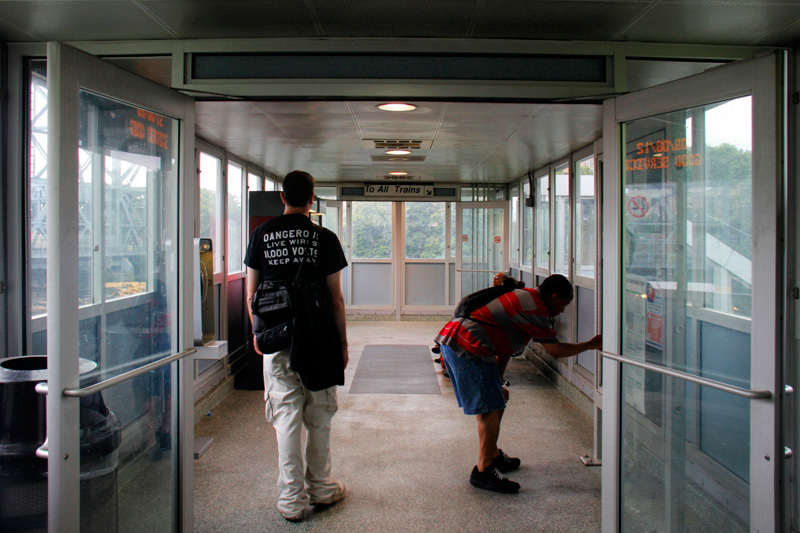 Just about twelve years ago I hopped on a plane bound for Brazil to spend a year as a foreign exchange student. 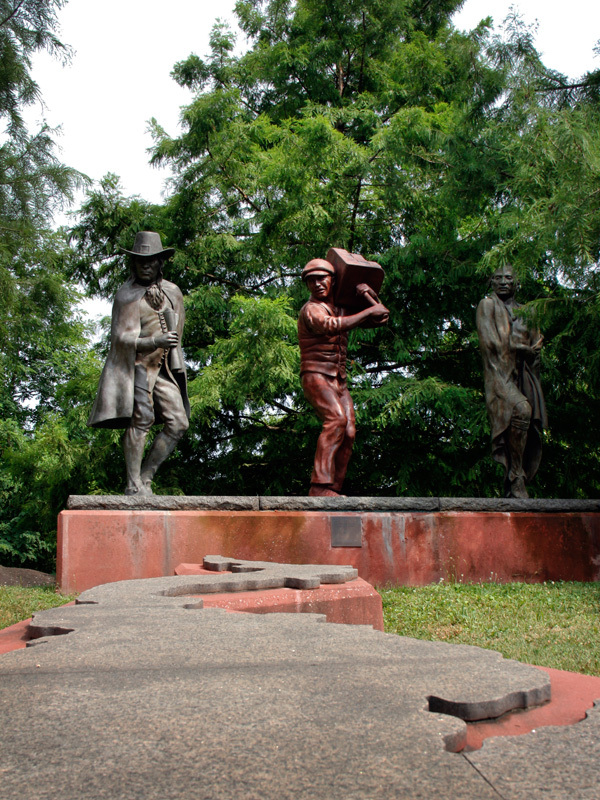 I lived in smaller city named Toledo – in the south-west of the country, not too far from the borders of Argentina and Paraguay, and the famed Iguaçu Falls. 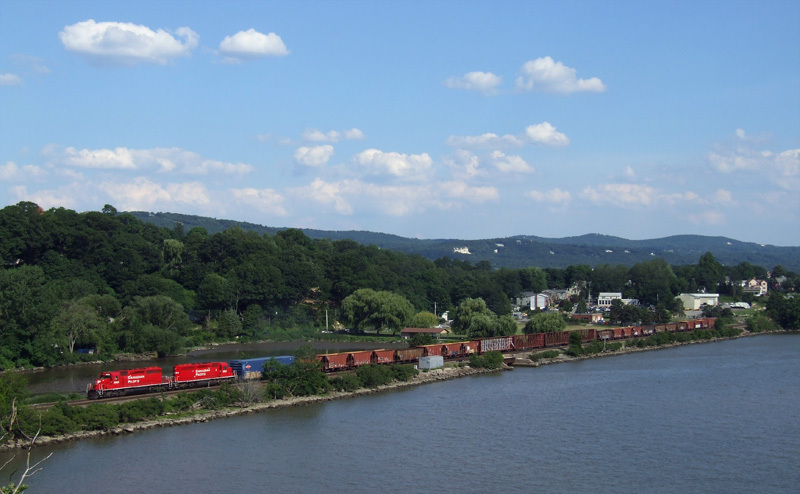 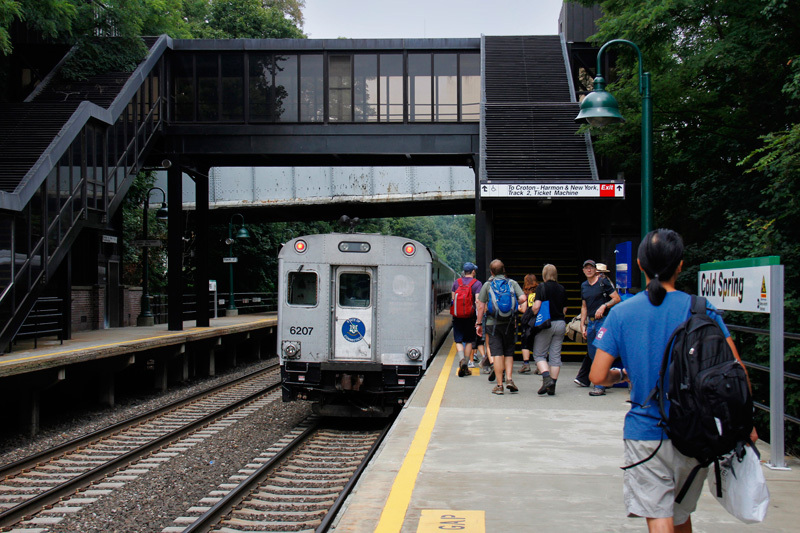 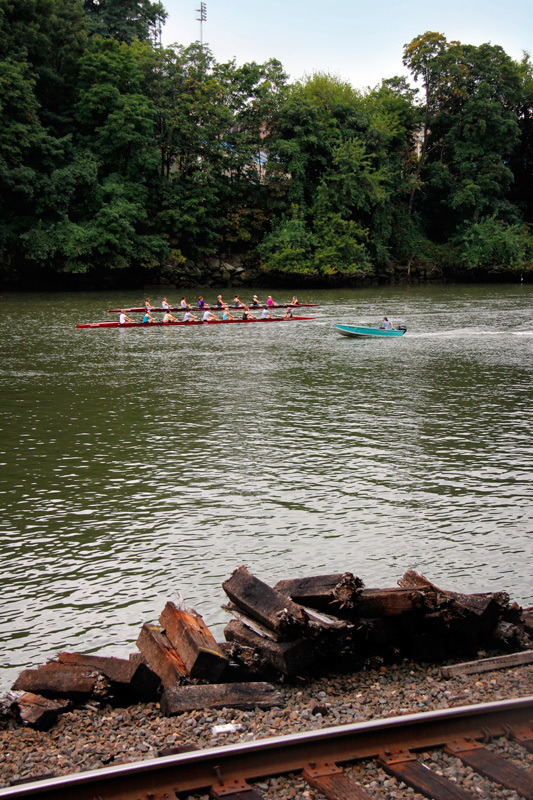 It was a nice place – think quaint Appalachian mining town with a little of White Plains mixed in – but hardly a city that would get significant numbers of tourists. 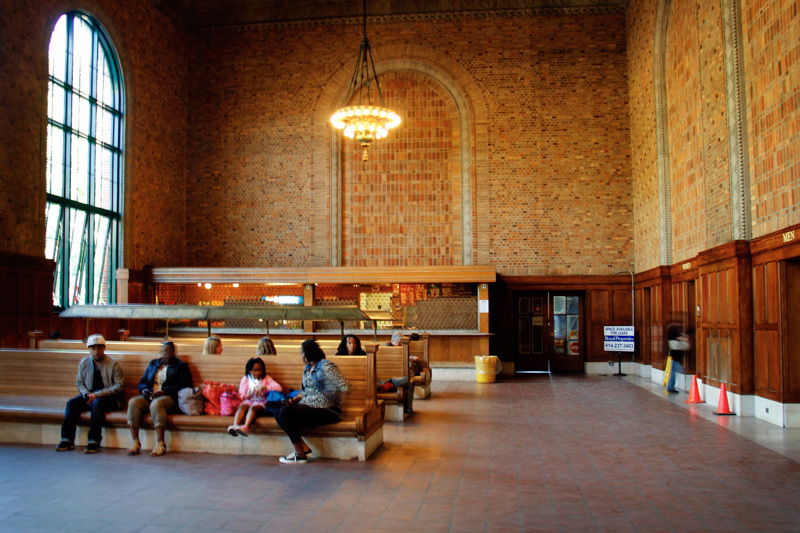 While I lived there I had a host brother that was some years older than me, and he recounted his first visit to the United States. 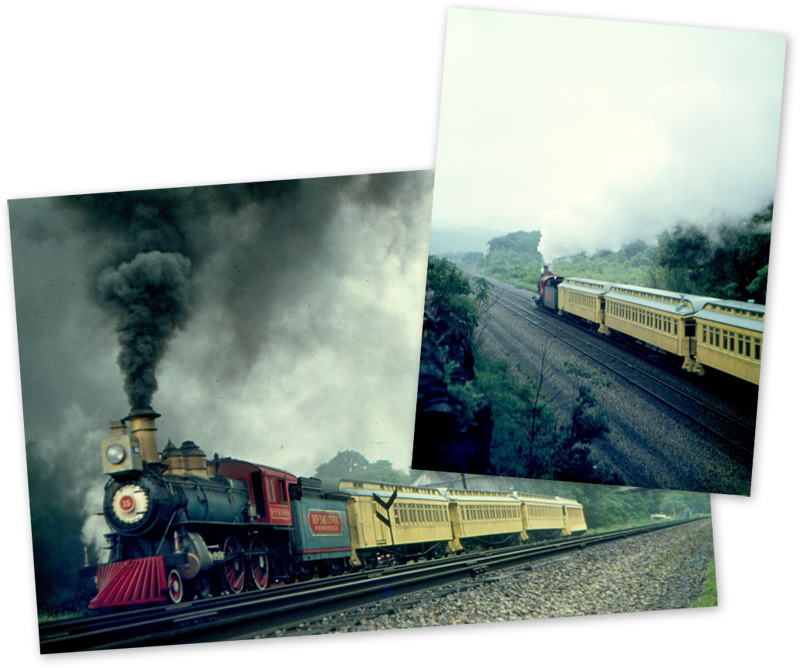 As is customary in many South American cultures, the 15th birthday is a big deal, and a lot of upper middle class folks reward their children with a big trip. 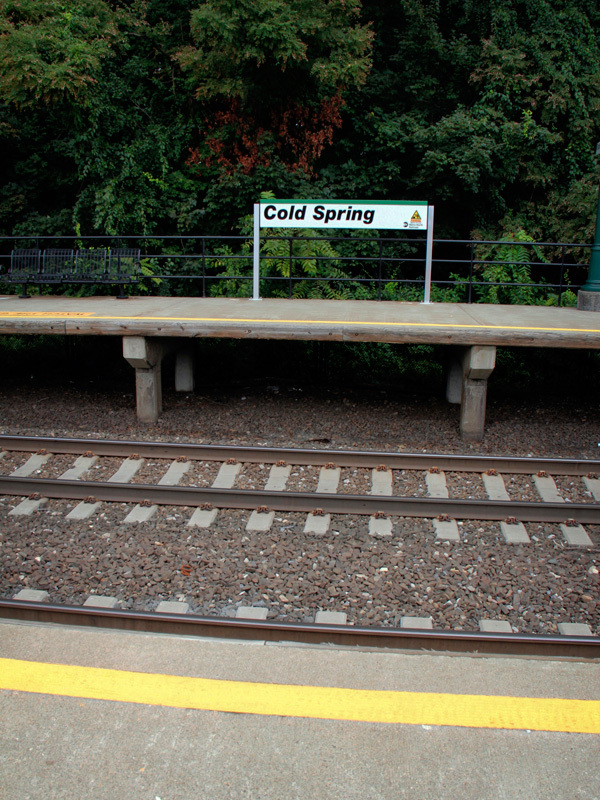 Most tend to choose interesting places like Disney World, or New York. 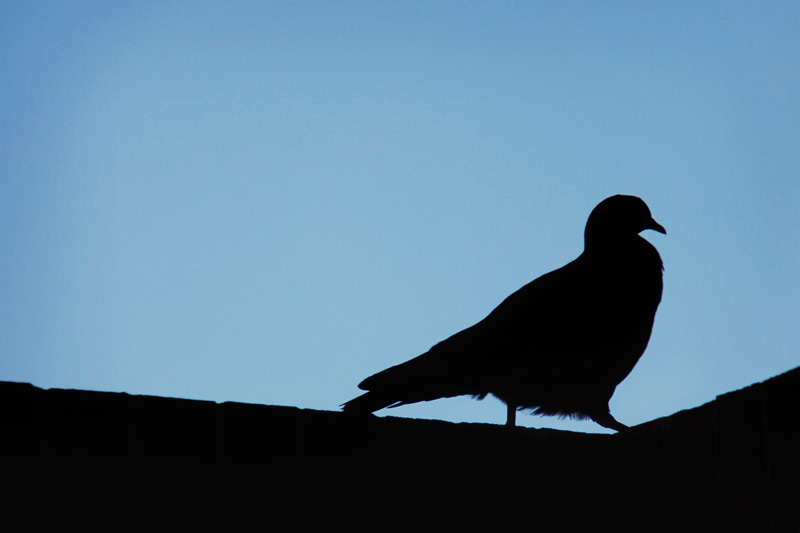 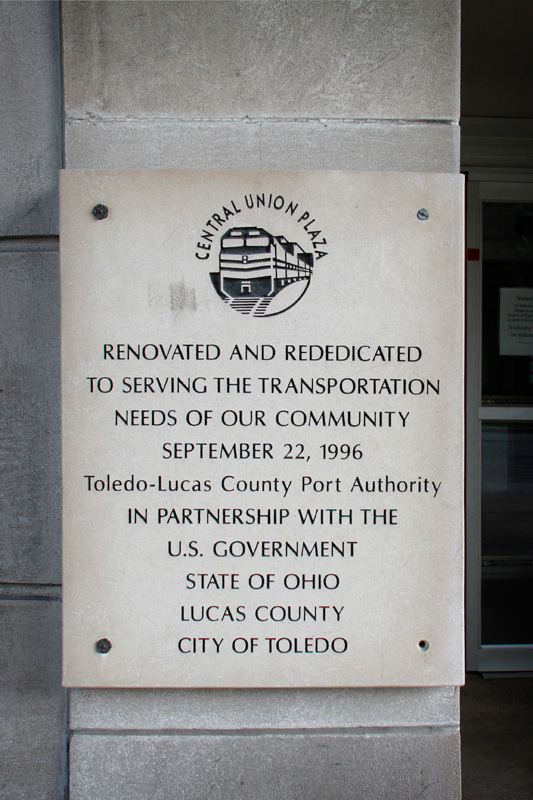 My host brother had a different idea – he wanted to go to another city called Toledo. 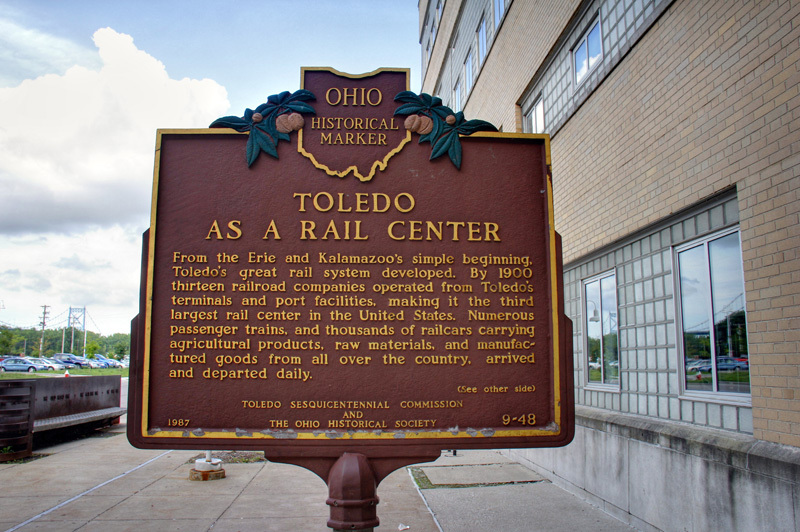 Toledo, Ohio is likewise a city I can’t imagine gets immense amounts of tourists (though apparently there are some modern rail hobos), but it certainly is a nice enough place. I’m not too sure what my host brother actually did here when he was fifteen – perhaps took a trip to the zoo – but it really doesn’t have the allure of say, Disney. 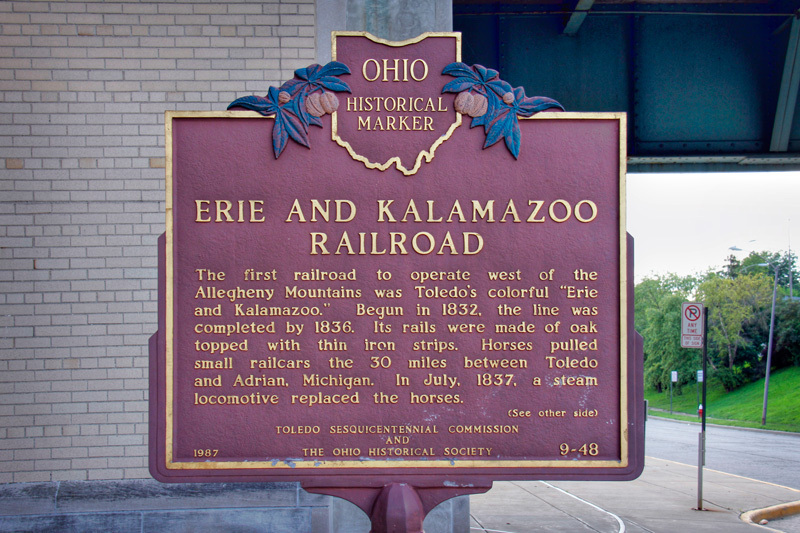 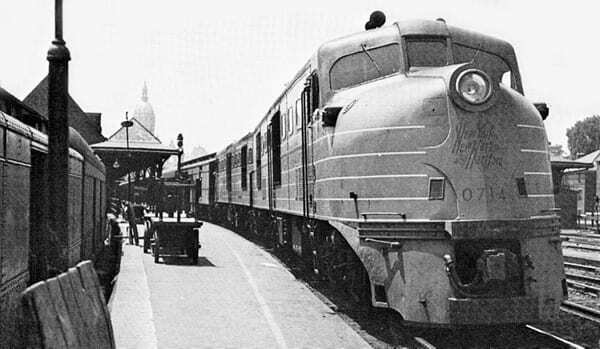 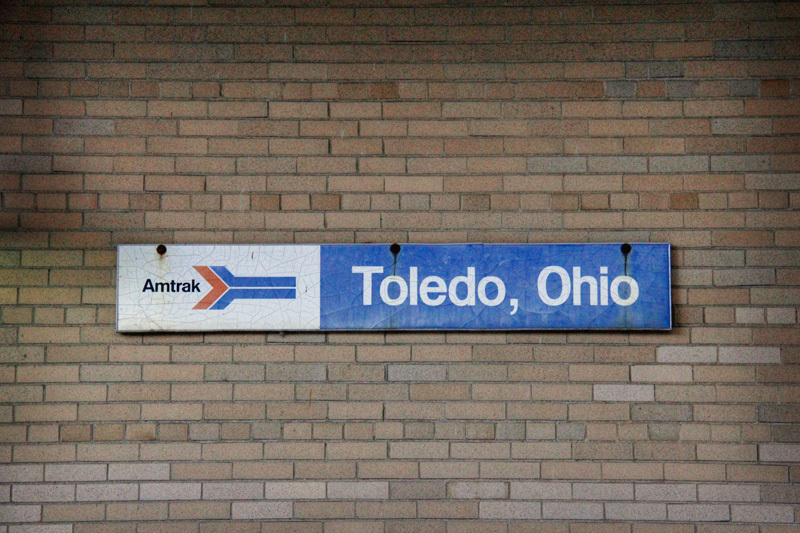 Once upon a time, however, Toledo did get quite a few visitors, and many of them by train. 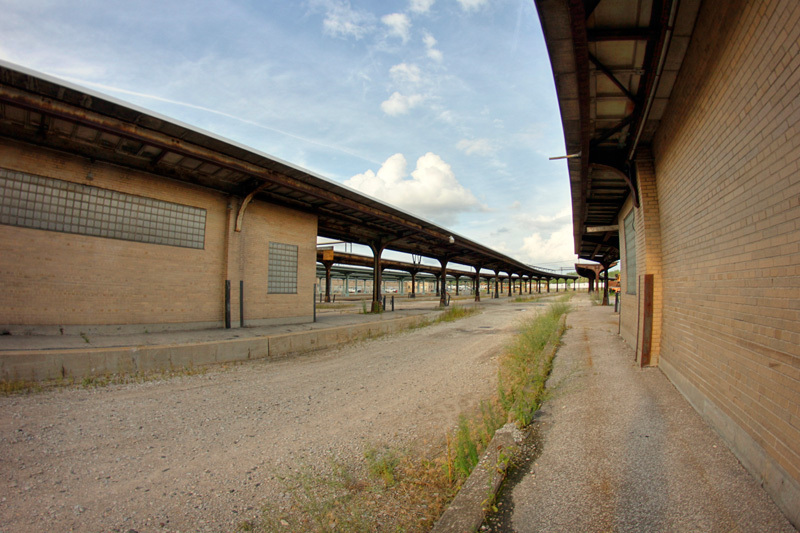 The state of Toledo’s rail station today is really a visual reminder of not just the fall of passenger rail travel, but of the steady 40+ year decline of Toledo’s population. 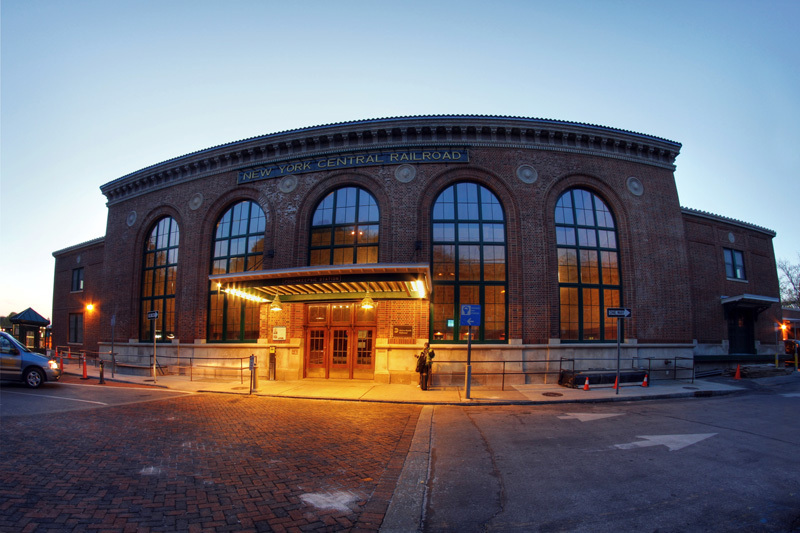 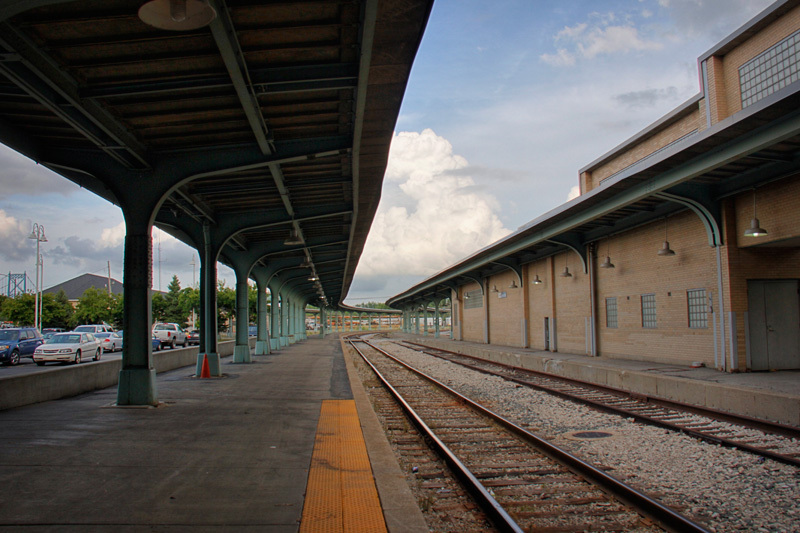 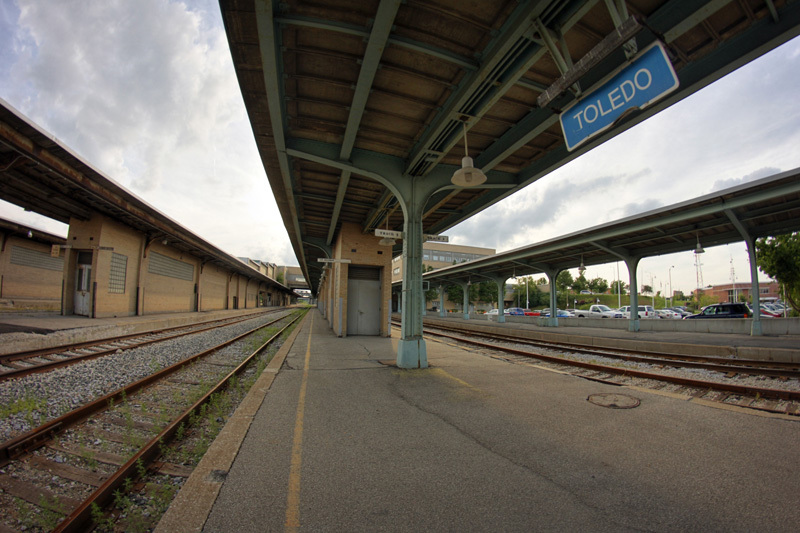 In embracing modernity, the above 1800s Toledo station was replaced with the current brick and glass box. 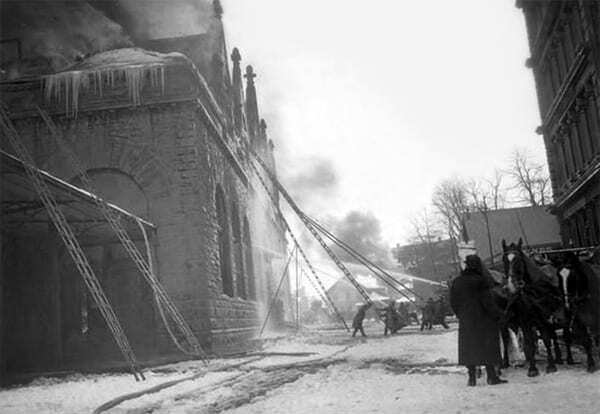 People hated this building so much that they cheered when it caught fire and burnt down. 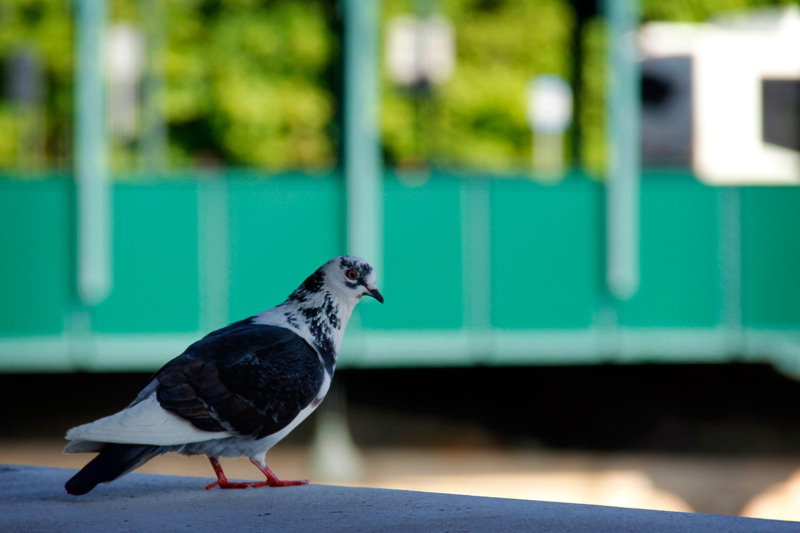 I think they’re crazy. 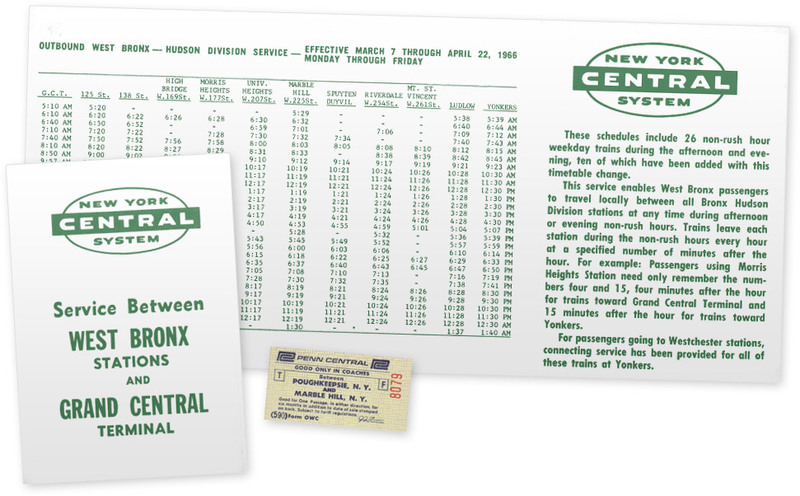 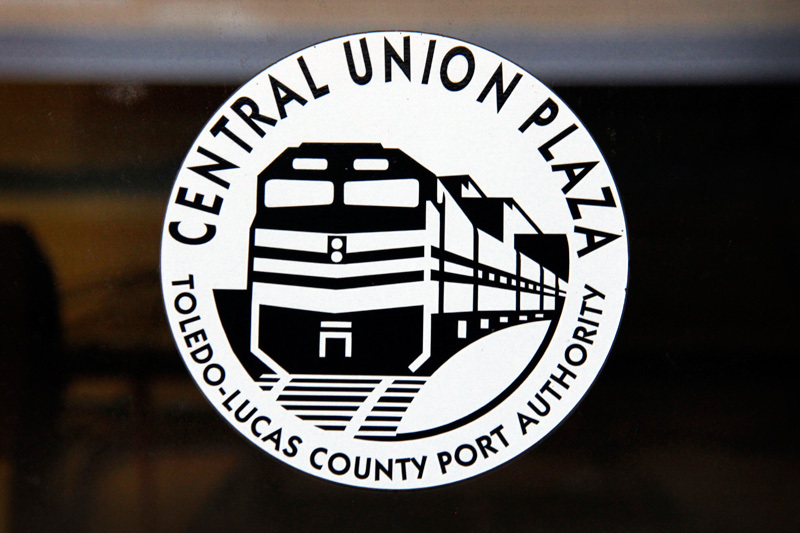 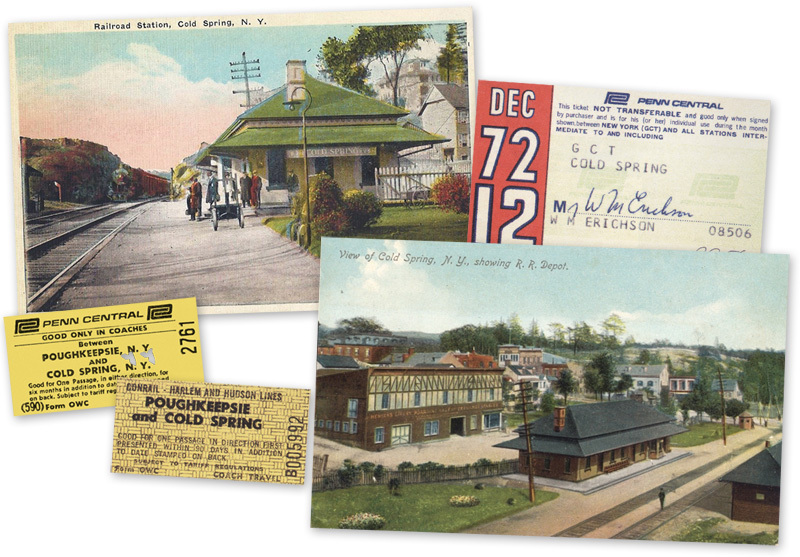 The replacement – Central Union Terminal postcard, and tickets from Toledo from 1950. 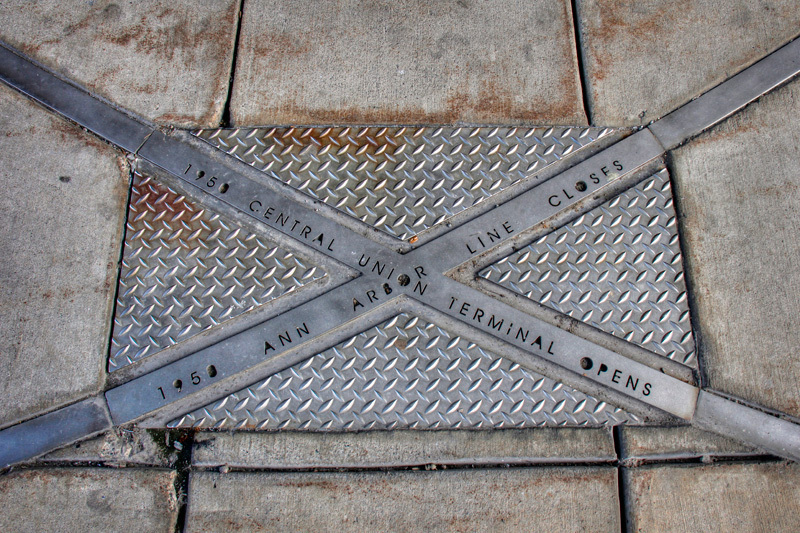 Central Union Terminal, opened in 1950, is claimed by Wikipedia editors to be the last “great” railroad station built by the New York Central. 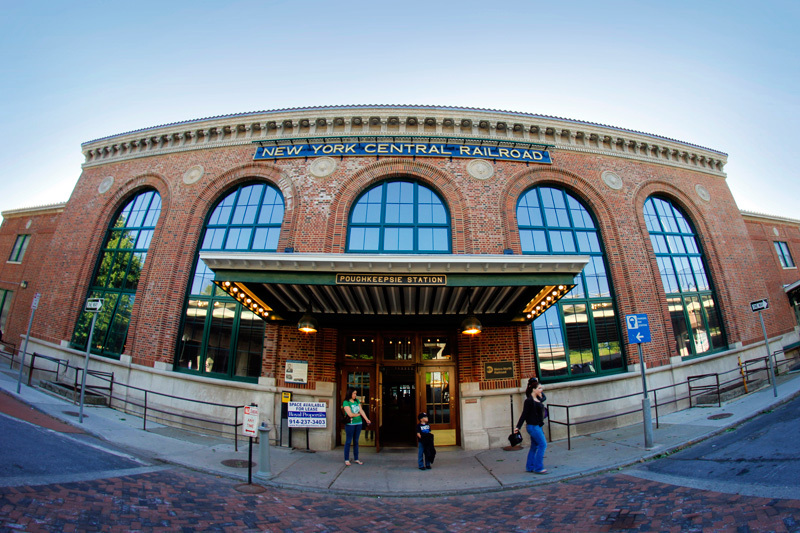 A modern structure made of brick and glass, it certainly doesn’t have the same charm as many of the Central’s older stations. 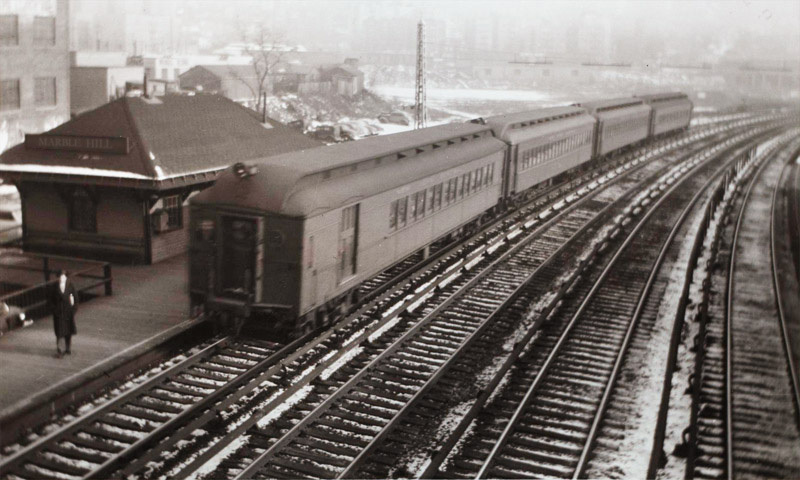 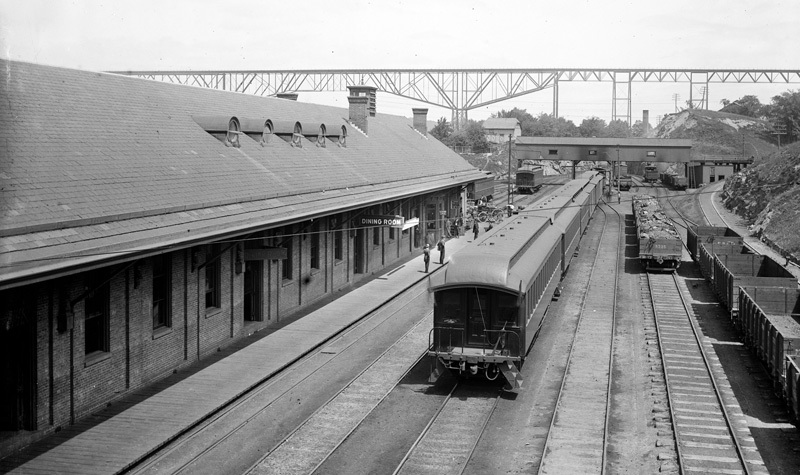 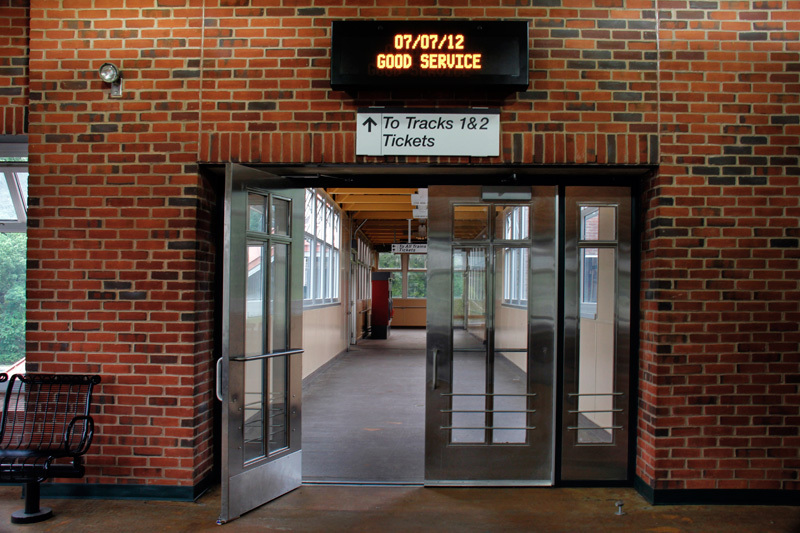 When opened, the station had about 55 daily departures – compare that with today’s paltry 4 departures. 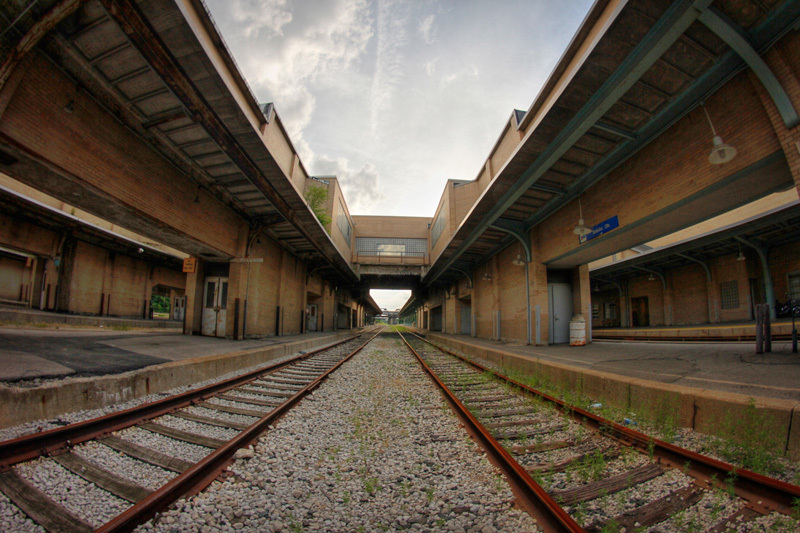 The island platforms that connected to the main station, once filled with people, are relatively dormant today. 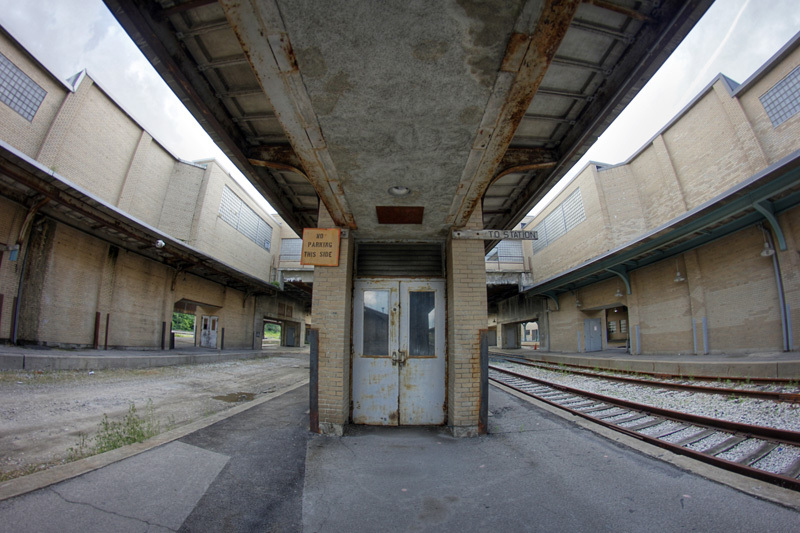 The passageways leading from these platforms to the station proper have long been shuttered, and are fastened shut with rusted chain for good measure. 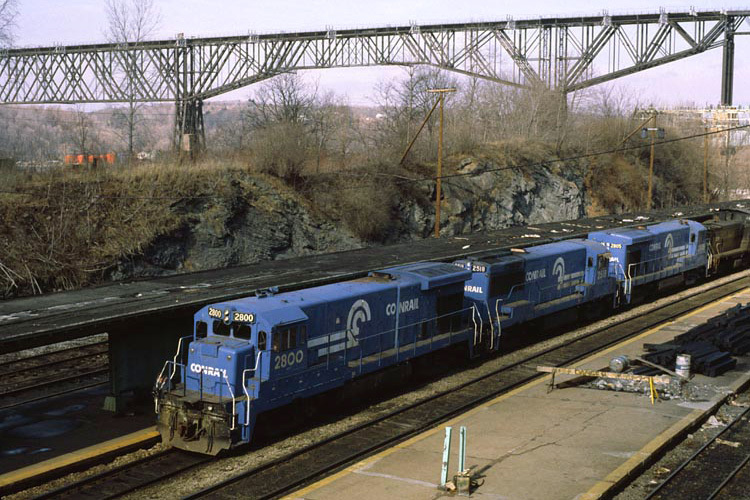 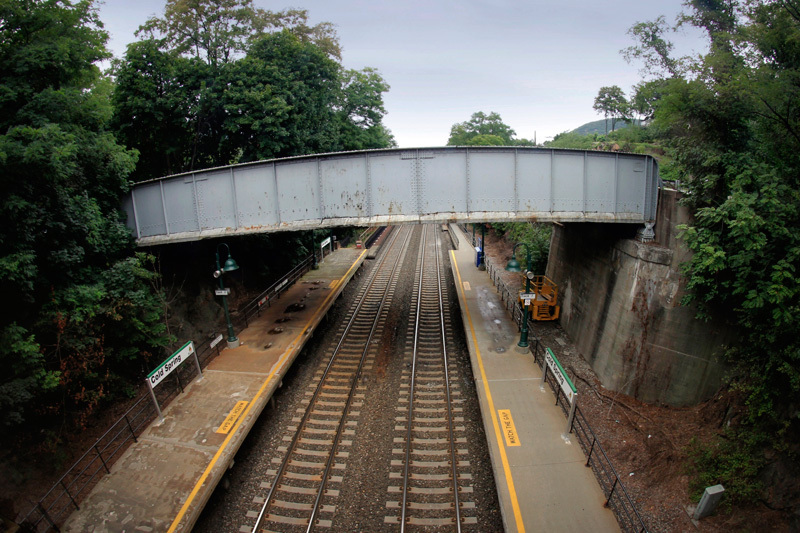 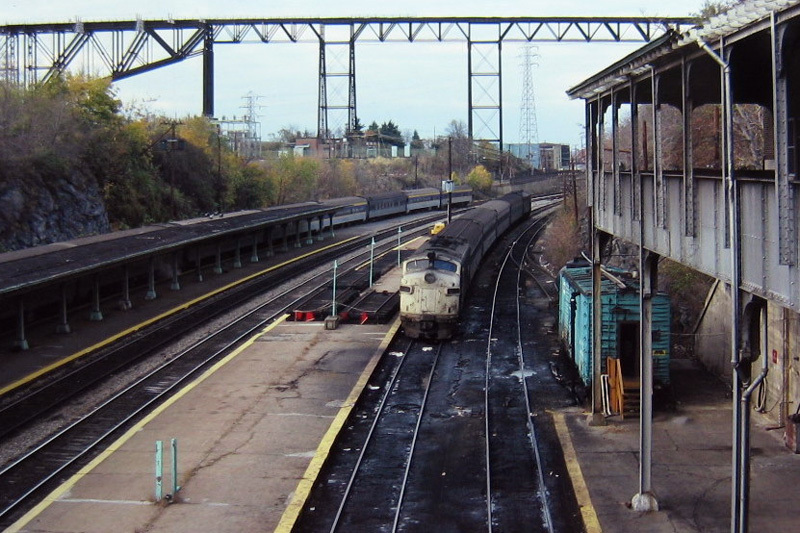 Some lonely platform canopies protect ripped out platforms, and others just stand over rusted rails. 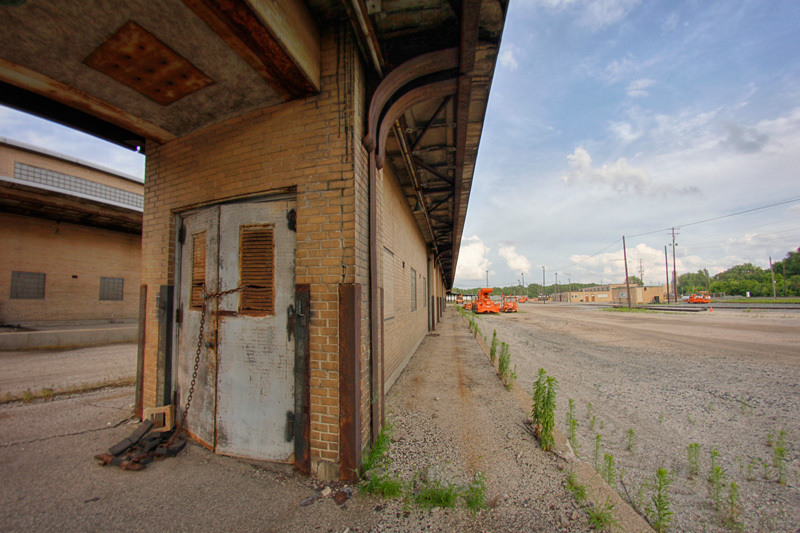 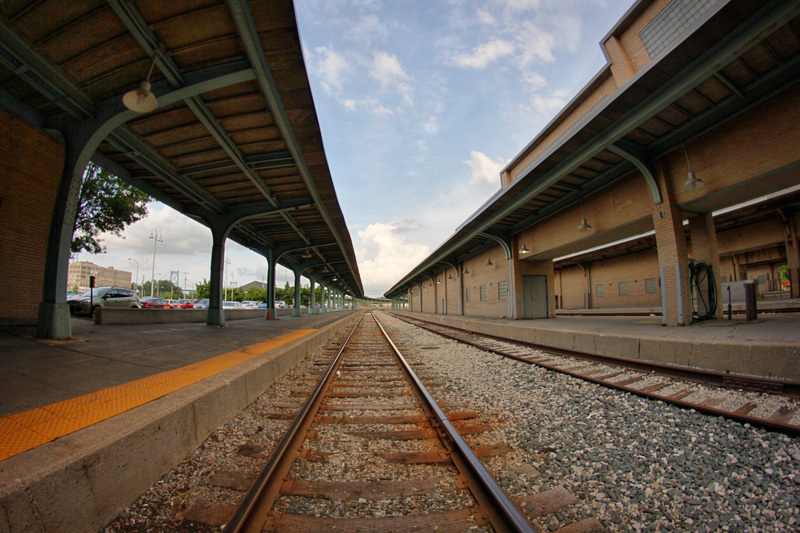 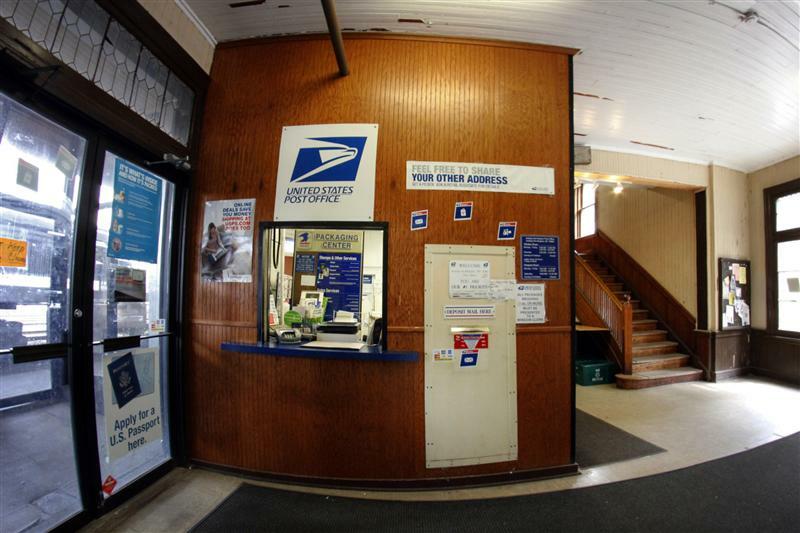 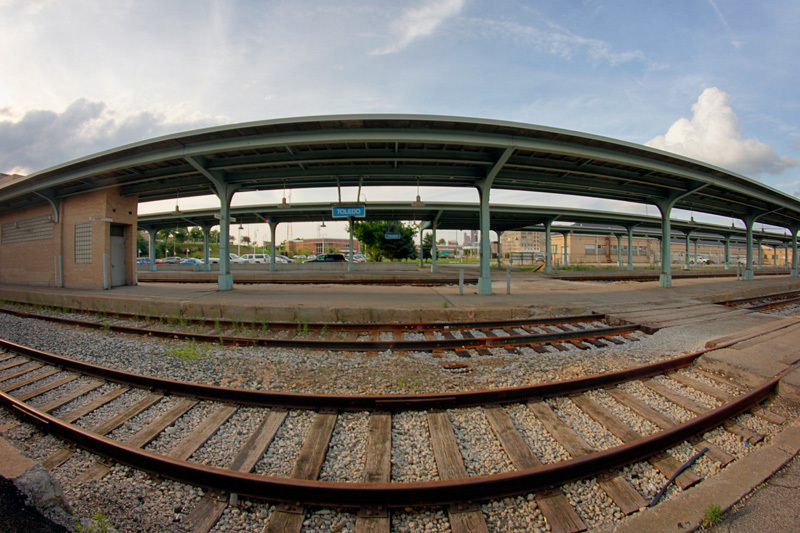 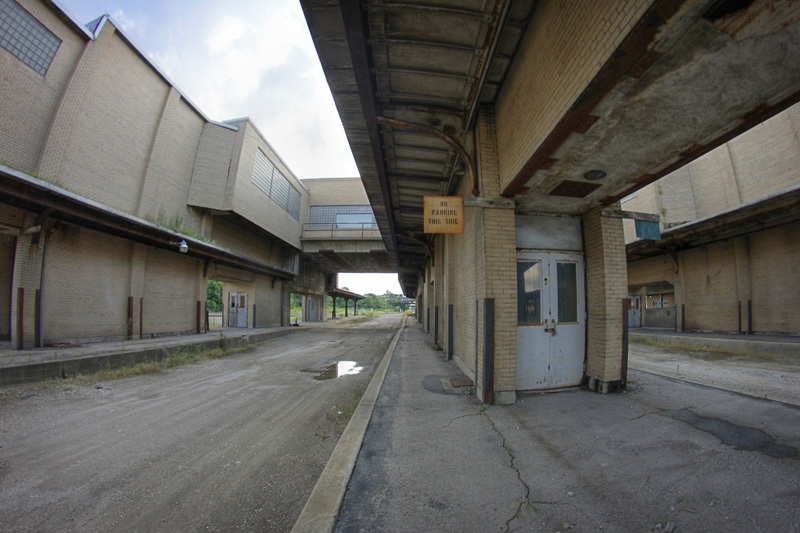 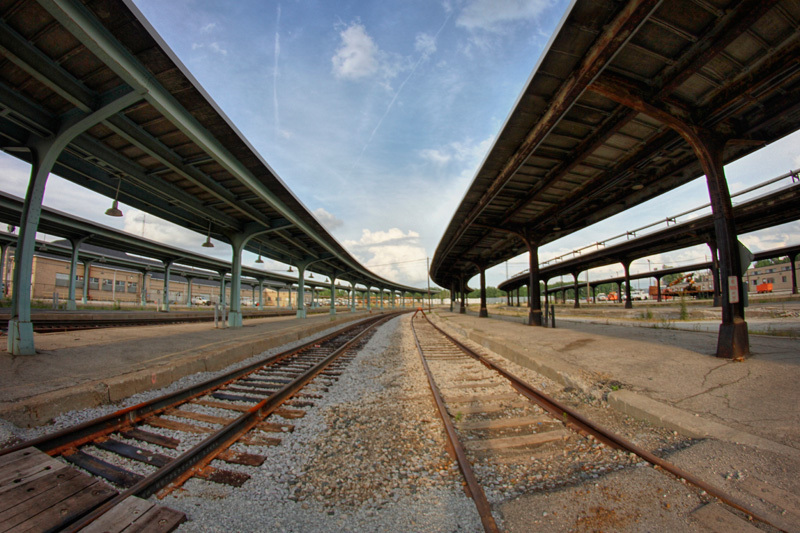 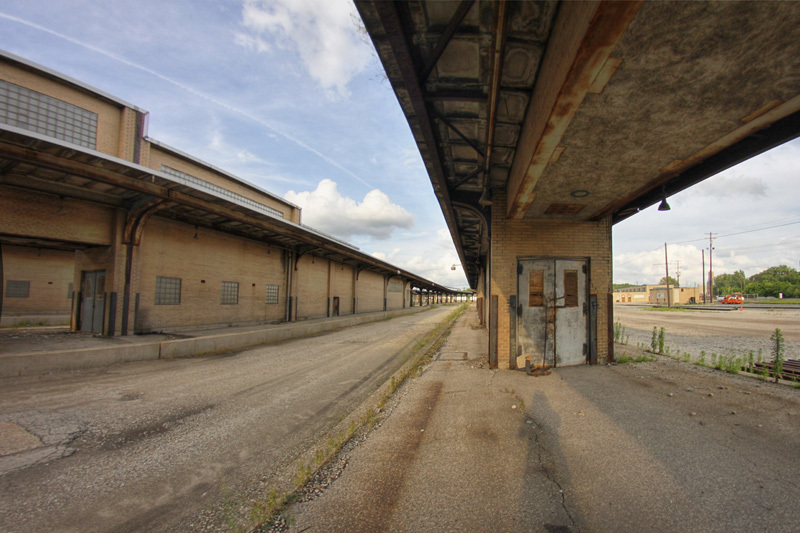 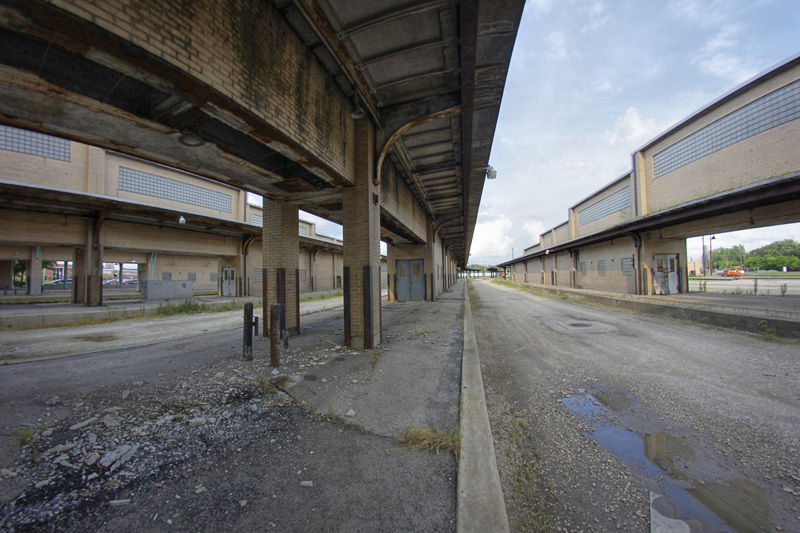 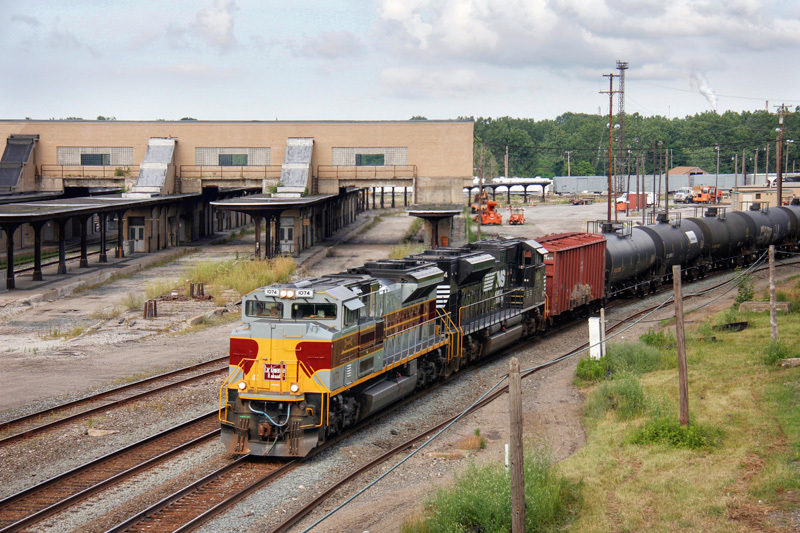 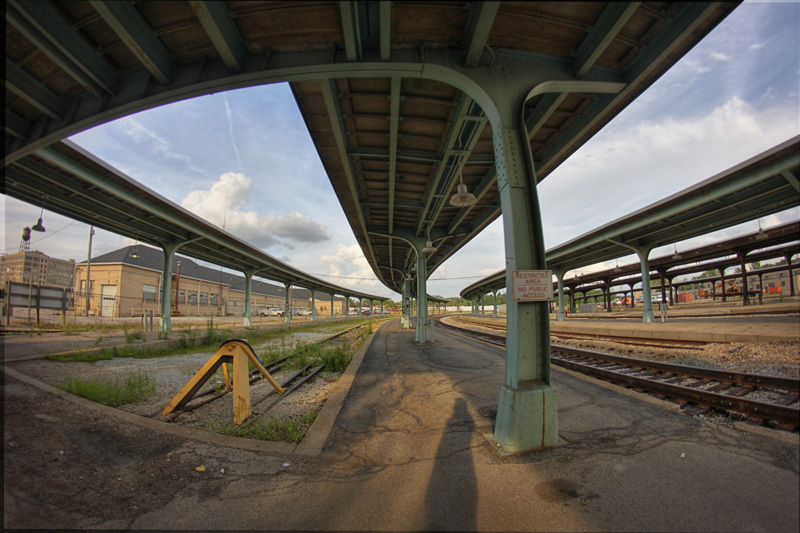 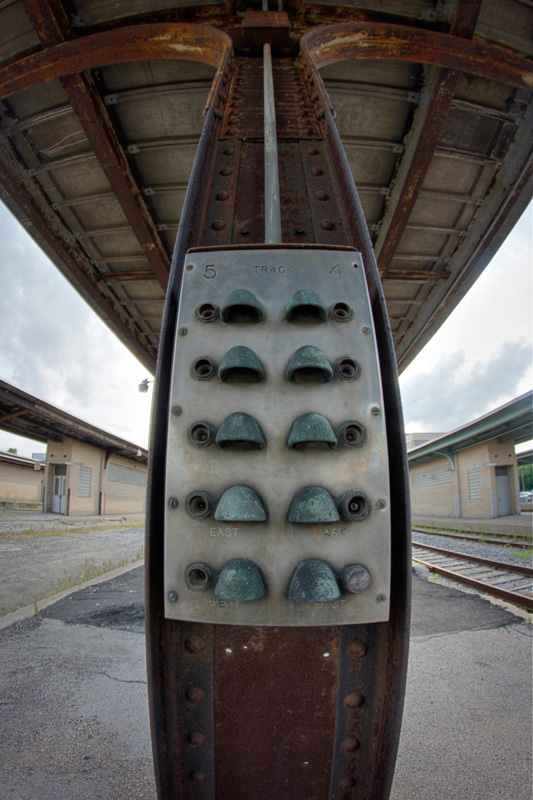 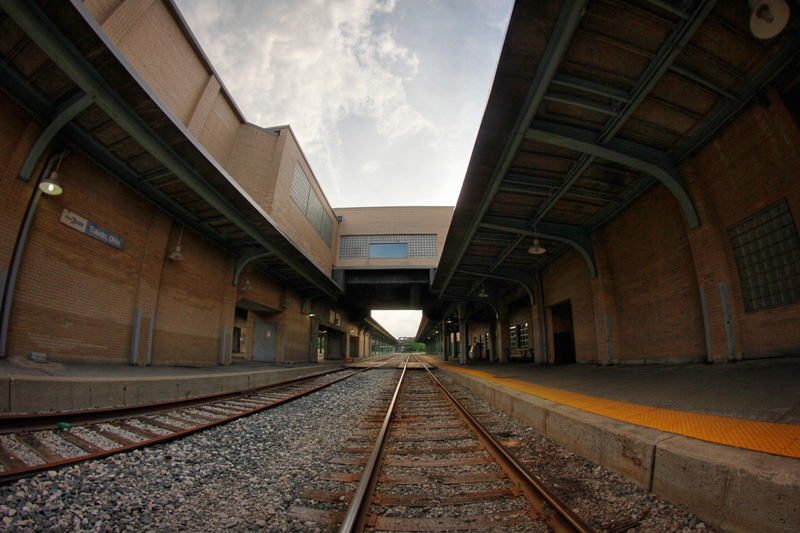 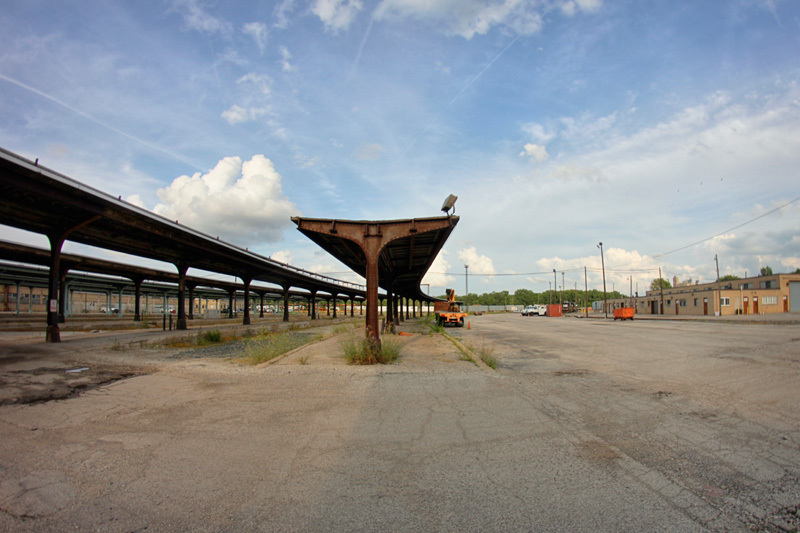 Toledo may be Ohio’s busiest railroad station, but from some angles it looks quite abandoned. 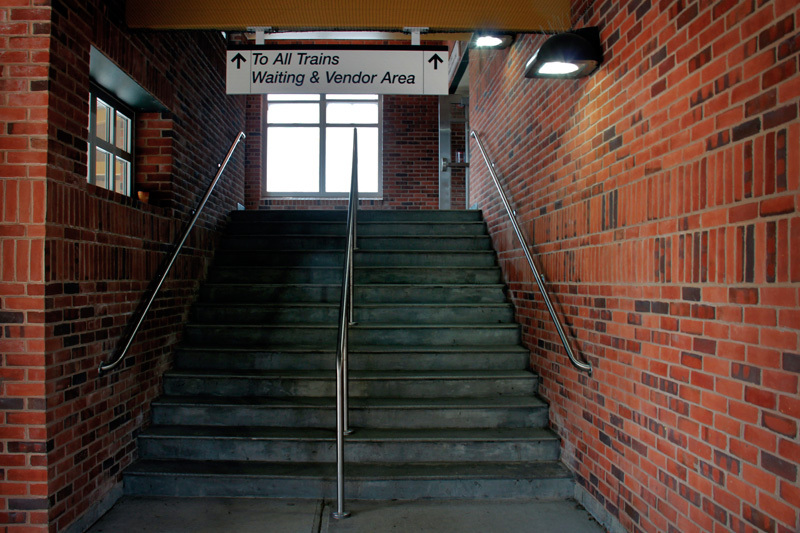 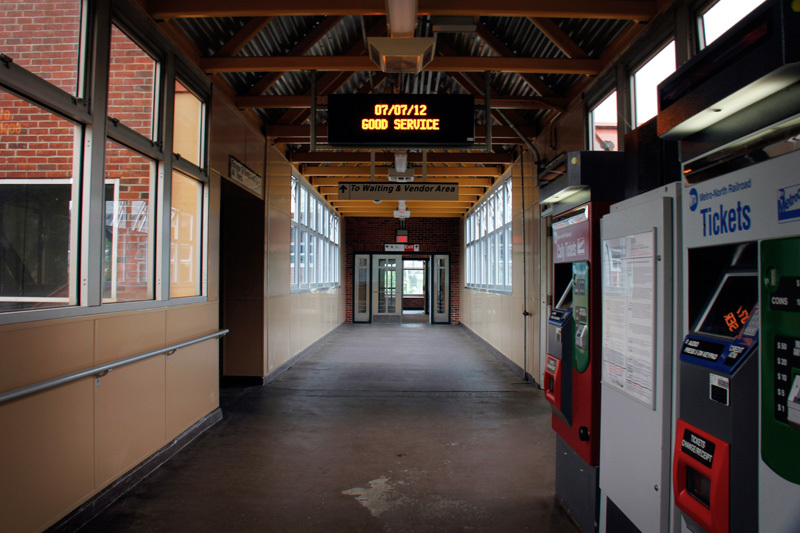 The old passageway to the platforms can now hold quite a few chairs… note the doors on either side that led to the island train platforms below. More photos of the event space in the station can be found here. 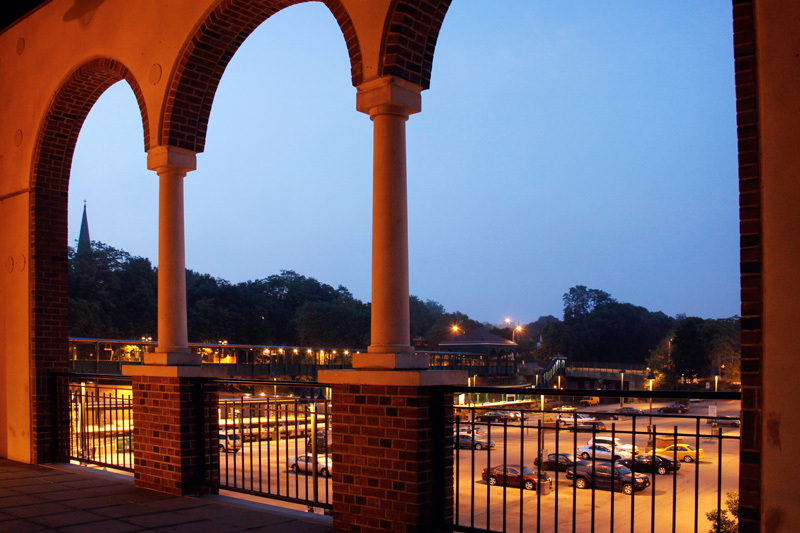 Martin Luther King, Jr. Plaza, as it is called now, is served by Amtrak’s Lake Shore Limited, and Capitol Limited. 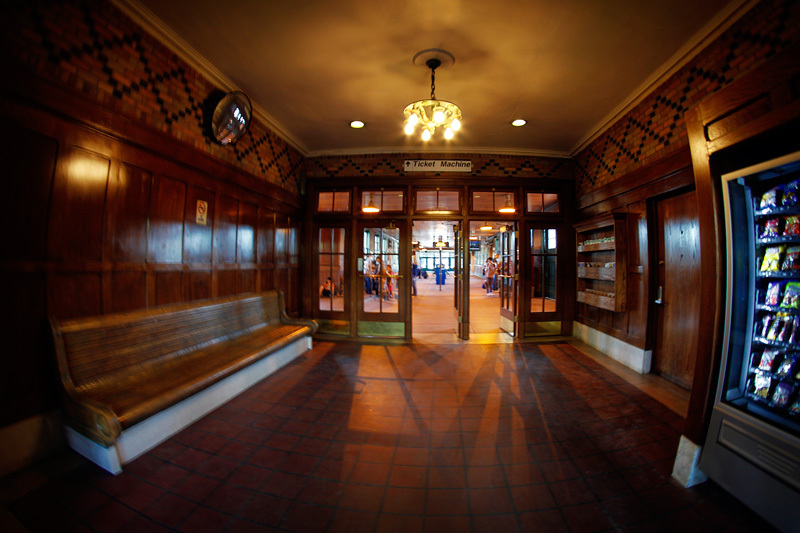 With trains arriving at the station during hours many are asleep (11:39 PM, 2:50 AM, 5:22 AM and 6:15 AM), the station functions on opposite schedule – the waiting room is open most night hours, and closed during the day. 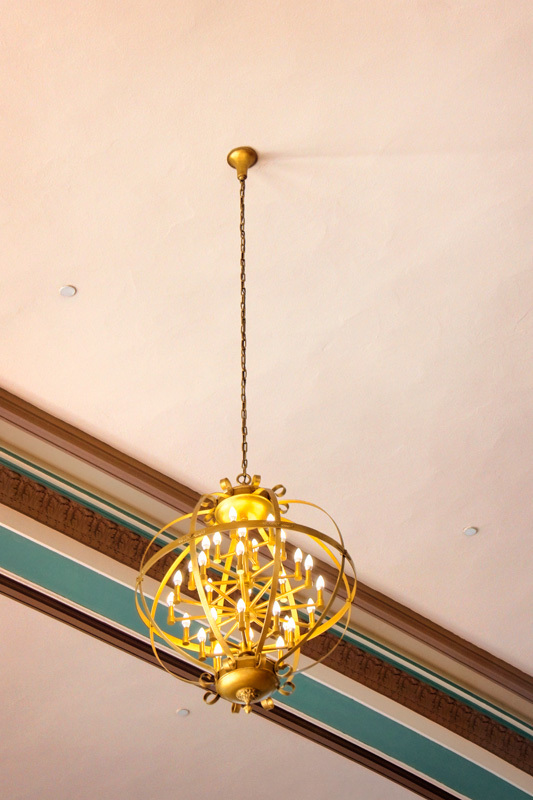 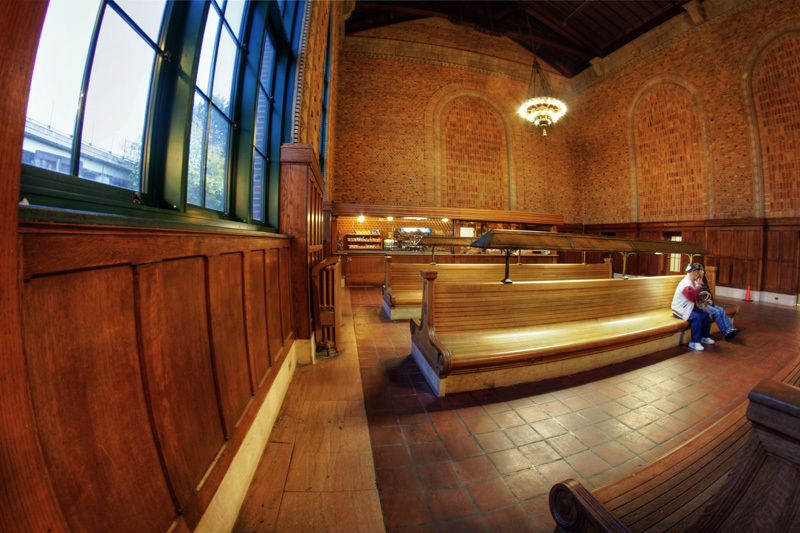 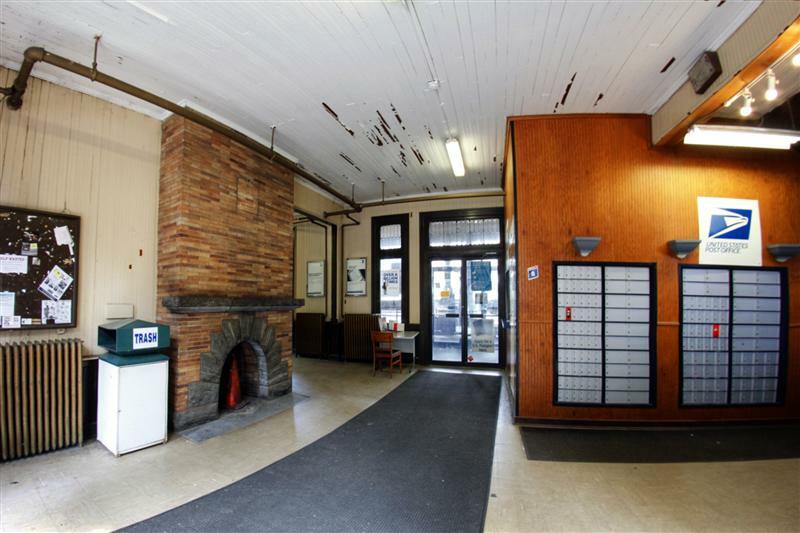 Though the waiting rooms for the trains were once in a more attractive spot on the third floor, during renovations the waiting area was relegated to the bottom floor. 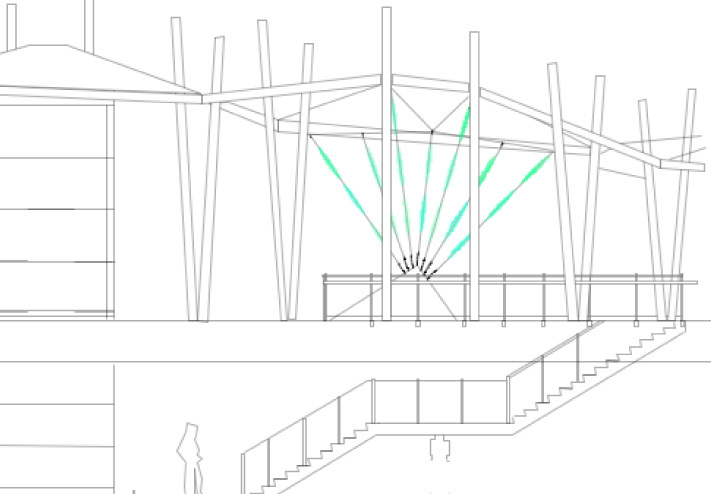 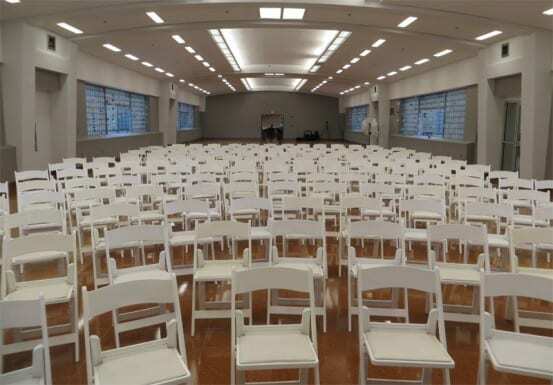 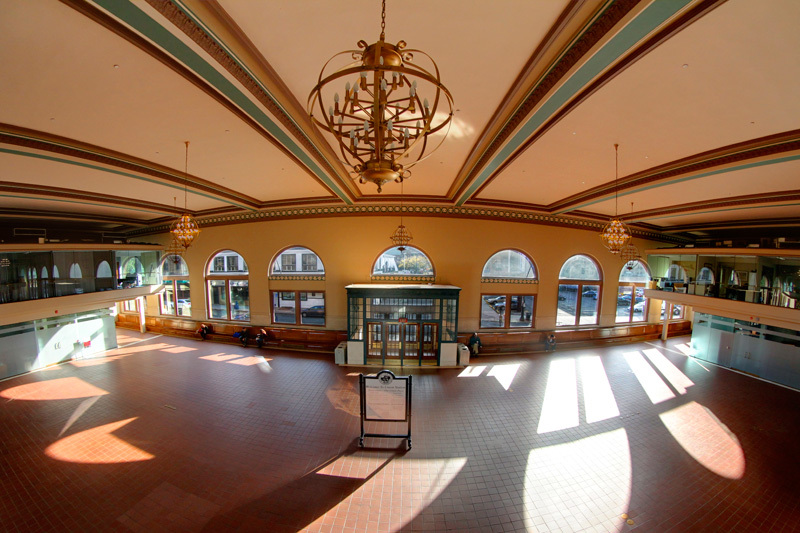 The former waiting area on the third floor is now an event space able to hold 650 people… so in reality, this station is pretty cool – if you’re looking to host a wedding reception.